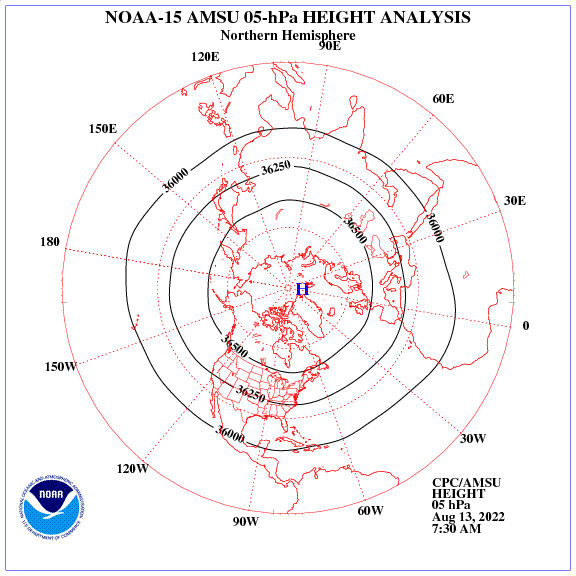 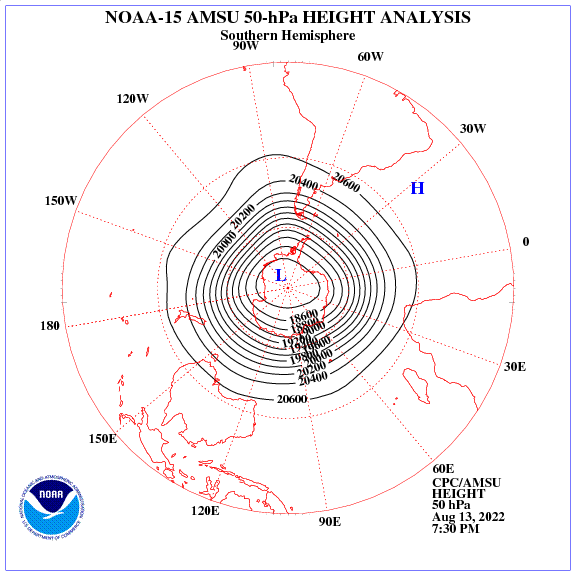 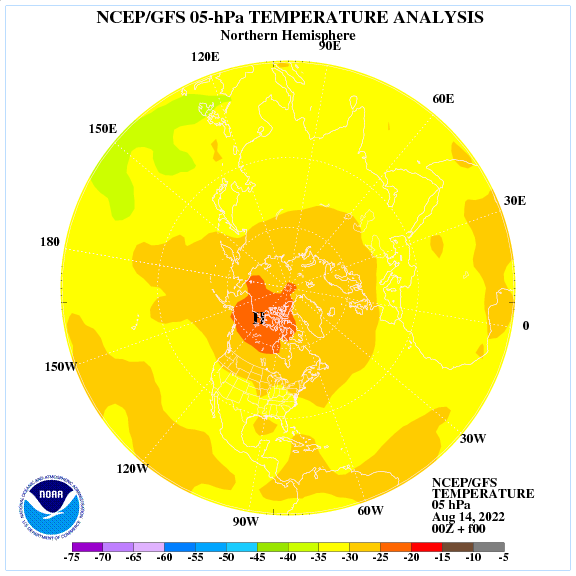 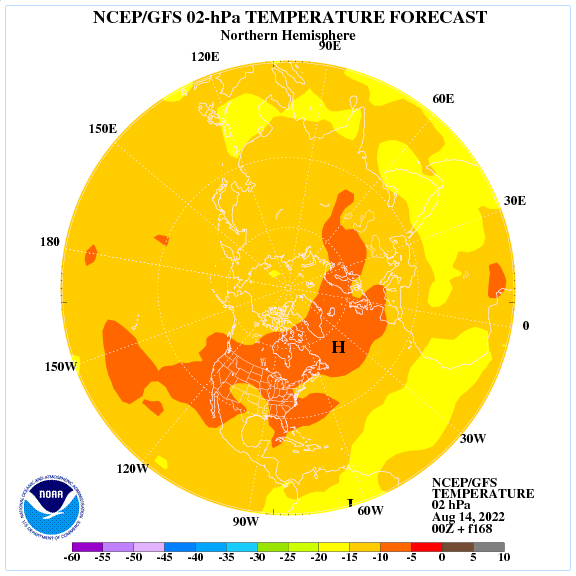 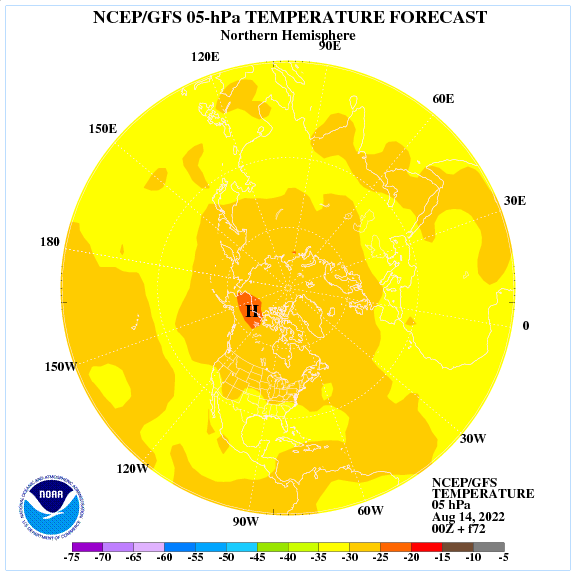 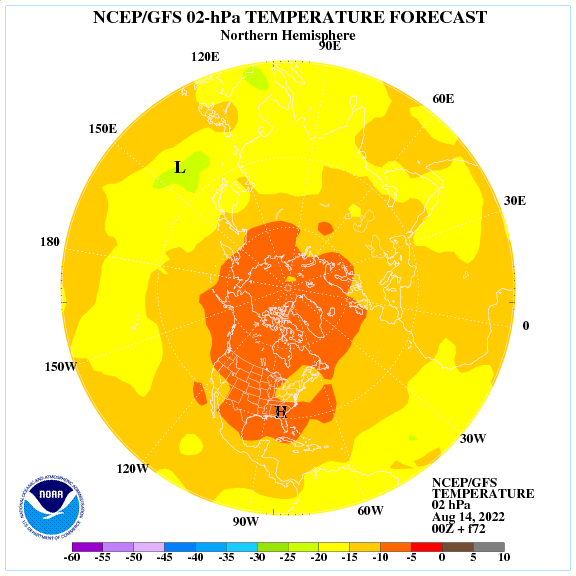 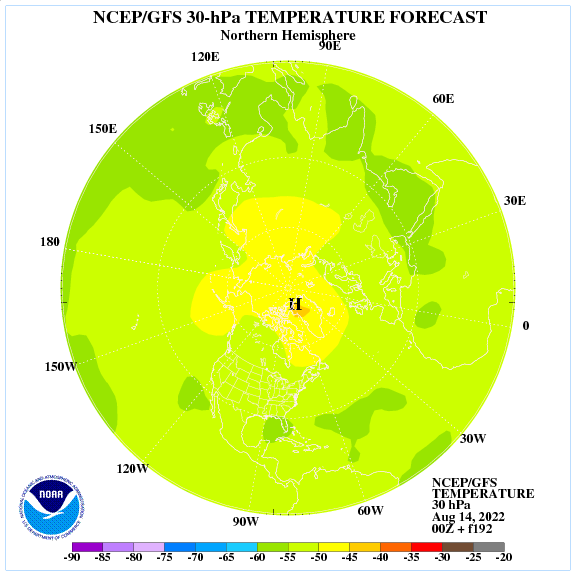 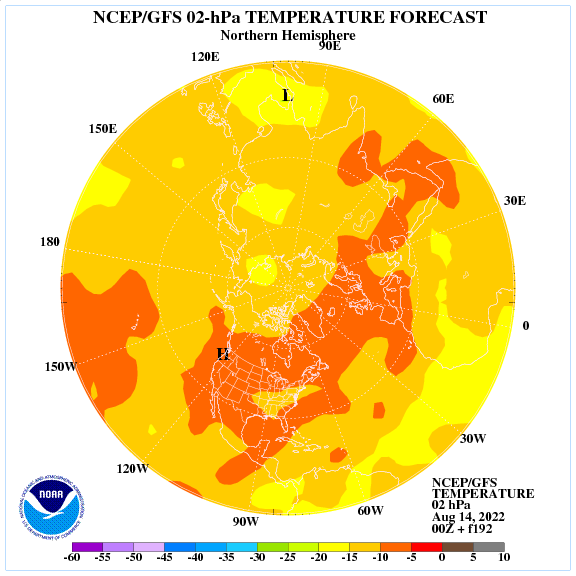 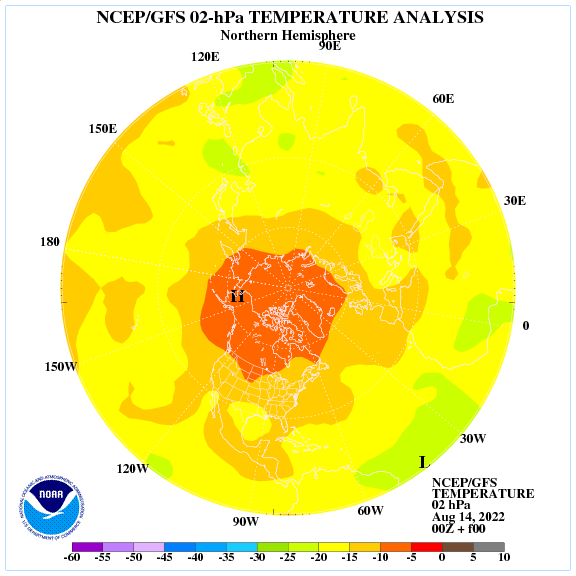 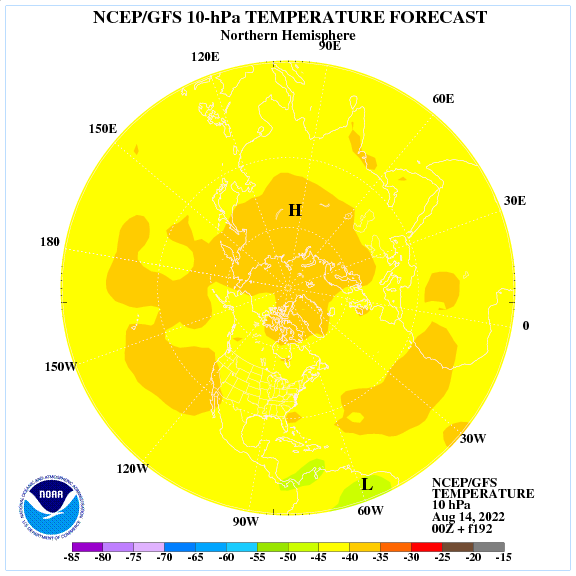 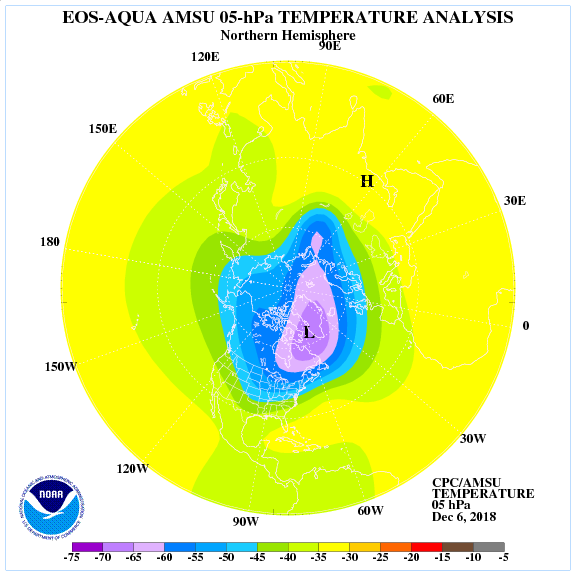 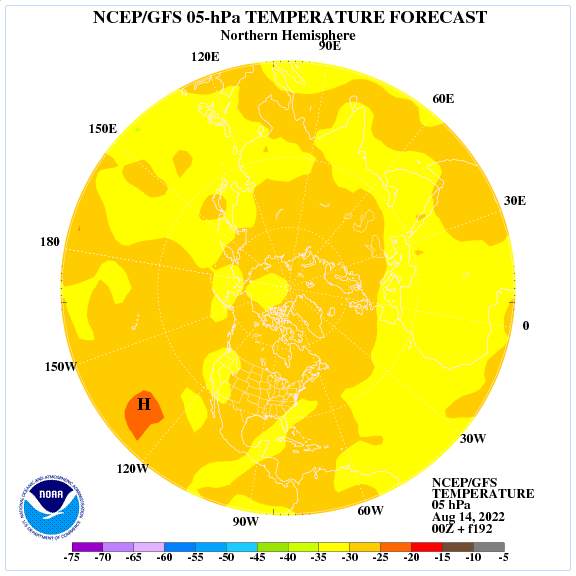 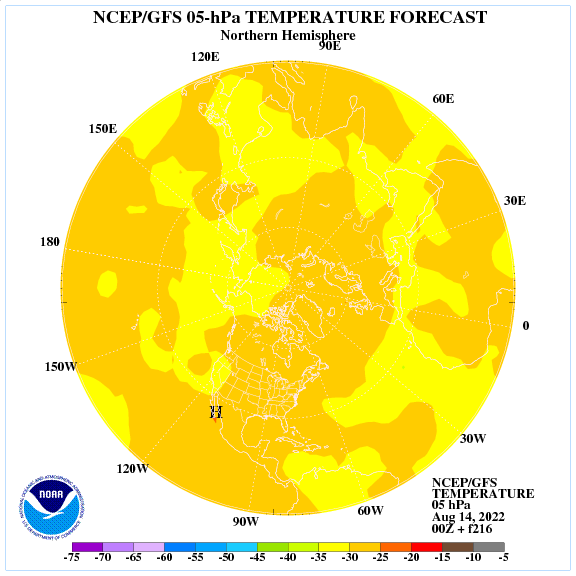 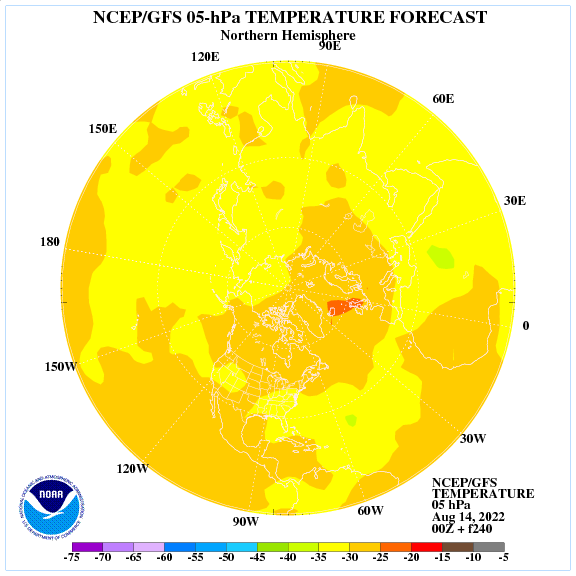 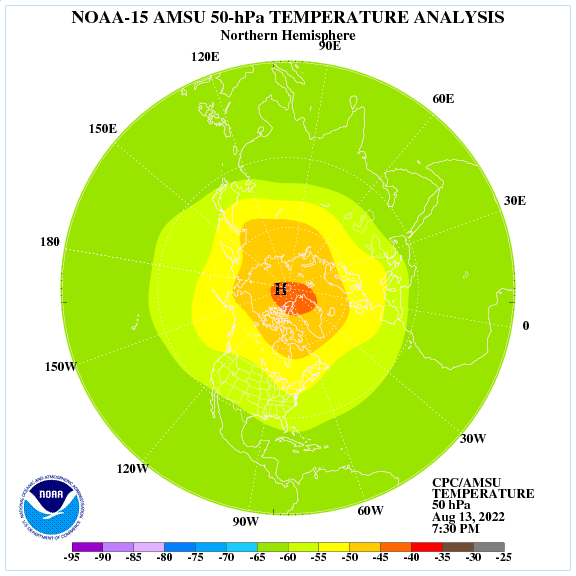 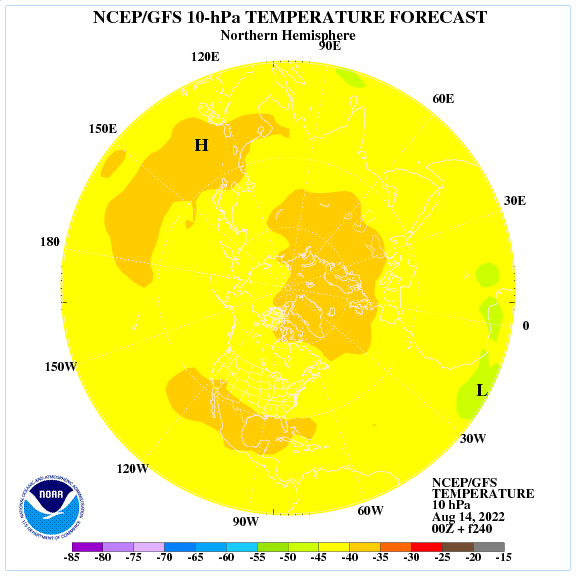 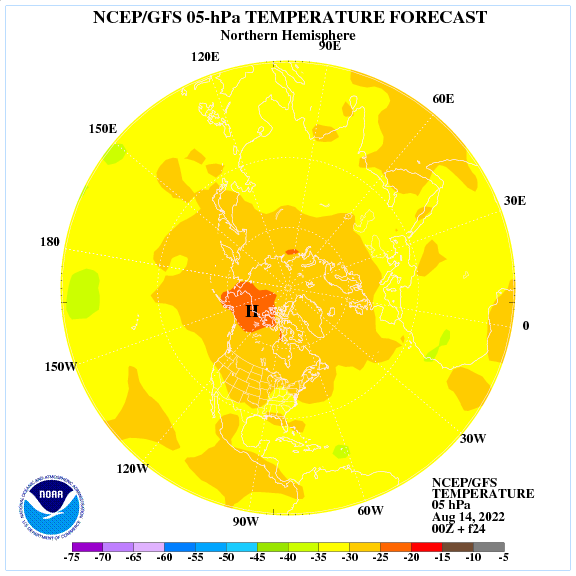 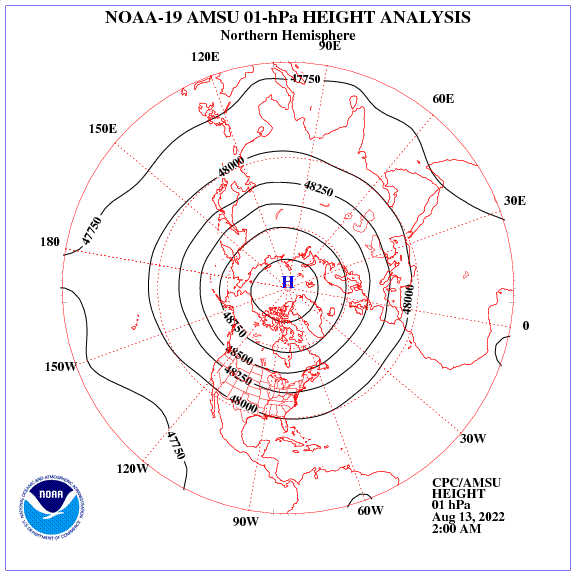 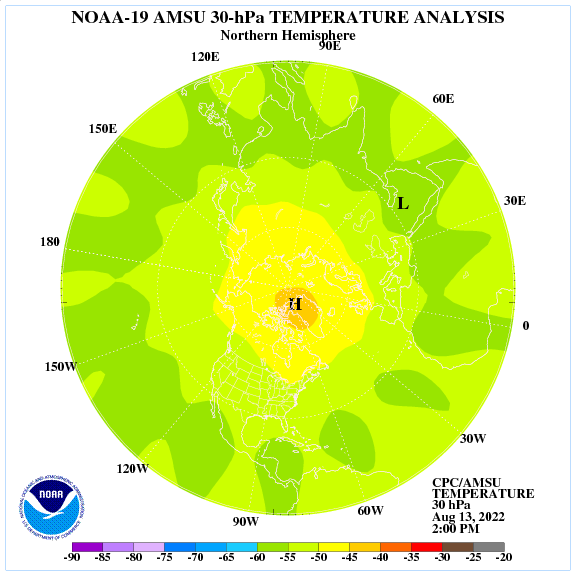 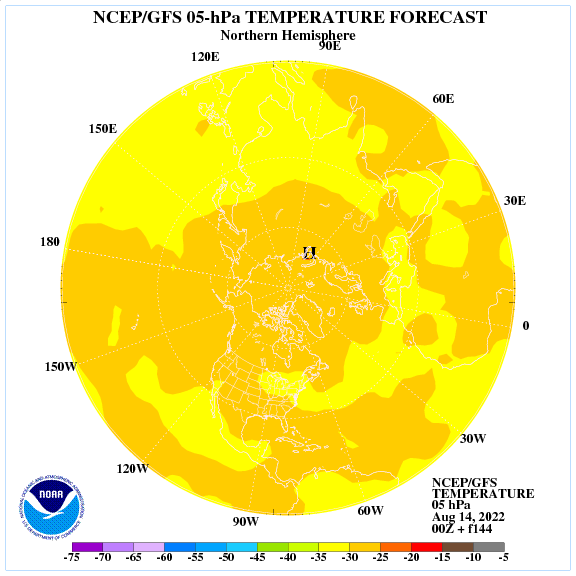 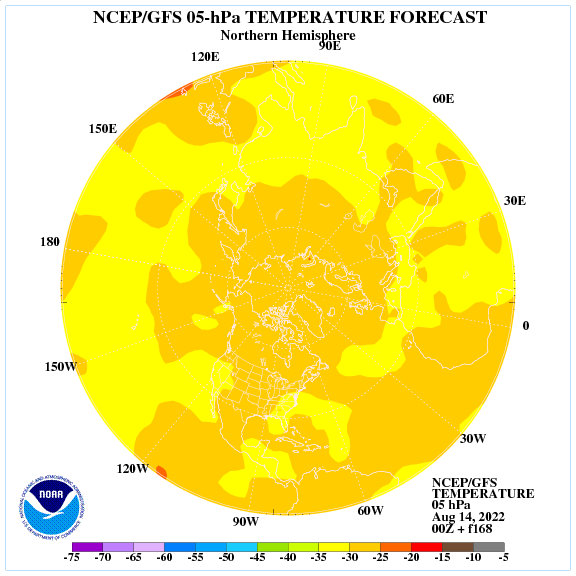 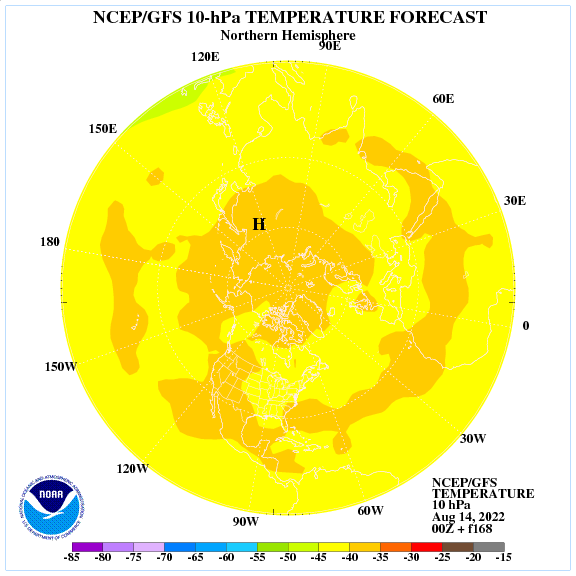 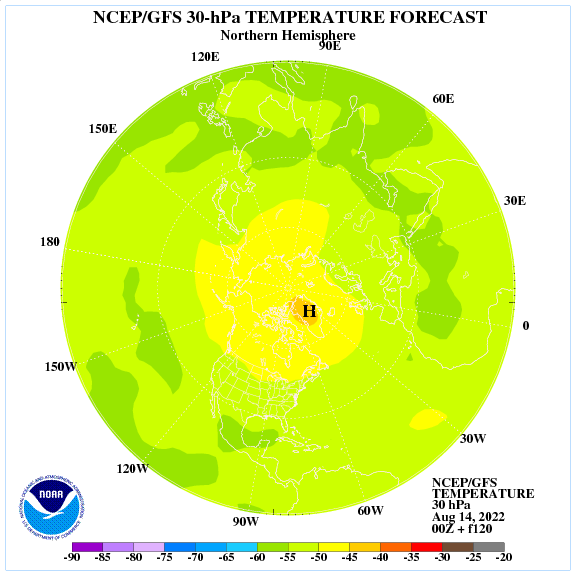 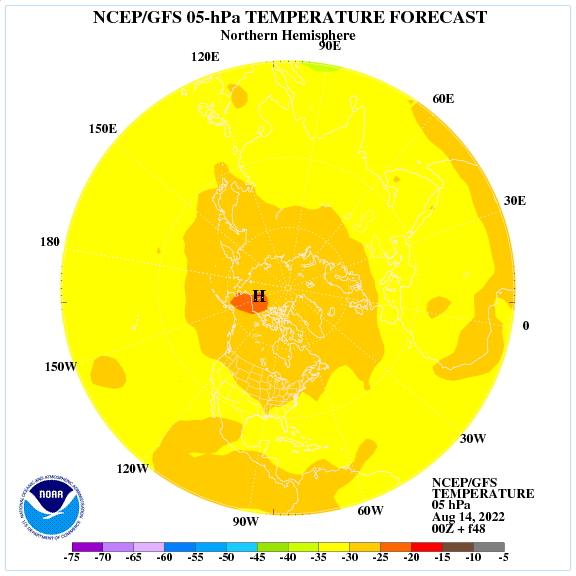 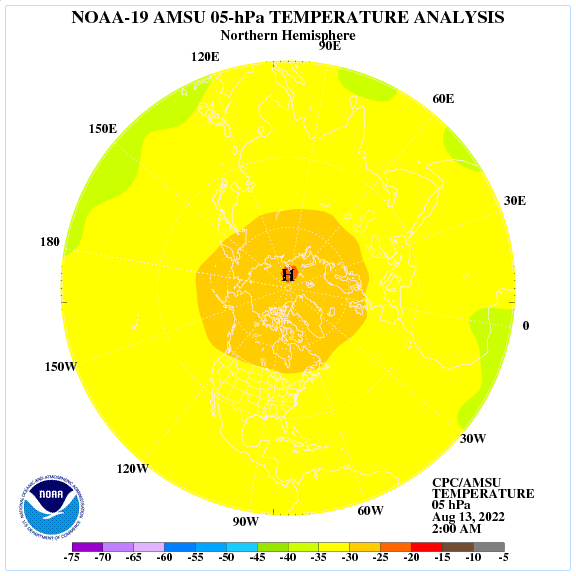 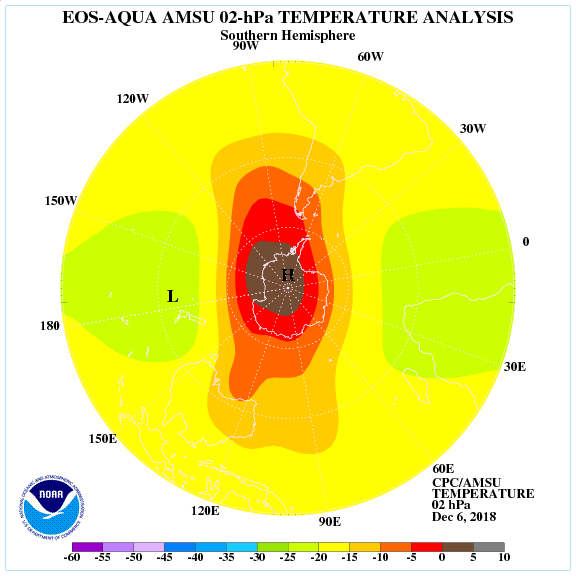 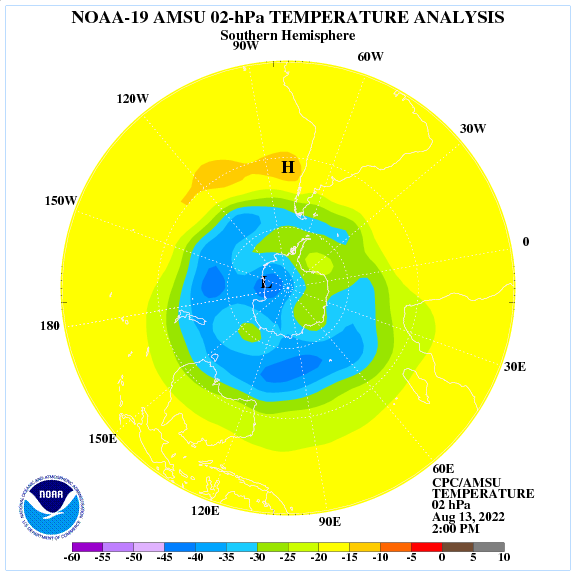 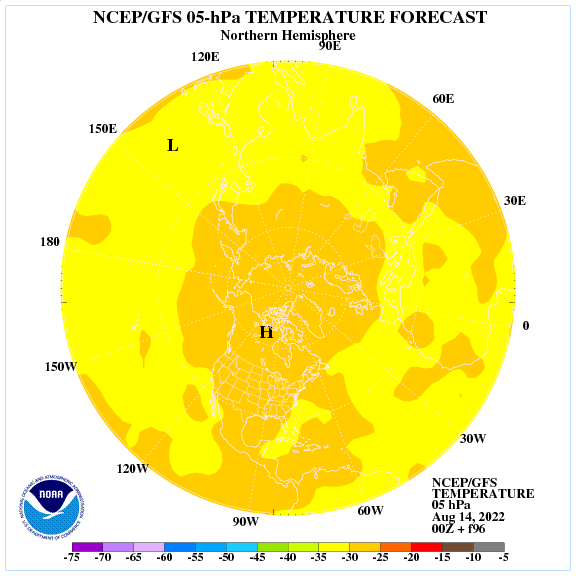 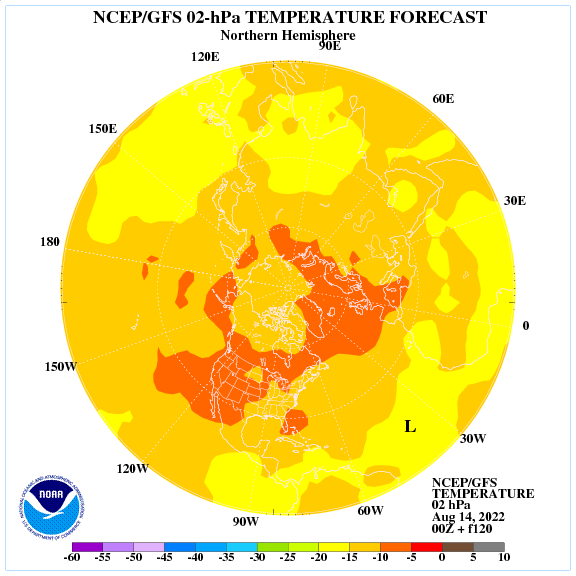 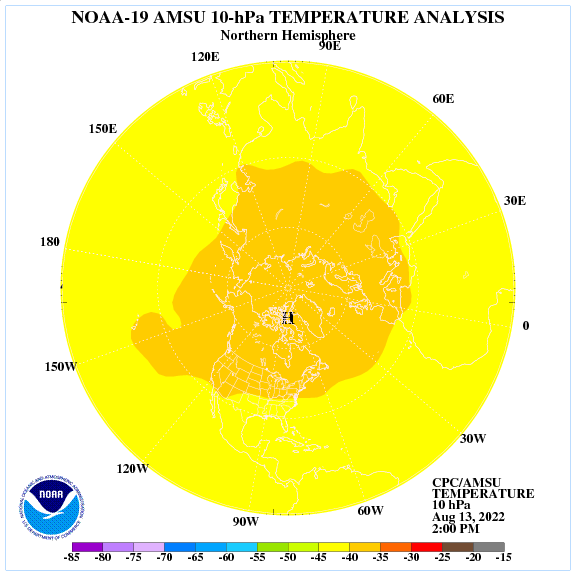 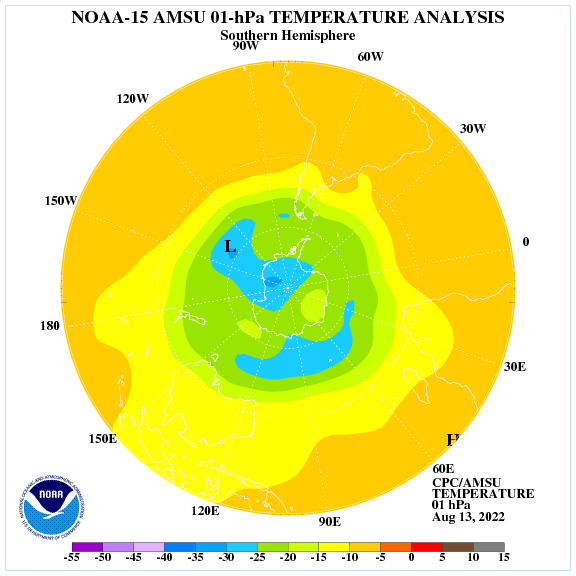 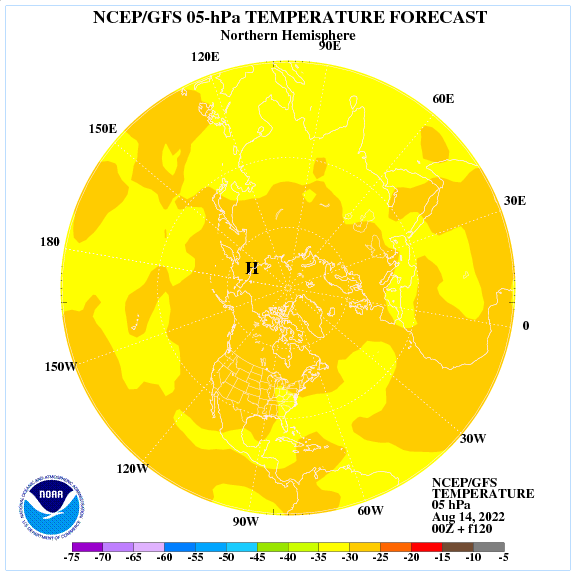 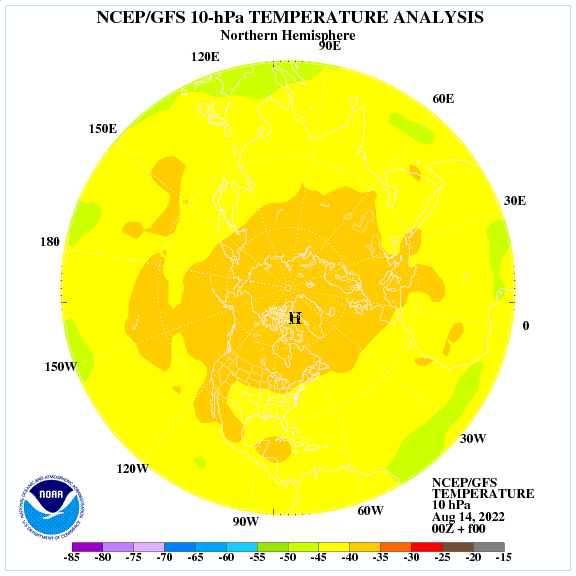 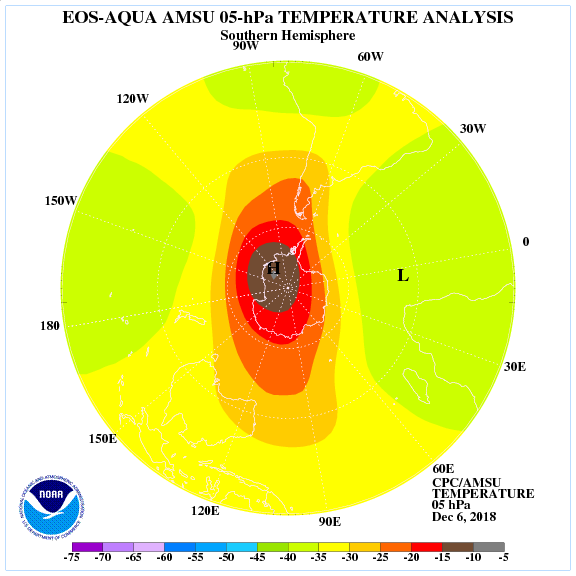 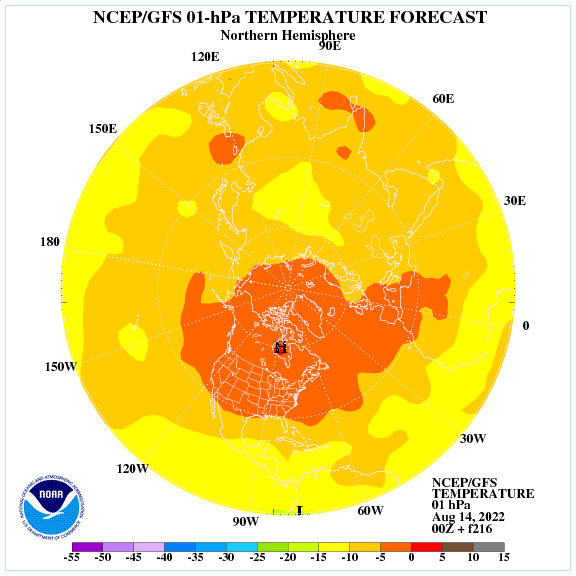 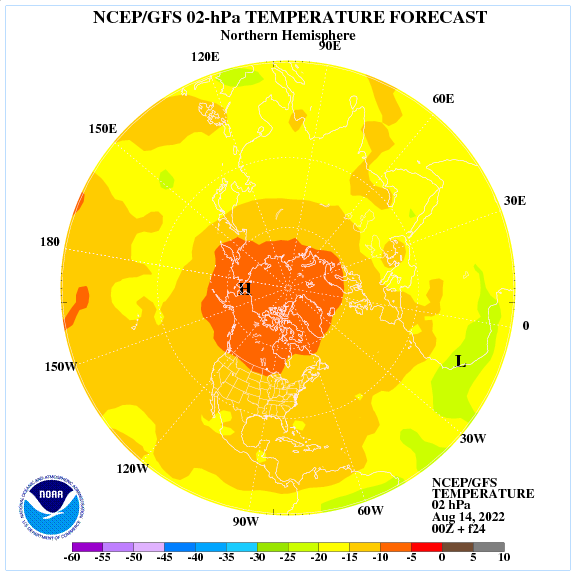 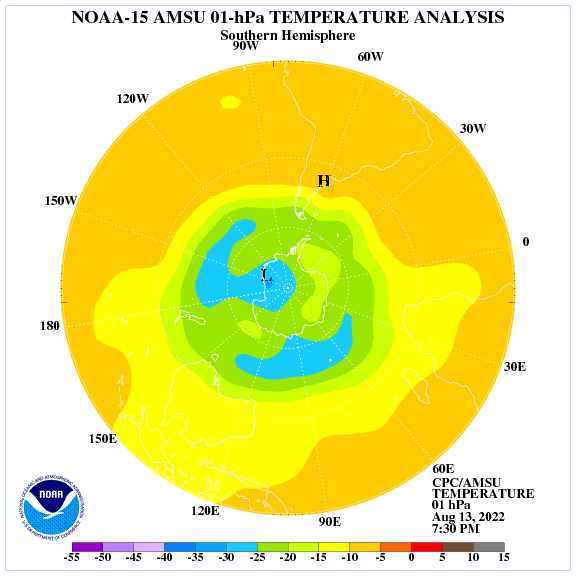 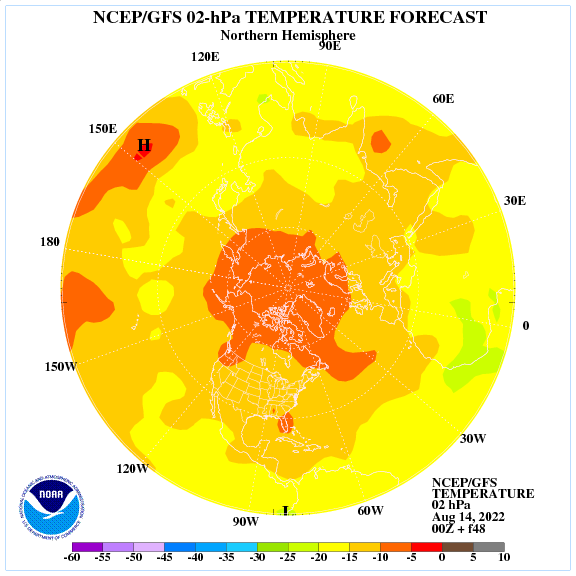 The NCEP/Climate Prediction Center (CPC) analyzes the temperatures derived from NESDIS retrieval soundings of the Advanced Microwave Sounding Unit (AMSU) on board the NOAA Polar Orbiting Environmental Satellites. 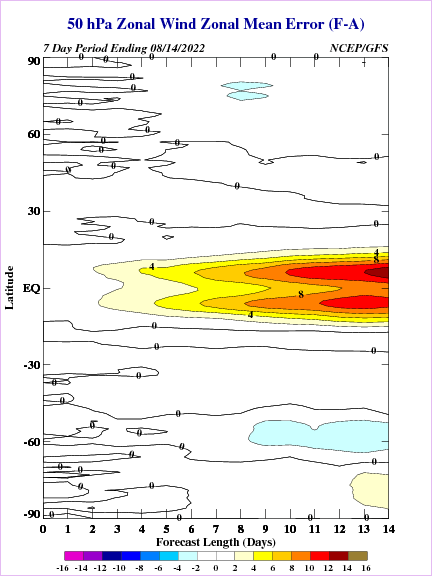 The retrievals are separated by the orbital node of the spacecraft (ascending and descending). The AMSU views the earth along each orbit at the same local time. 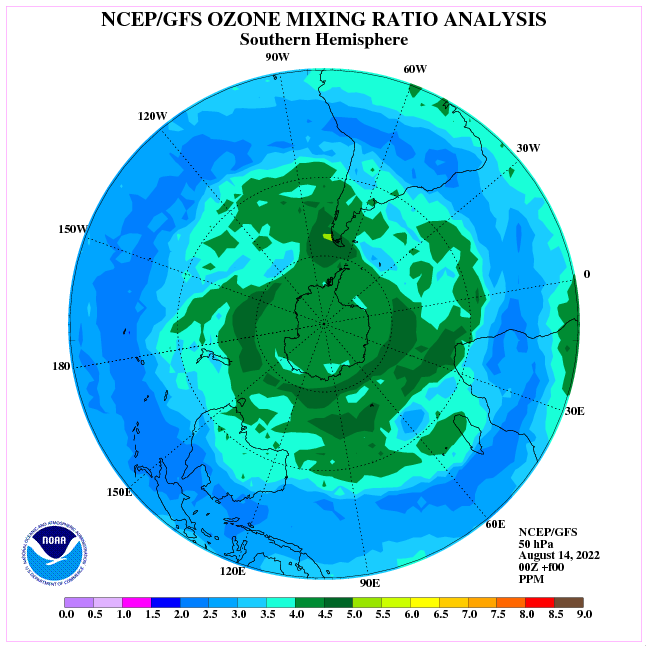 NOAA 15 ascending orbit retrievals results in a 7:30 PM analysis, and the descending orbits' retrievals results in a 7:30 AM analysis. 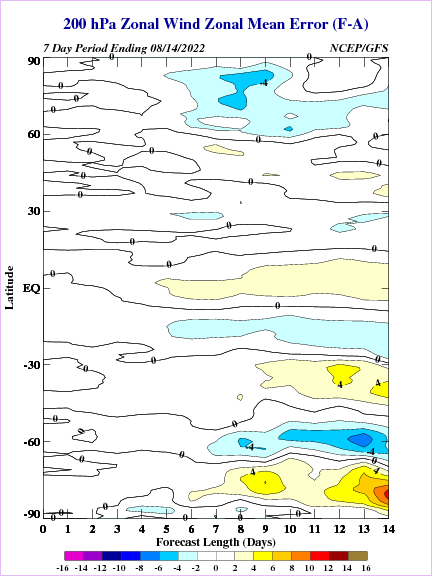 NOAA 16 ascending orbit retrievals results in a 2:00 PM anaysis, and the descending orbits' retrievals results in a 2:00 AM analysis. 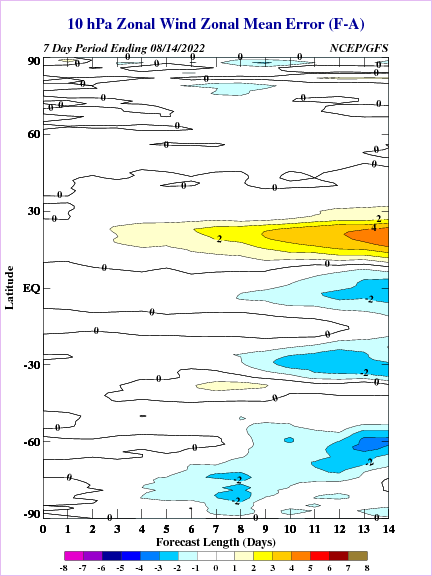 NOAA 17 ascending orbit retrievals results in a 10:00 PM anaysis, and the descending orbits' retrievals results in a 10:00 AM analysis. 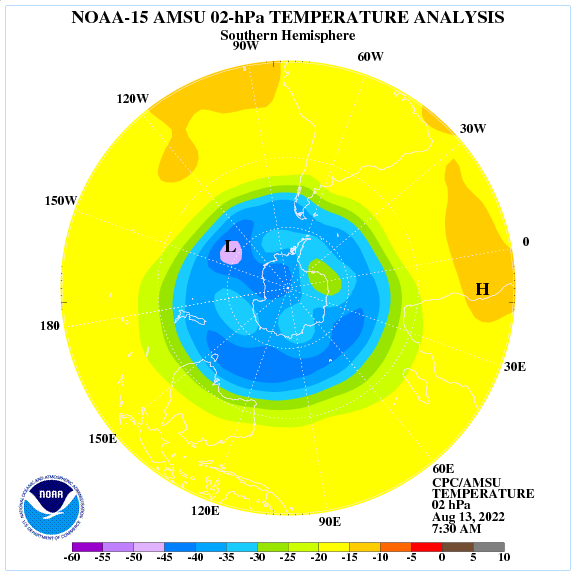 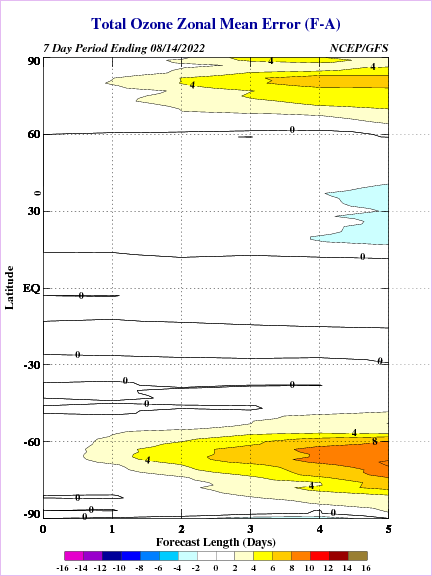 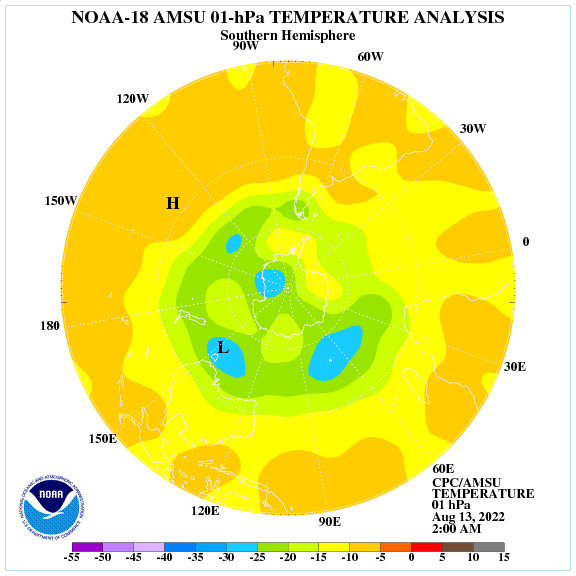 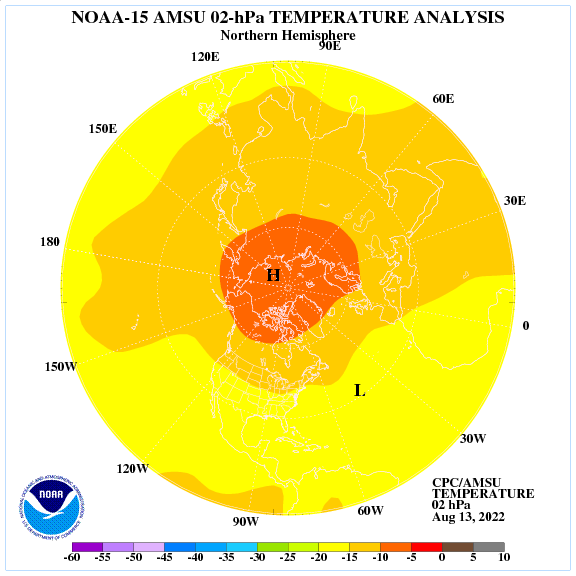 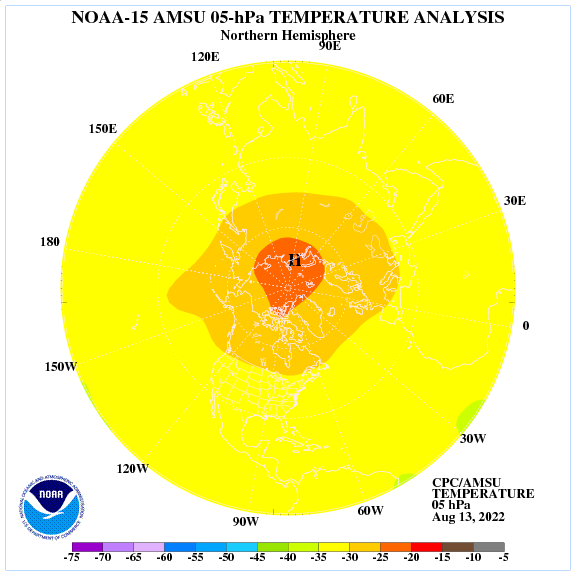 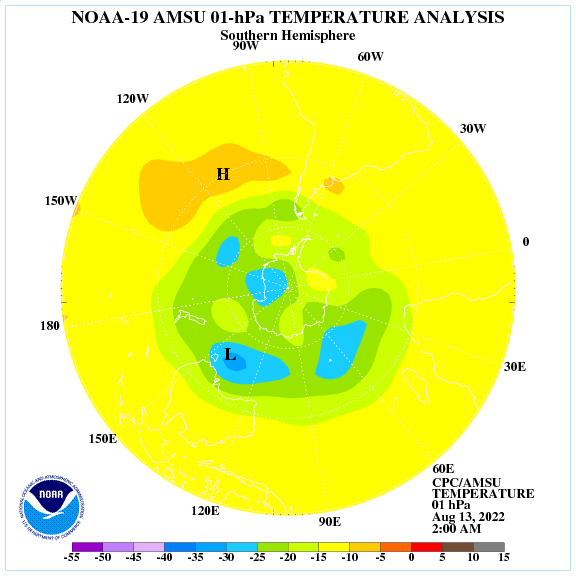 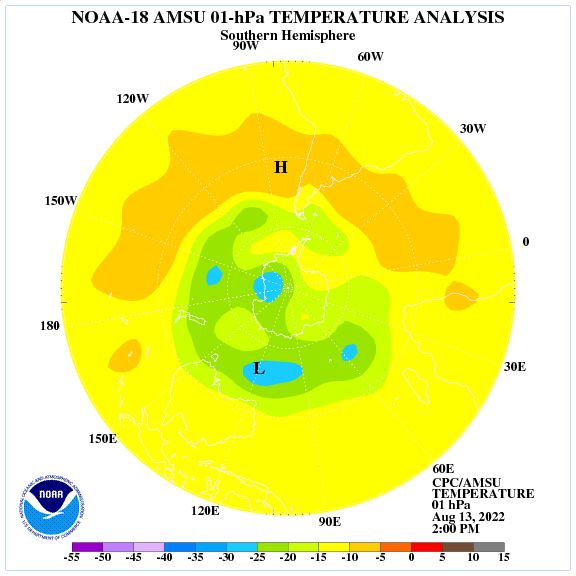 The temperature analyses are based solely upon the satellite retrievals. 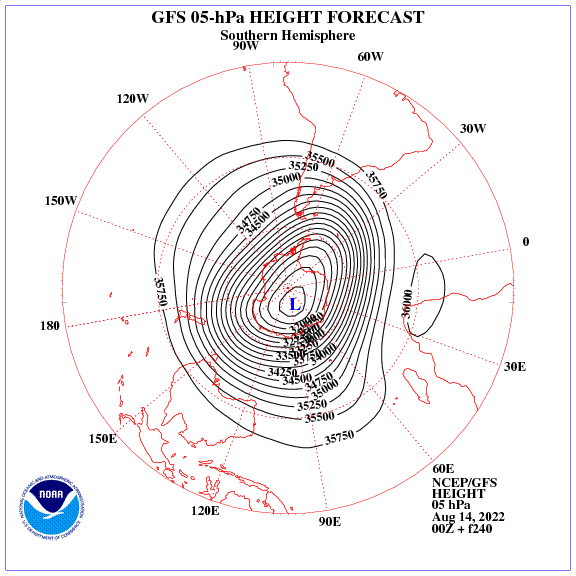 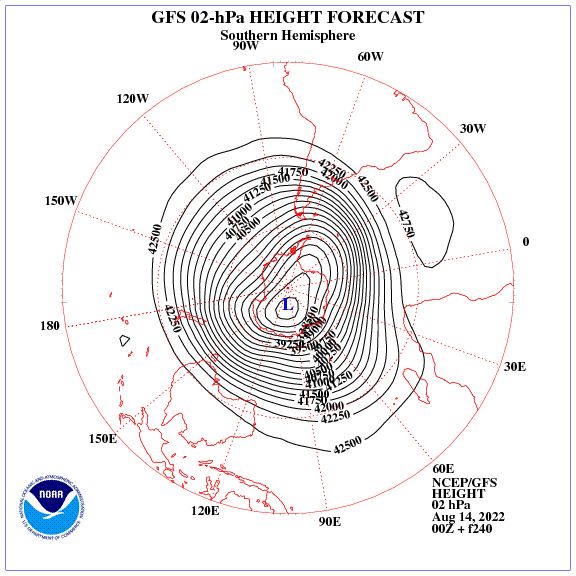 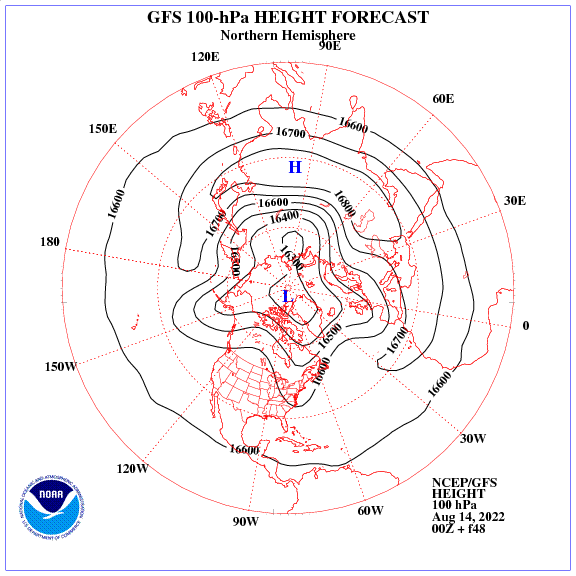 The height analyses are derived hydrostatically from the temperatures from a base-level (100 hPa) from the NCEP Global Forecast System (GFS, formally AVN) model. 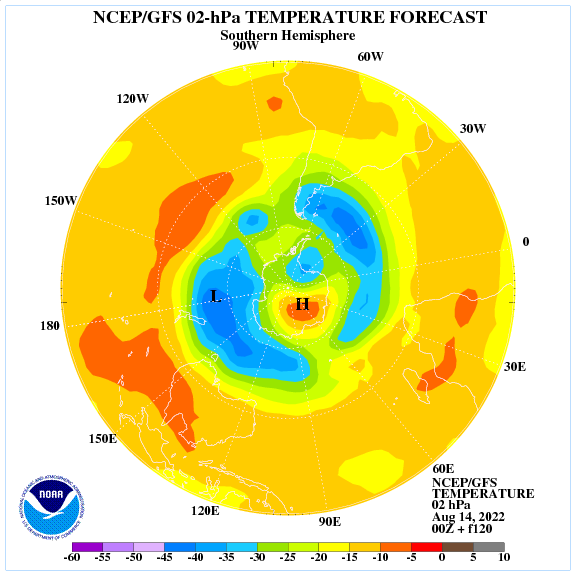 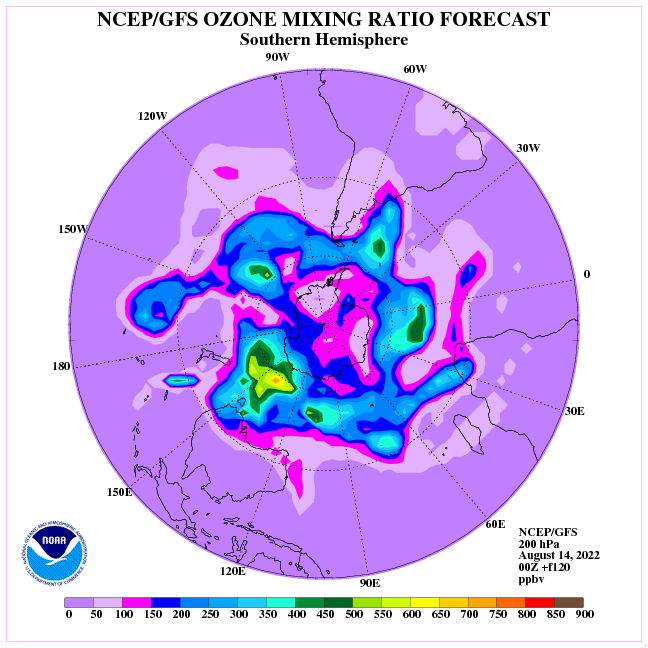 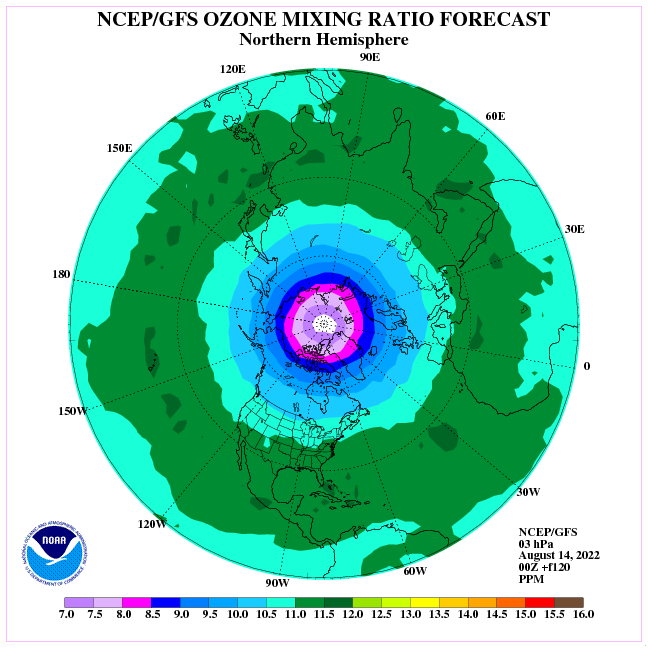 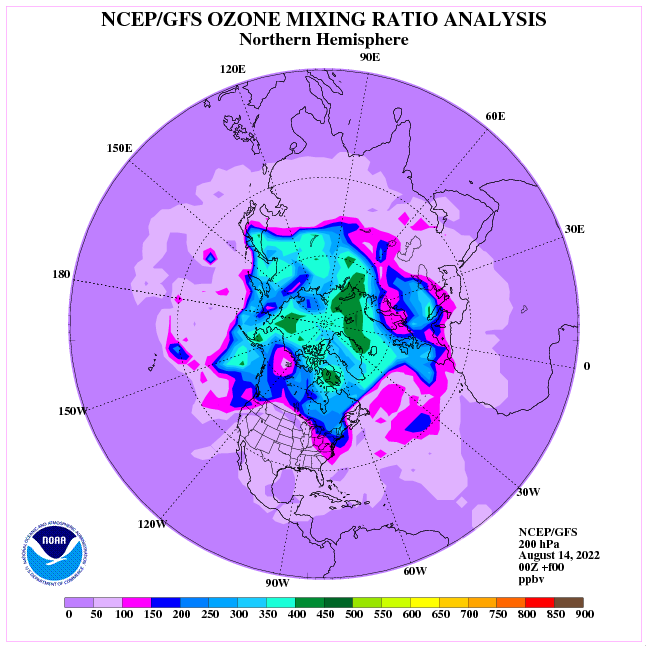 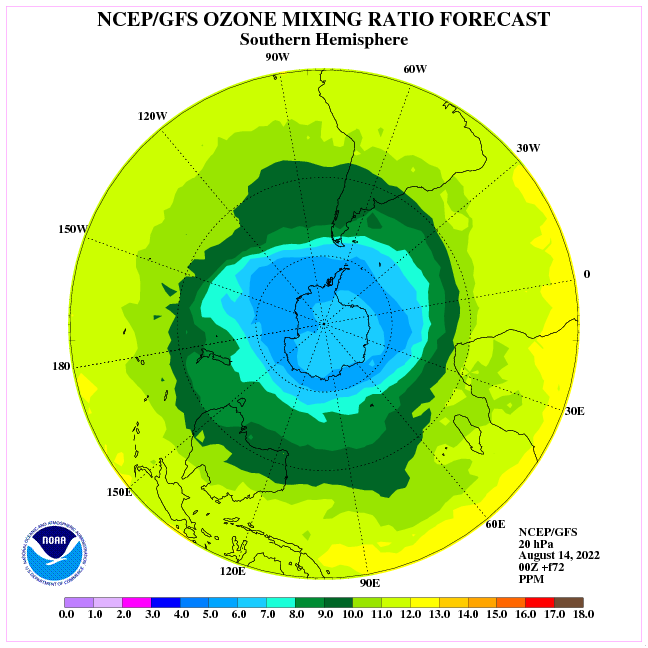 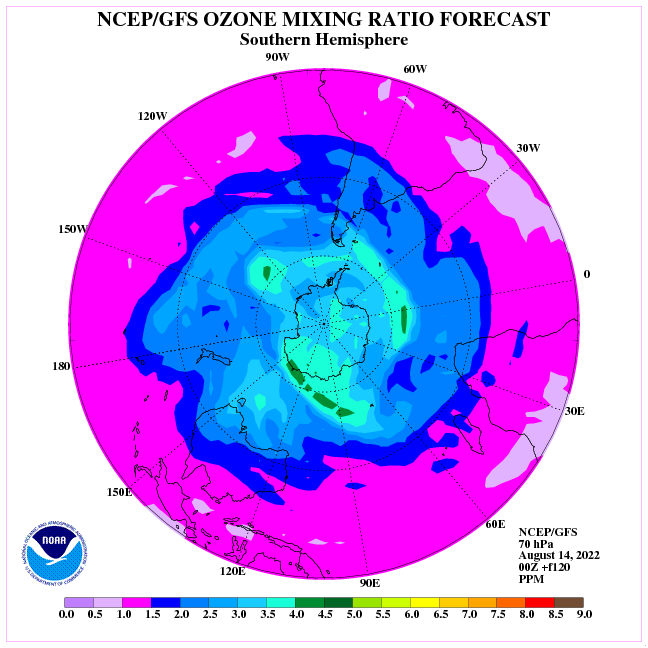 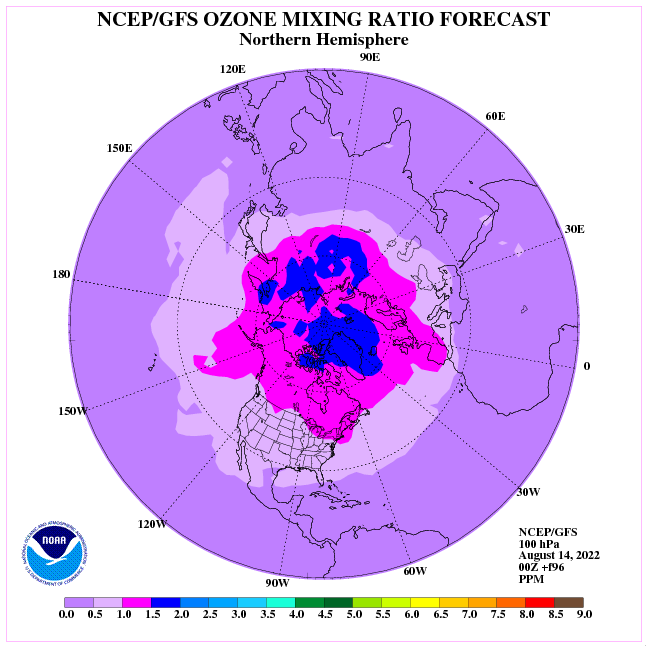 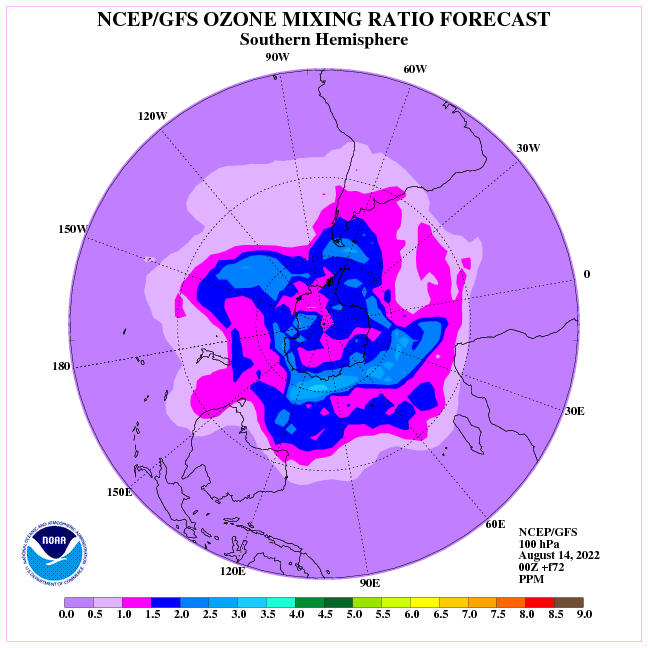 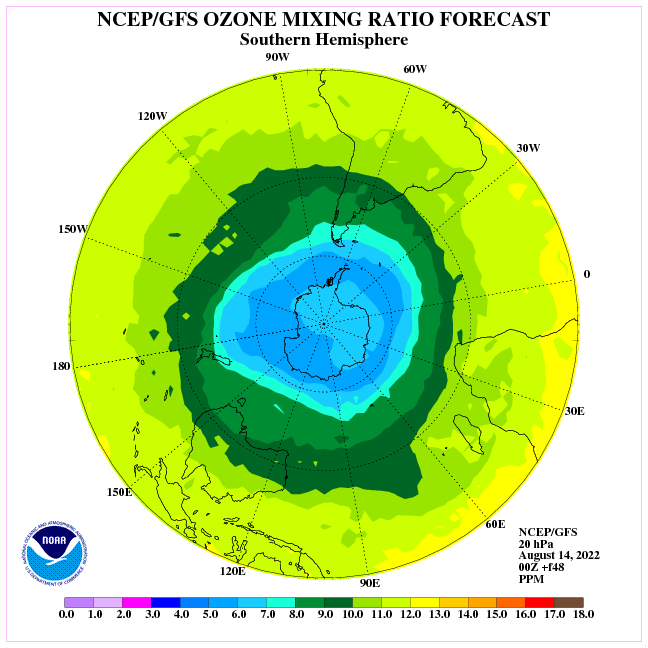 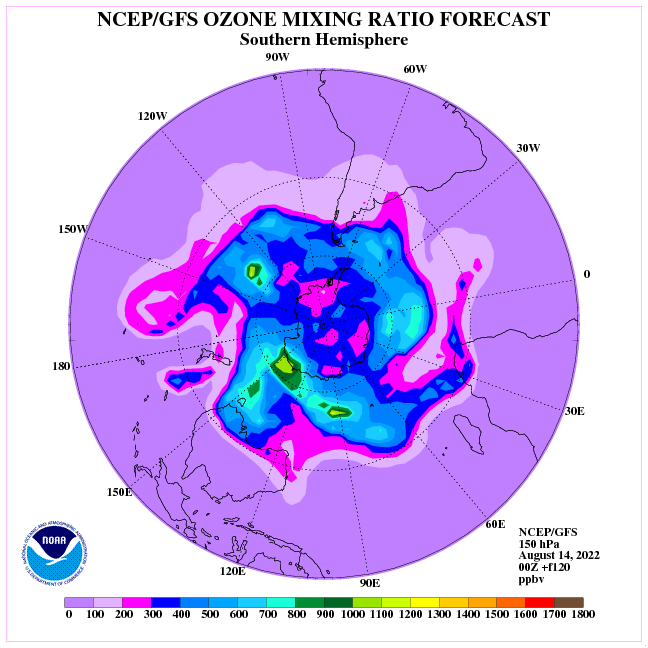 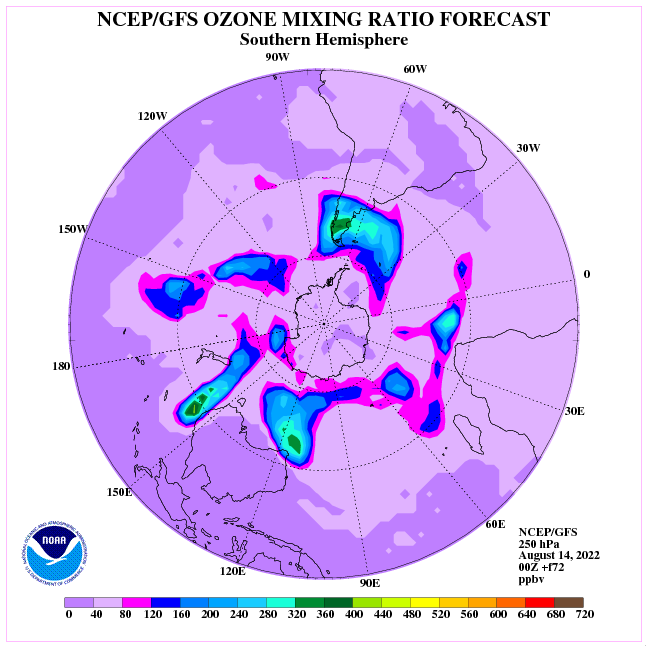 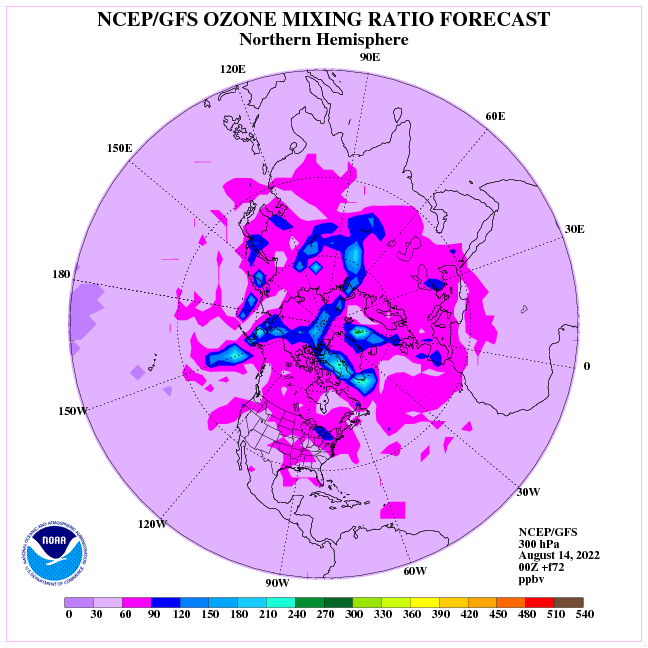 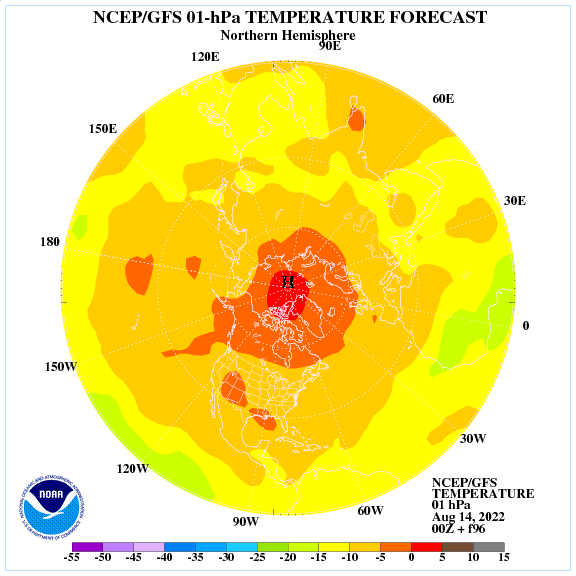 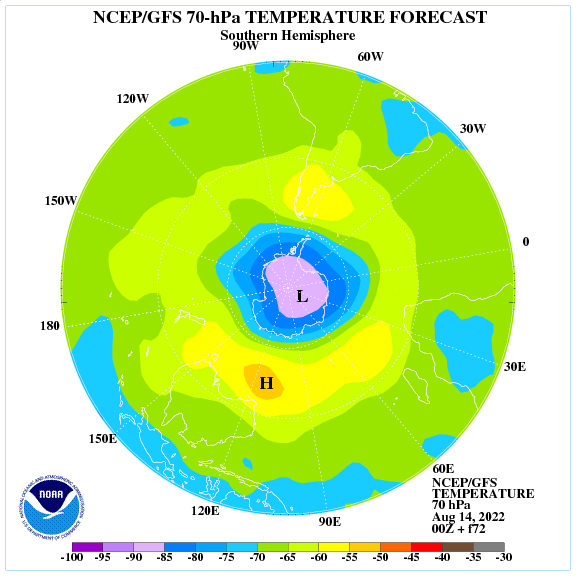 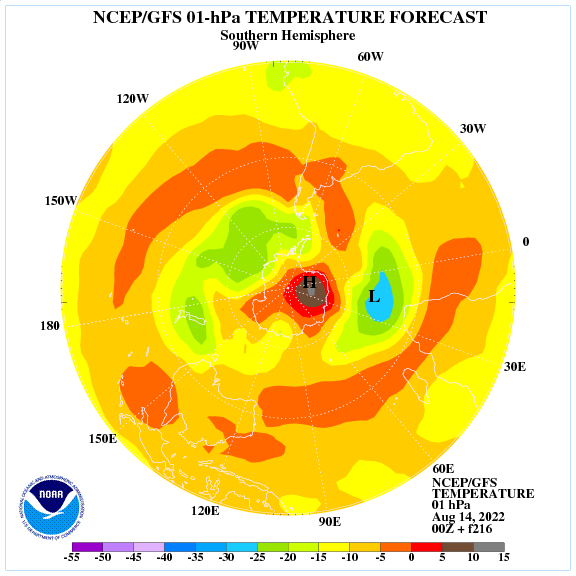 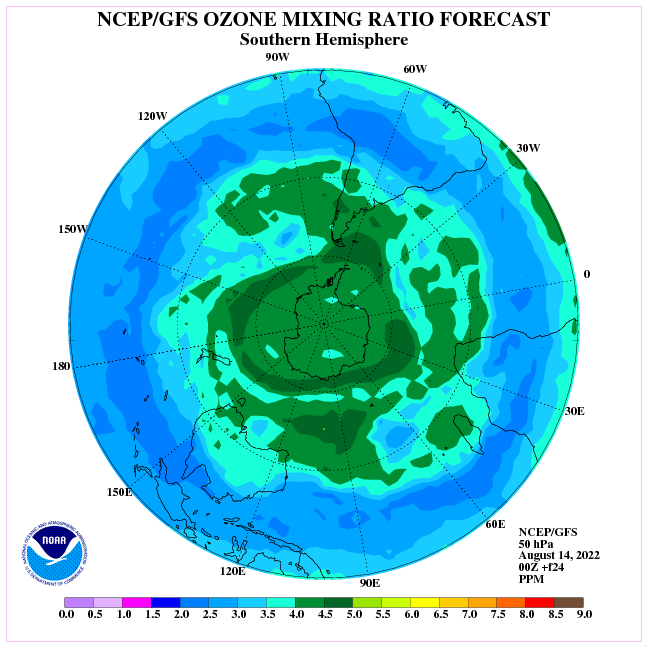 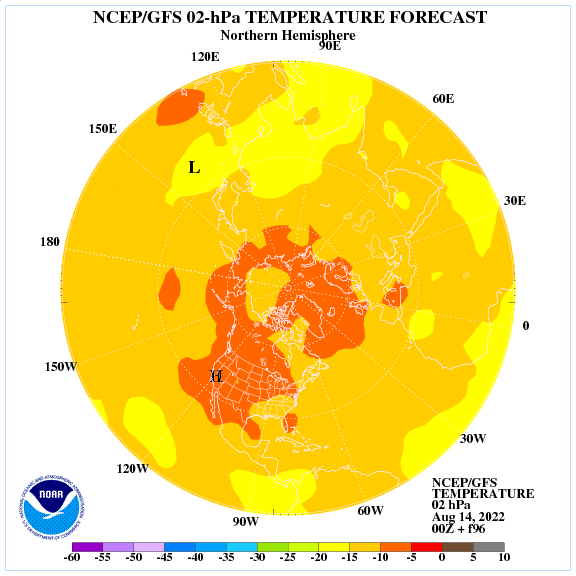 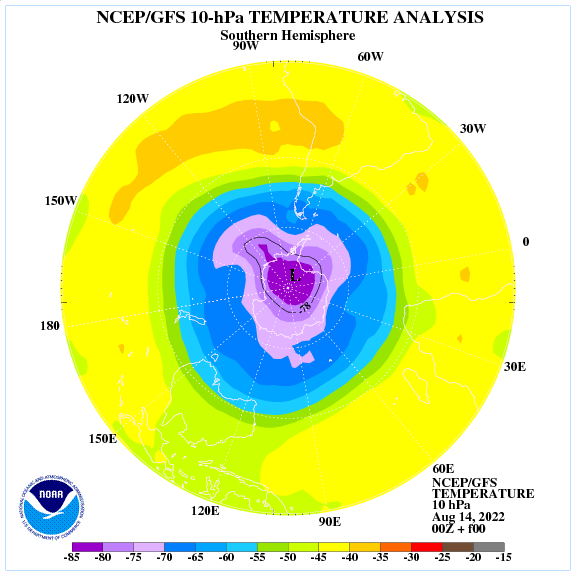 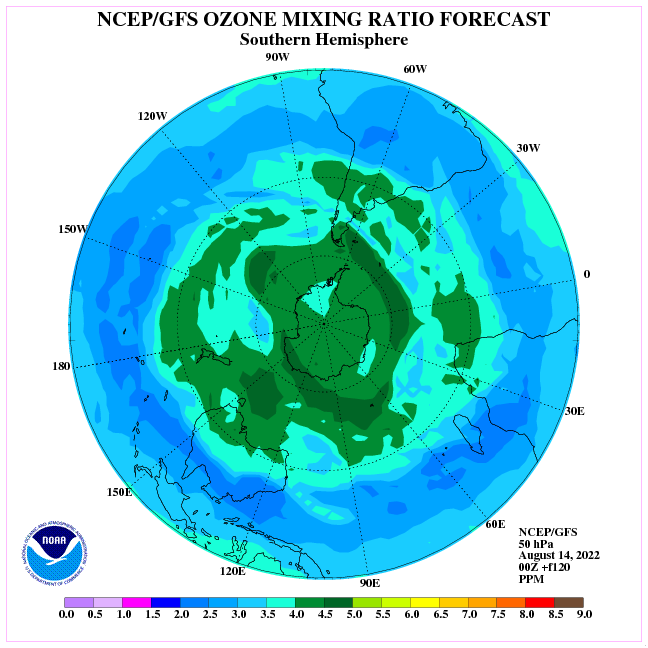 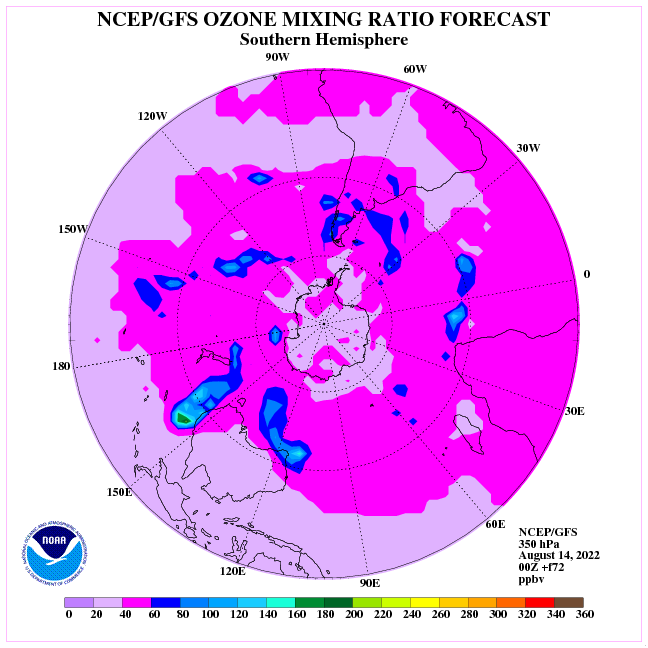 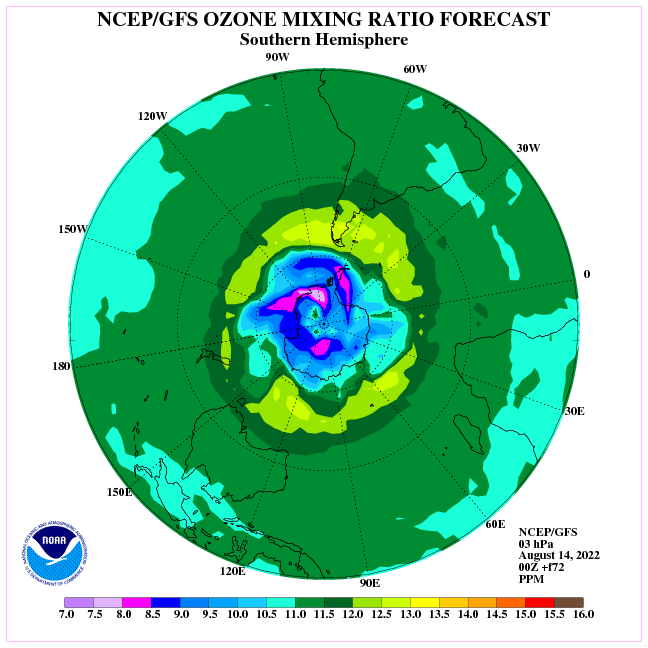 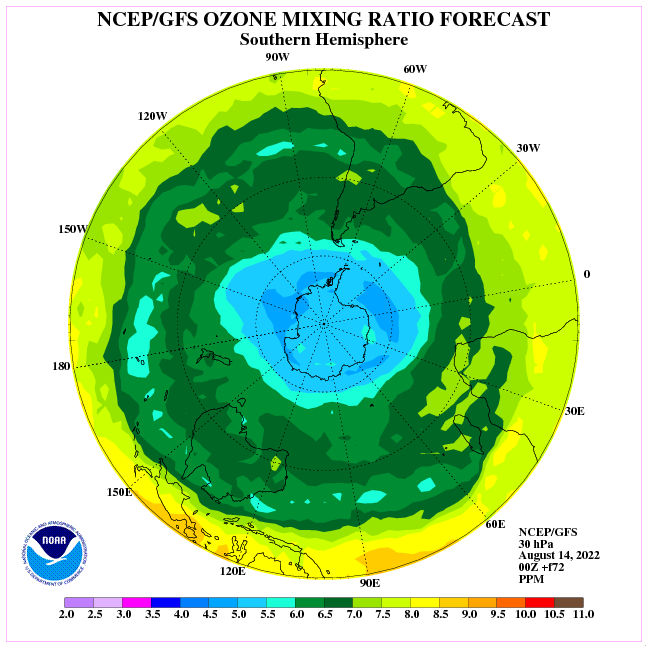 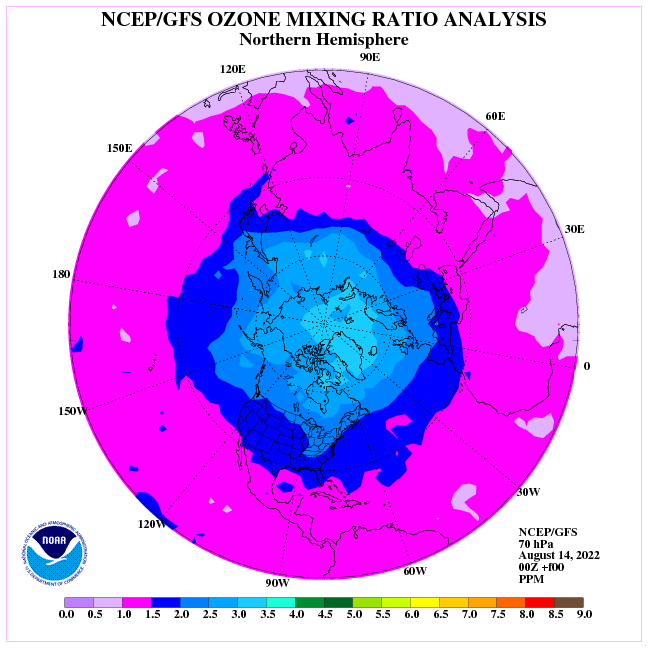 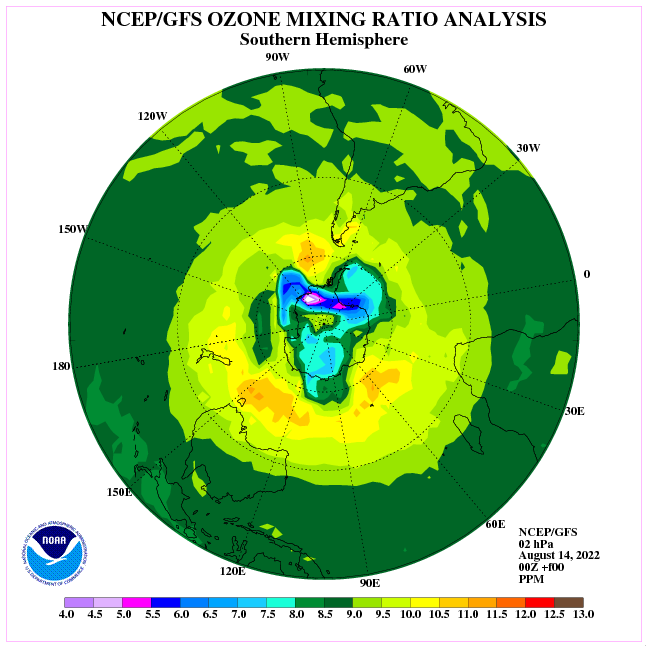 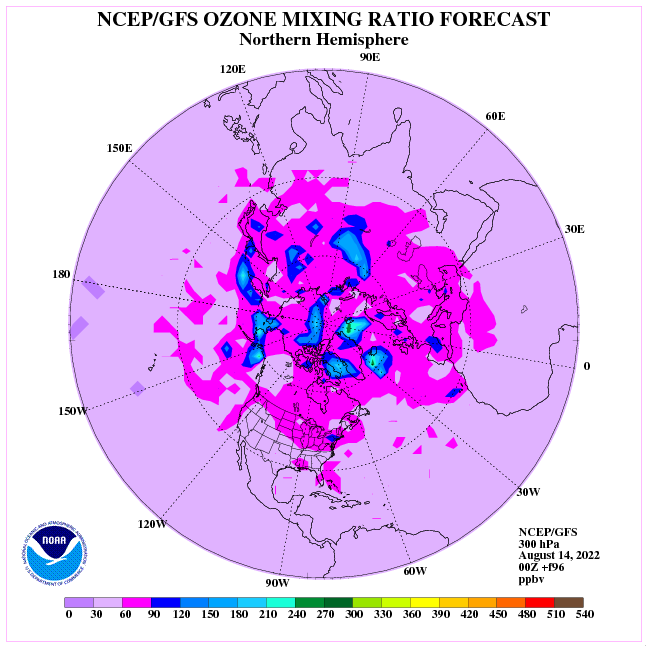 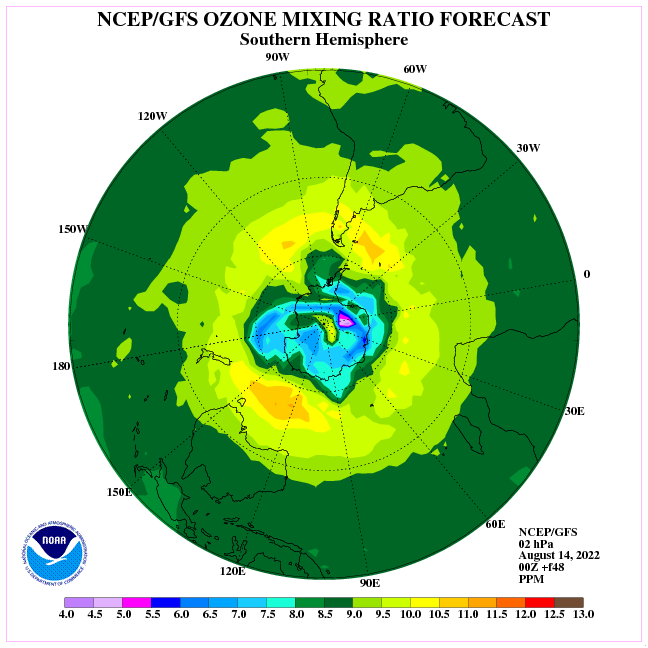 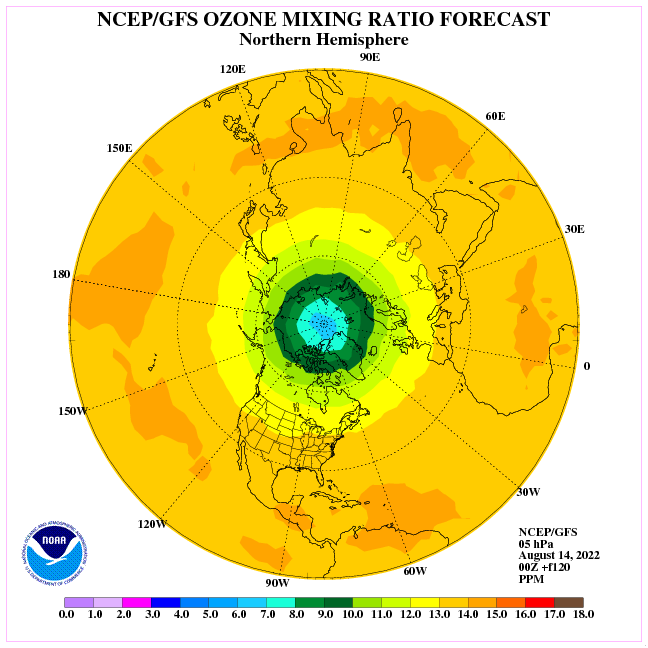 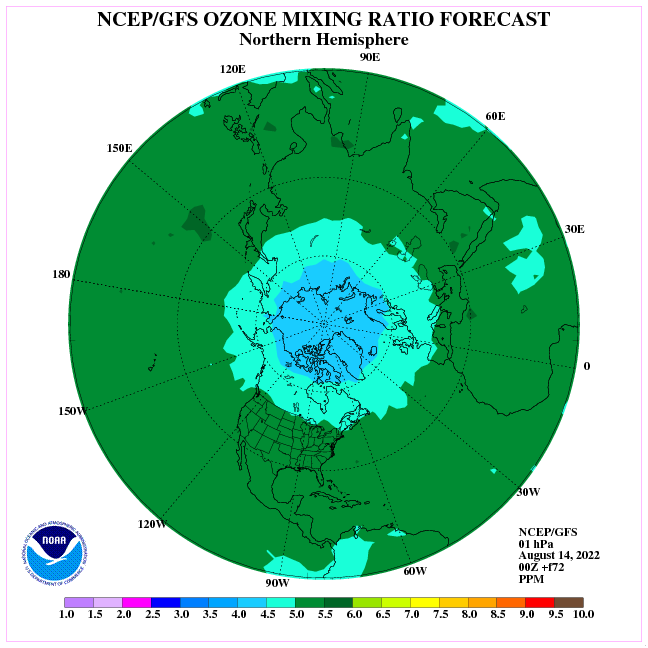 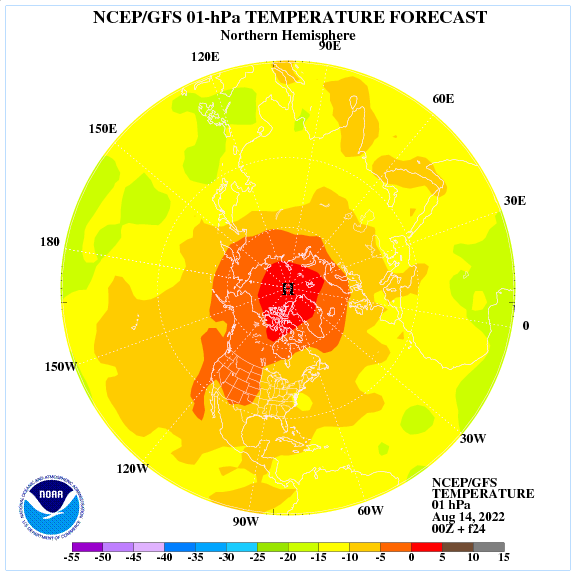 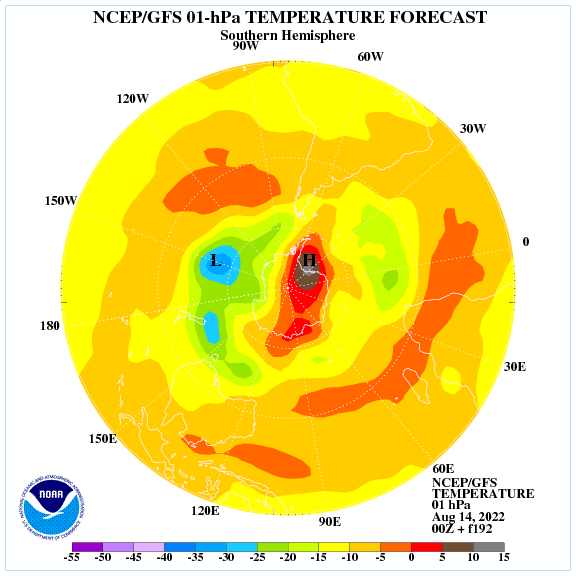 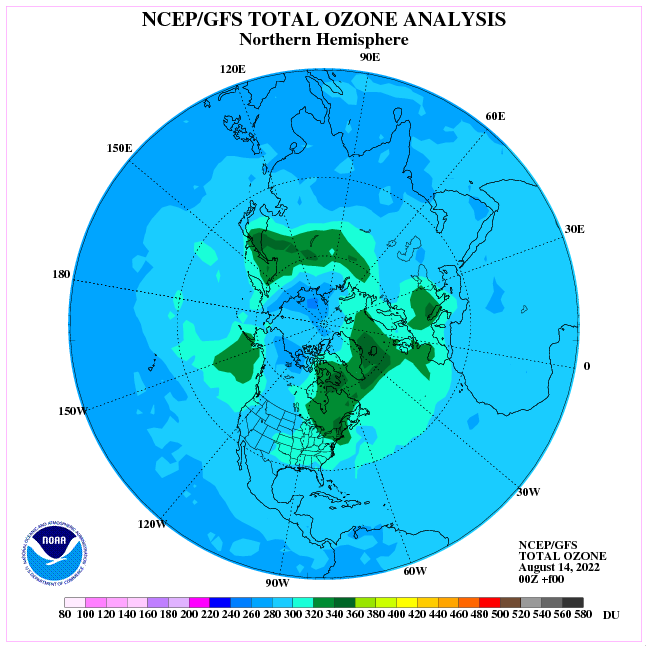 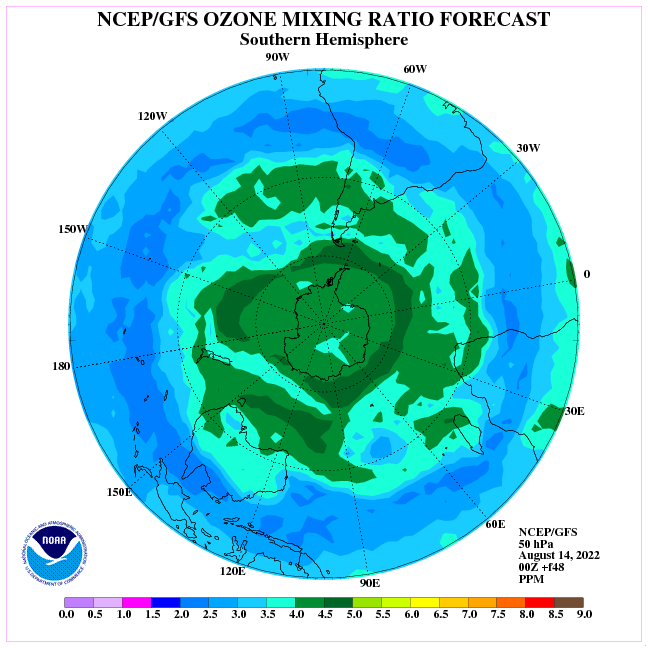 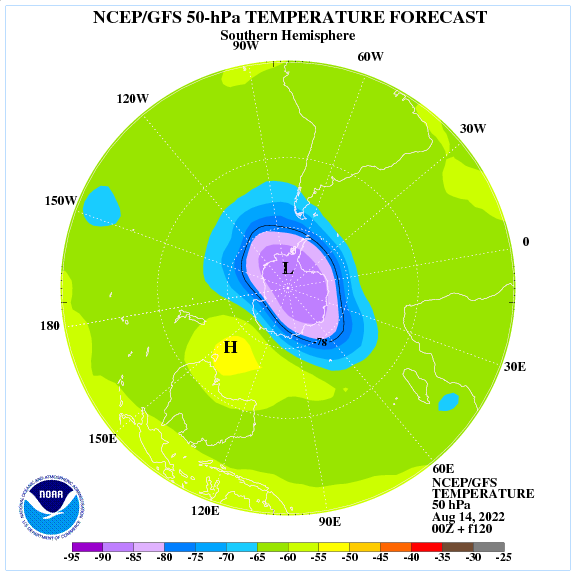 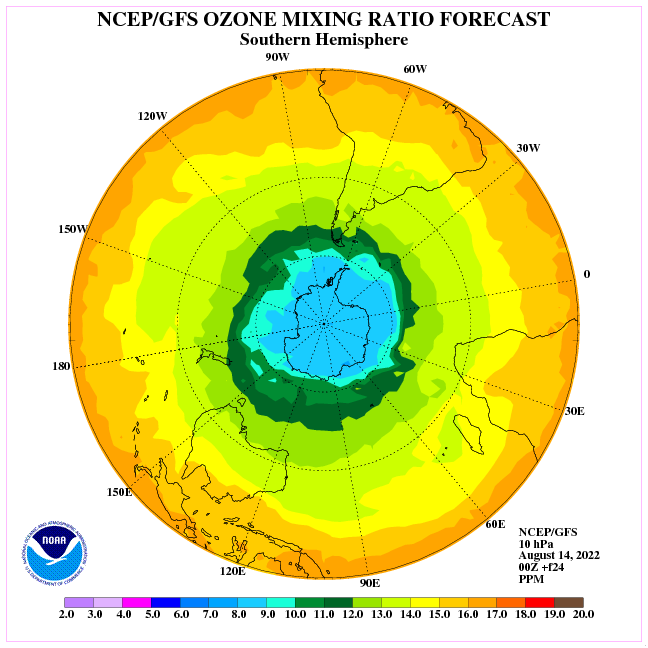 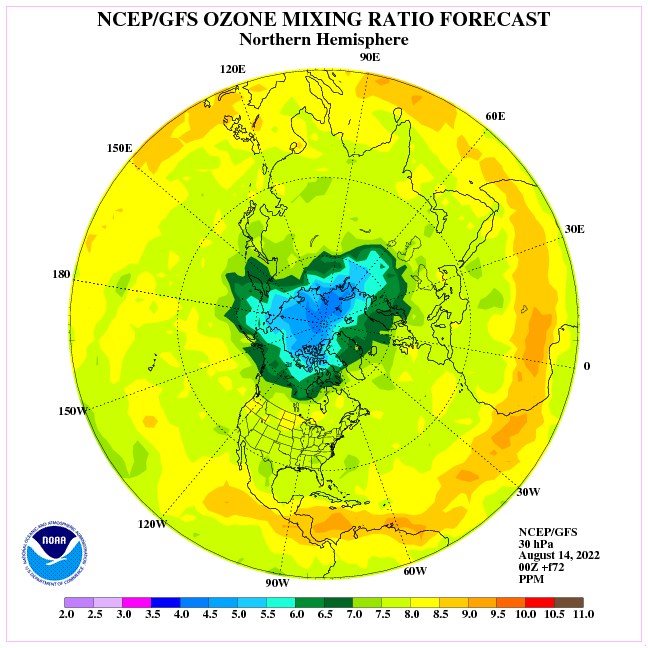 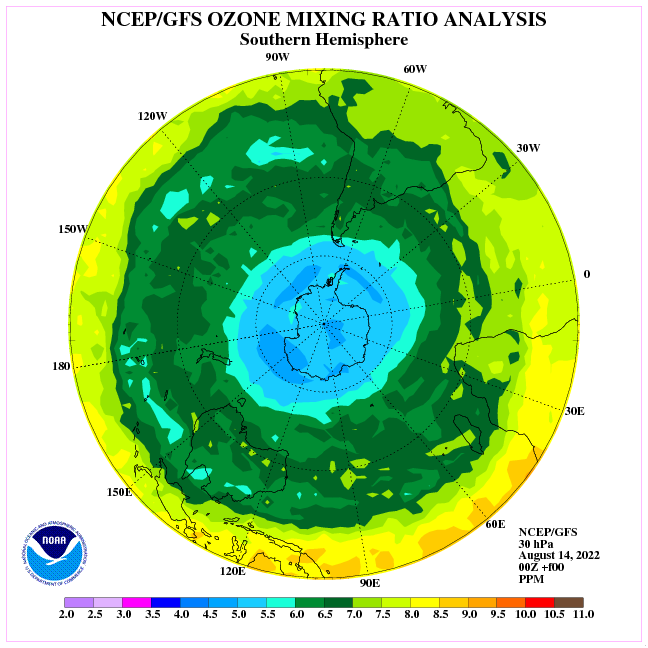 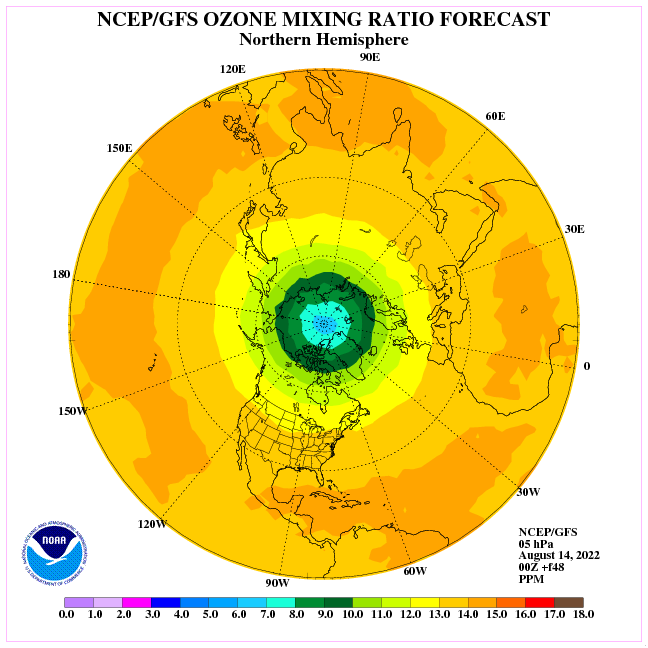 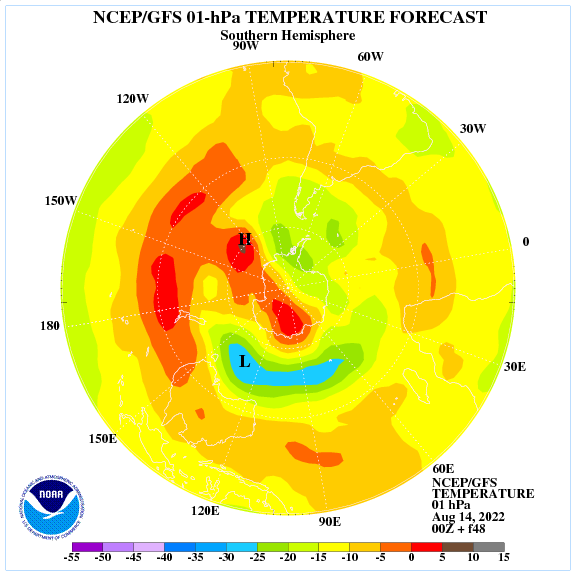 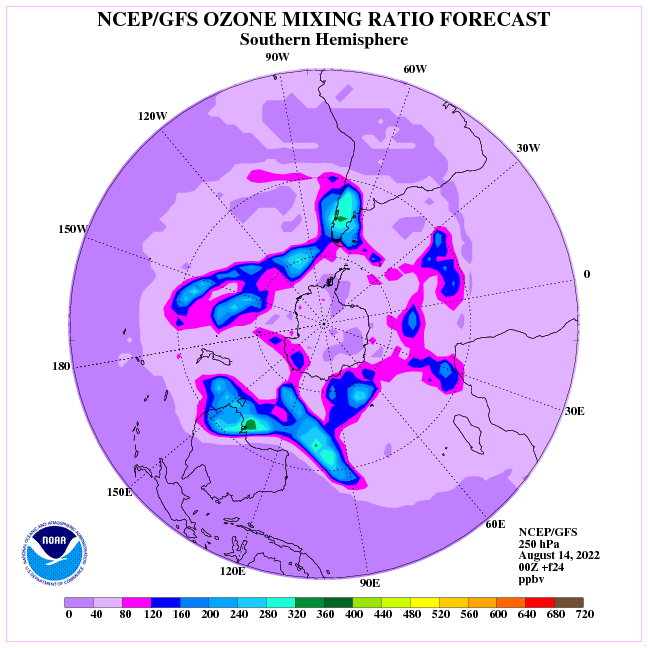 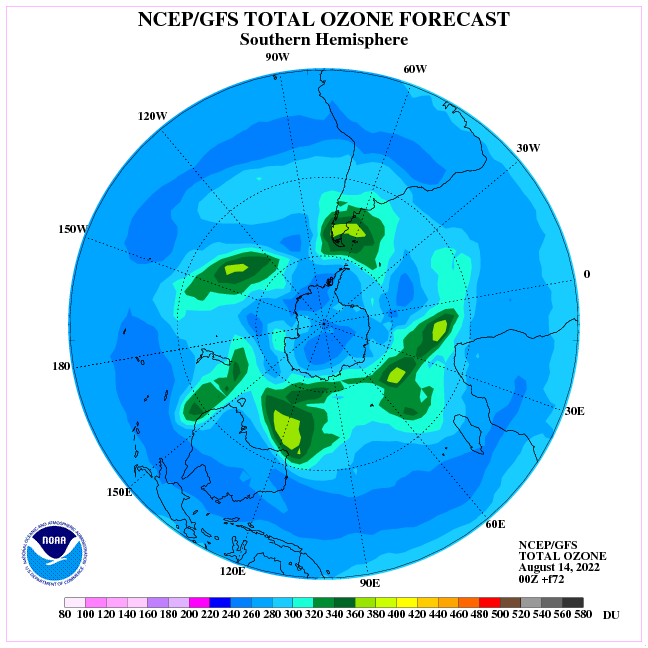 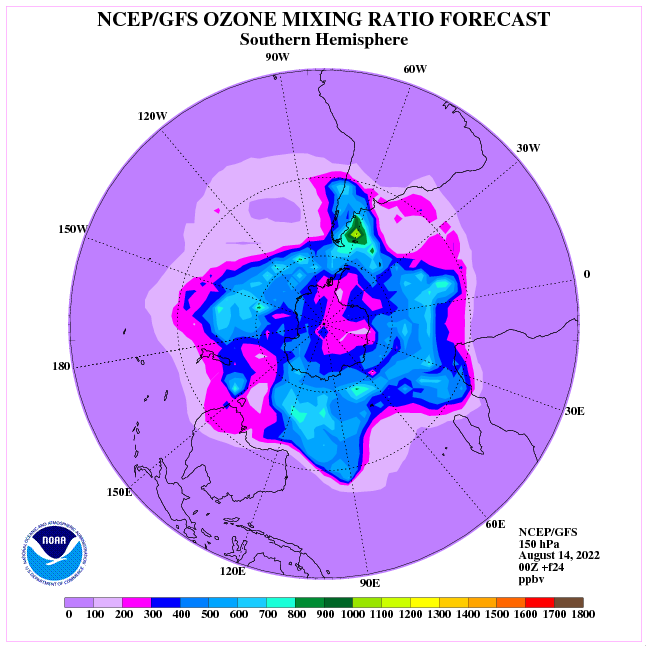 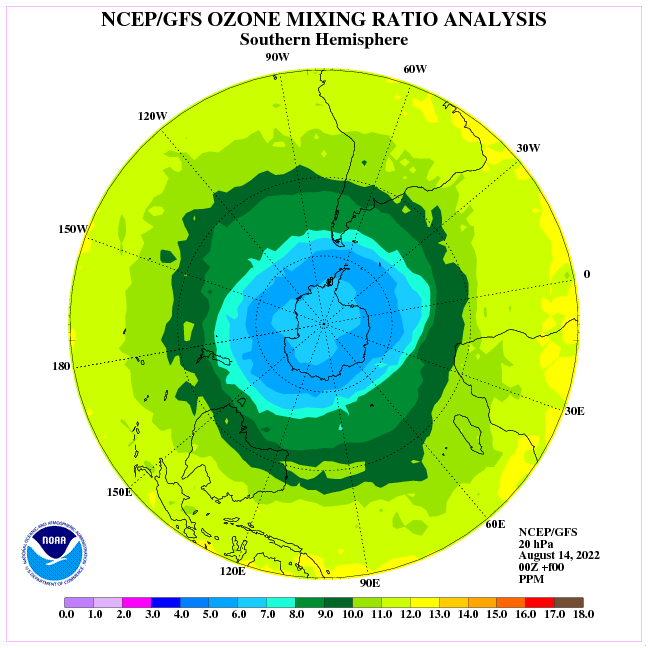 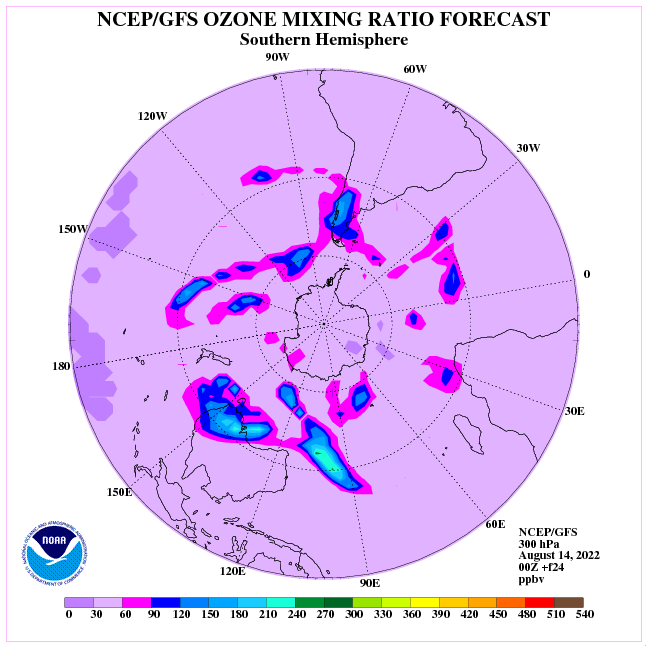 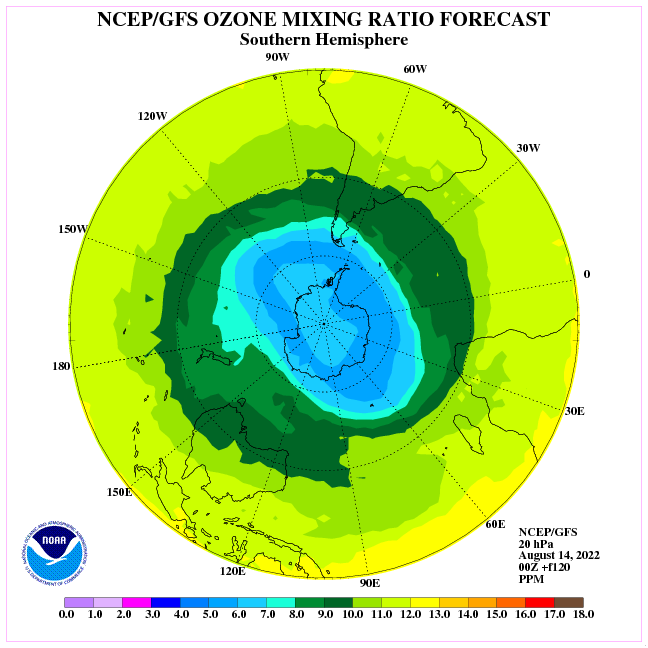 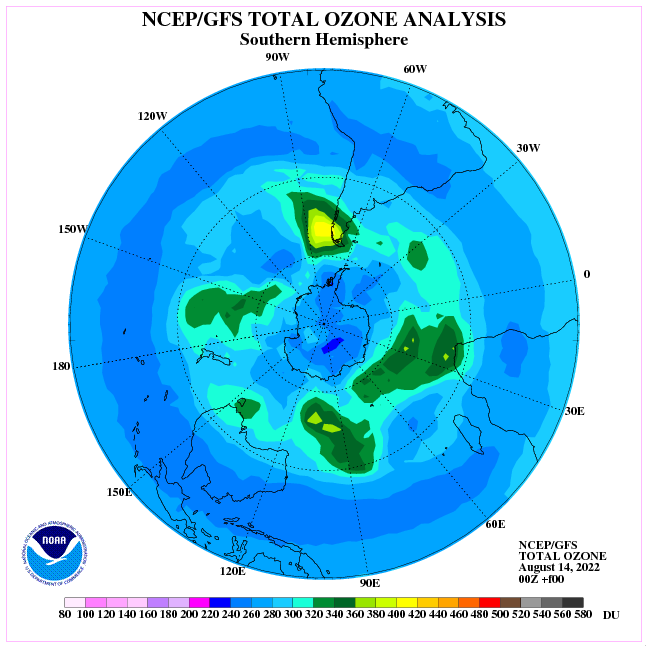 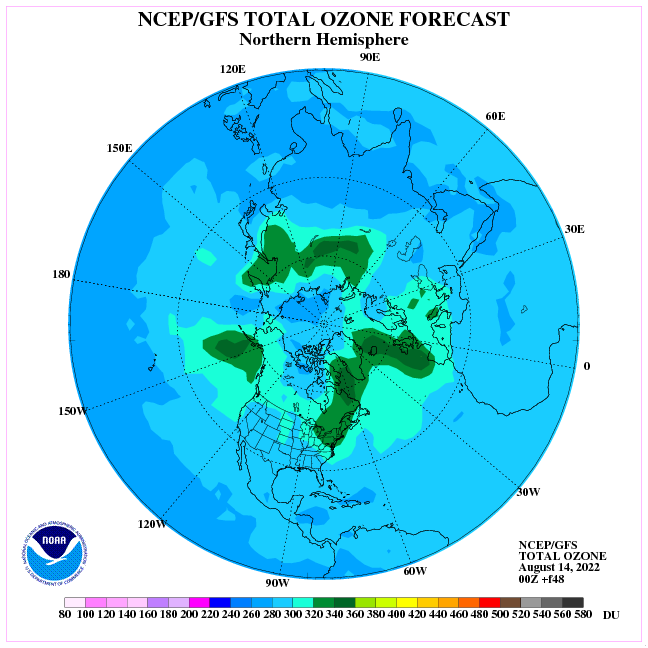 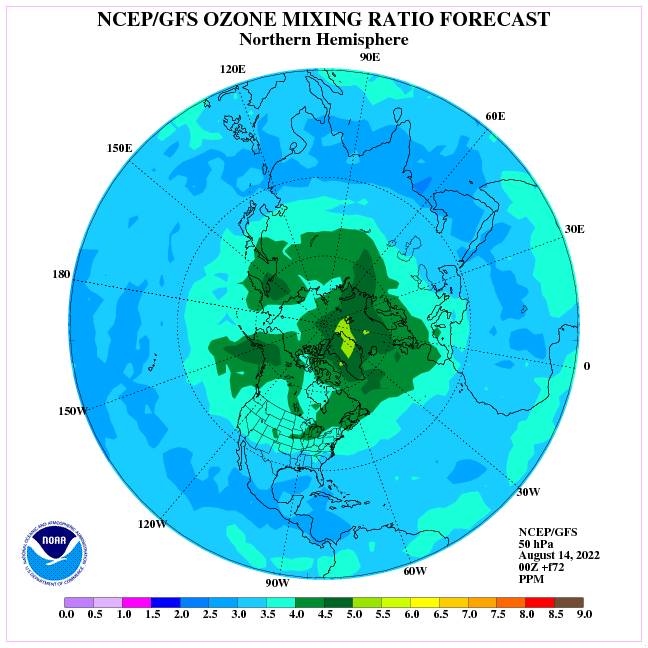 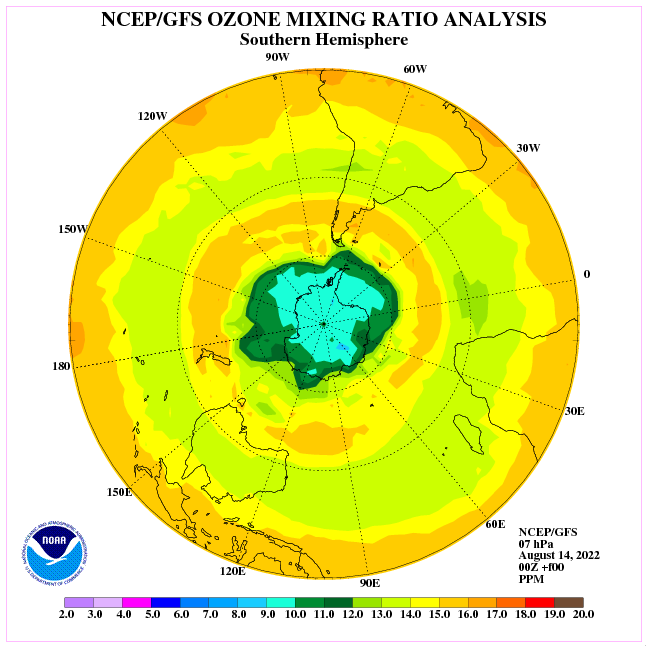 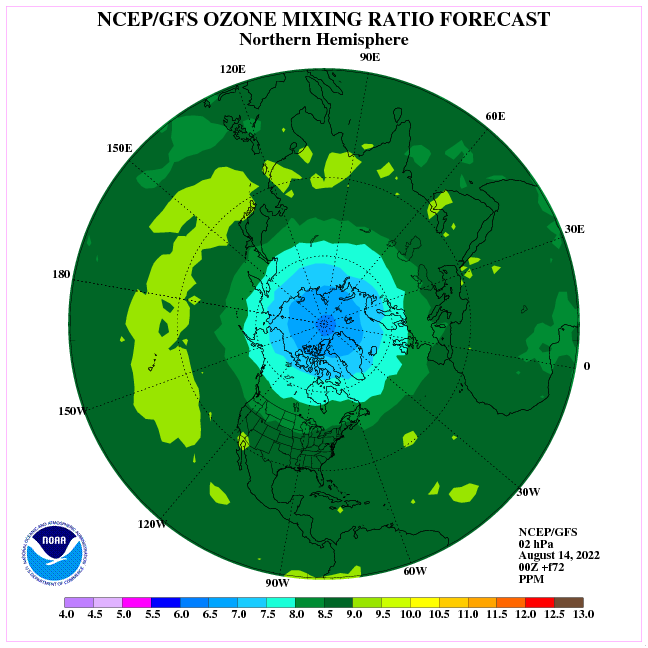 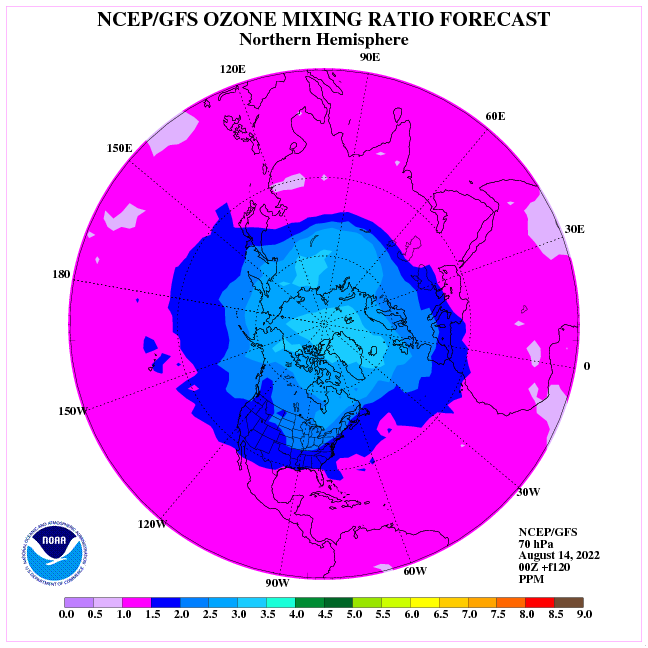 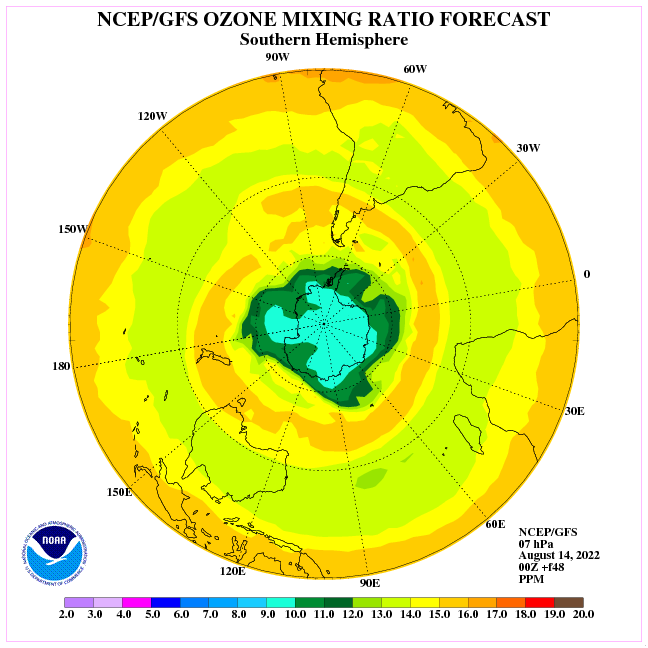 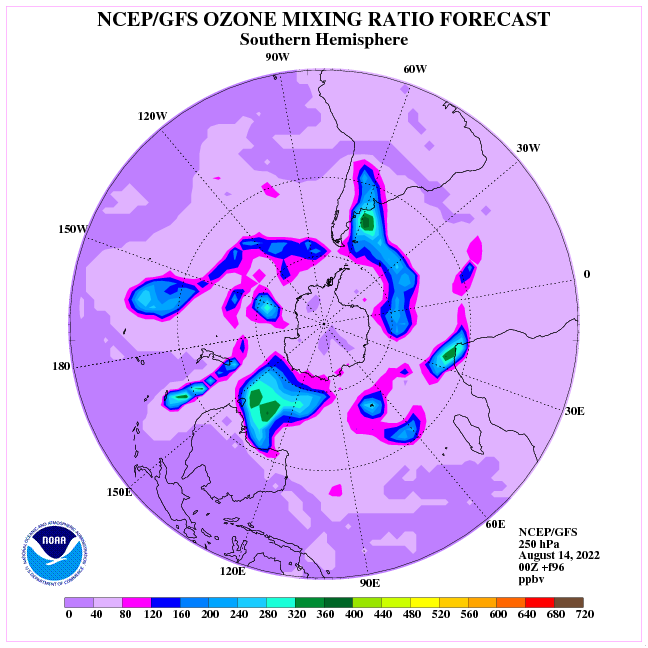 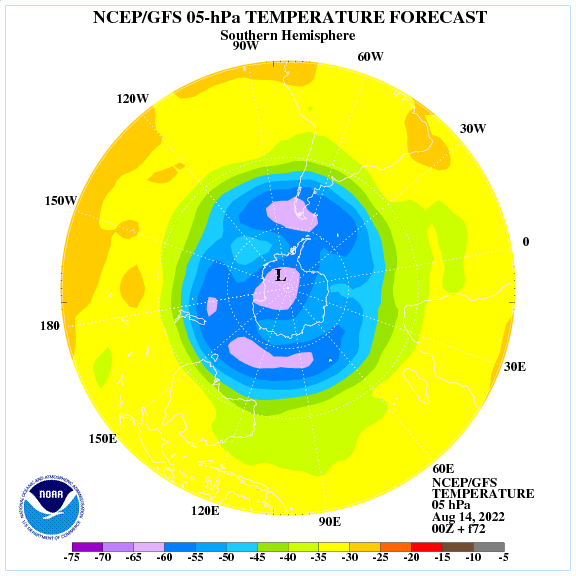 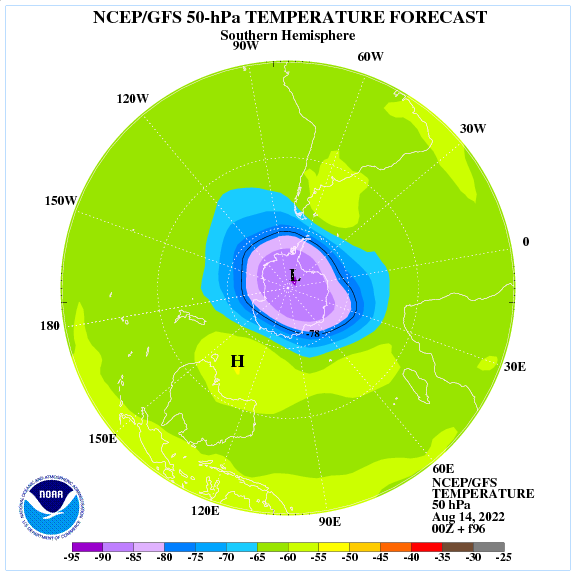 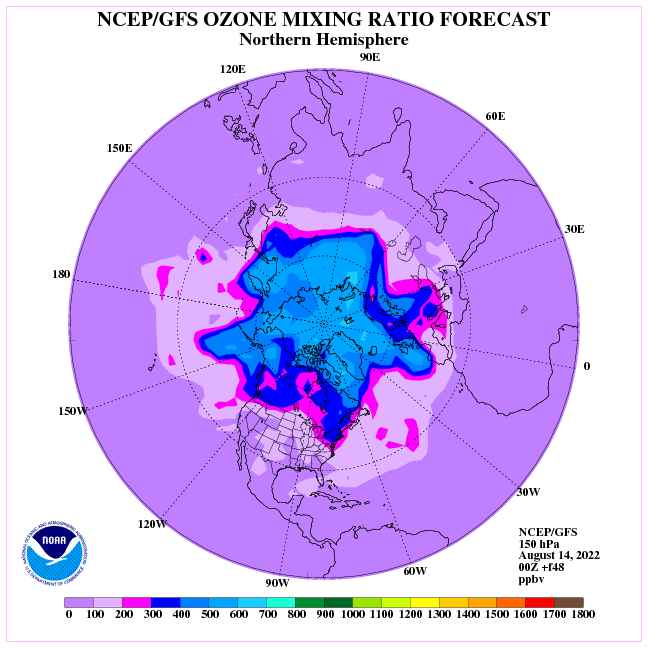 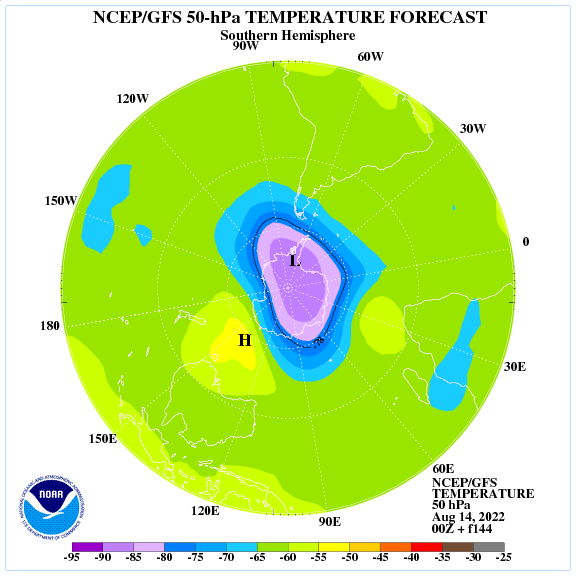 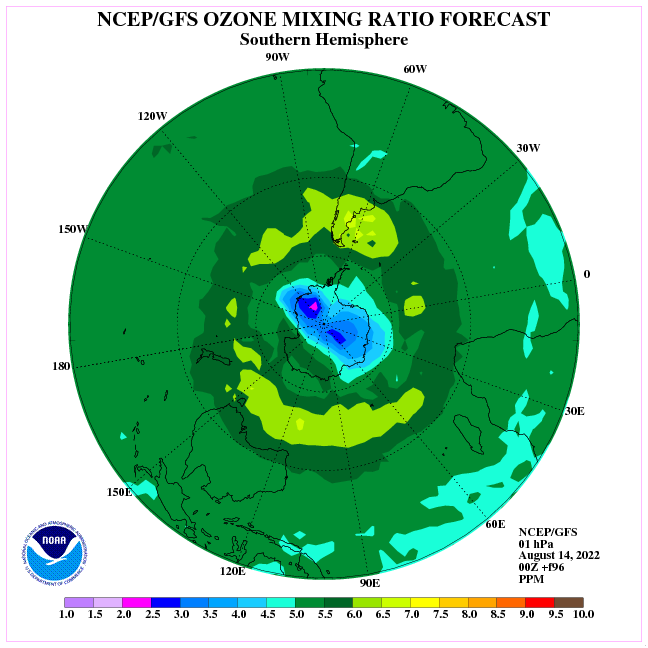 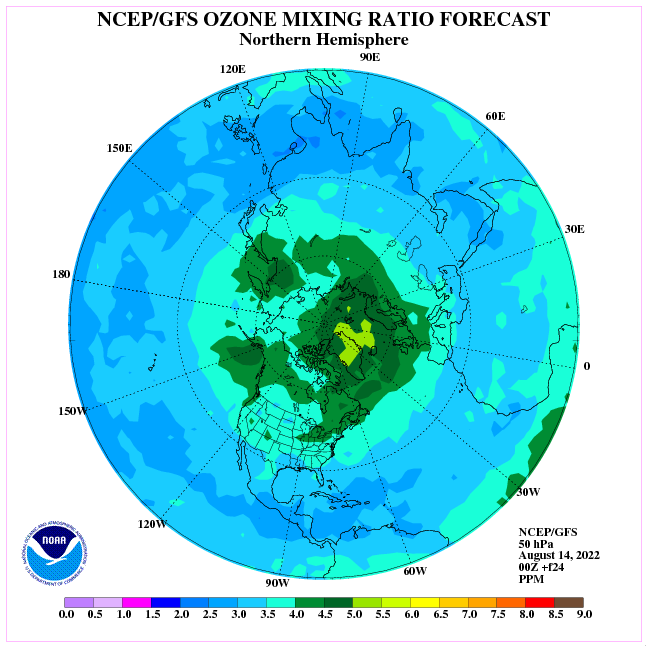 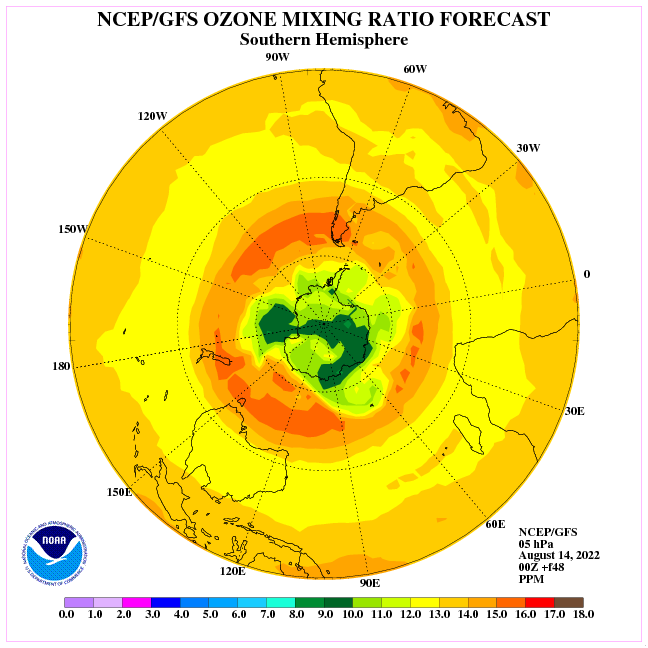 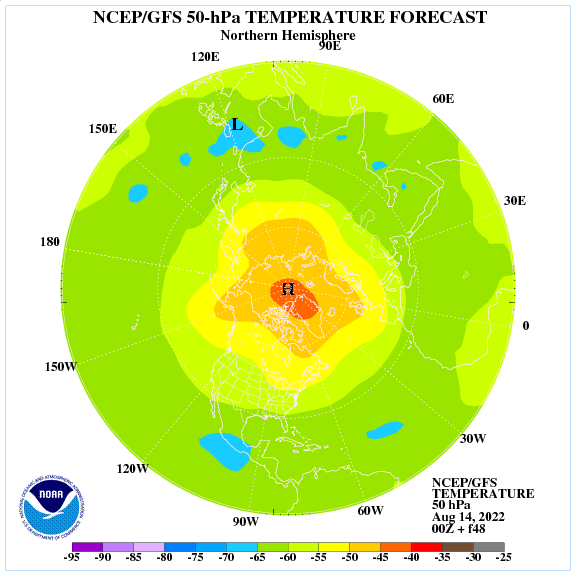 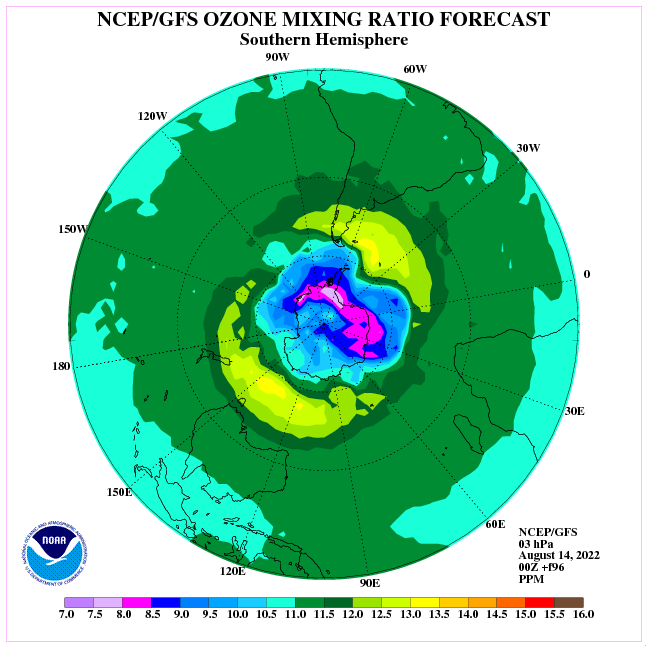 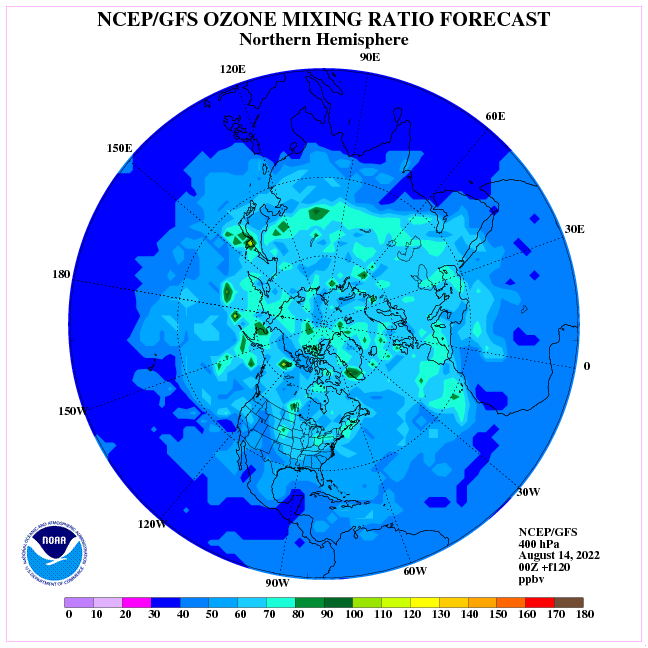 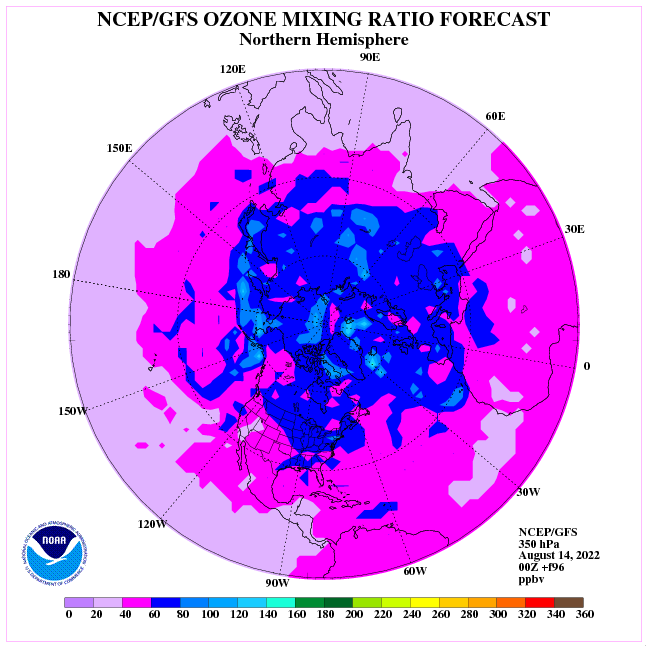 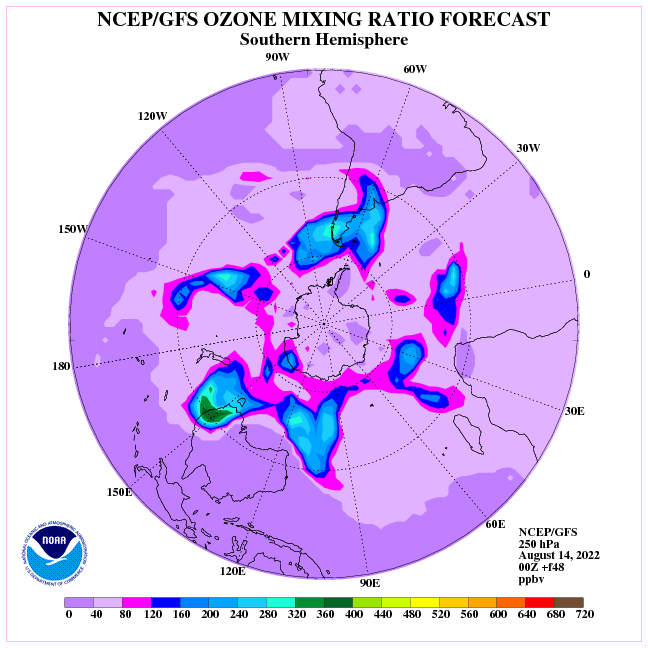 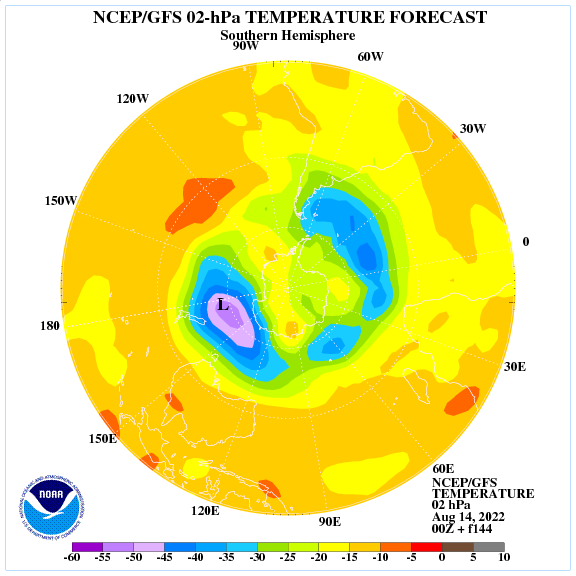 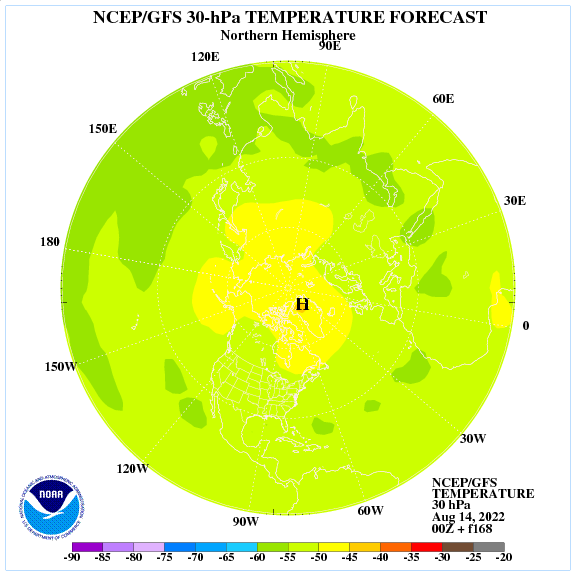 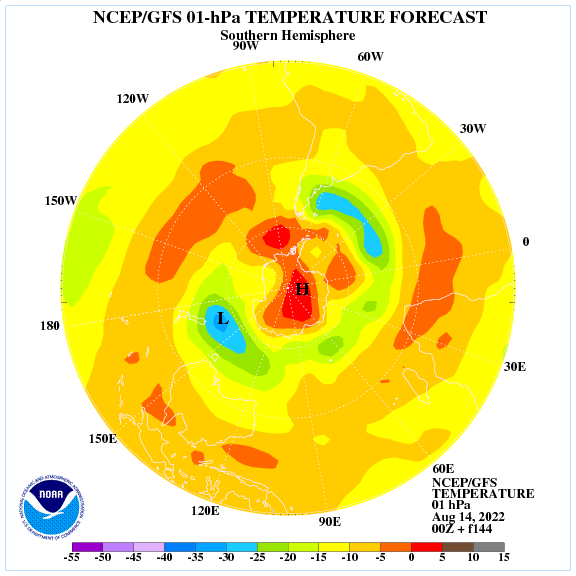 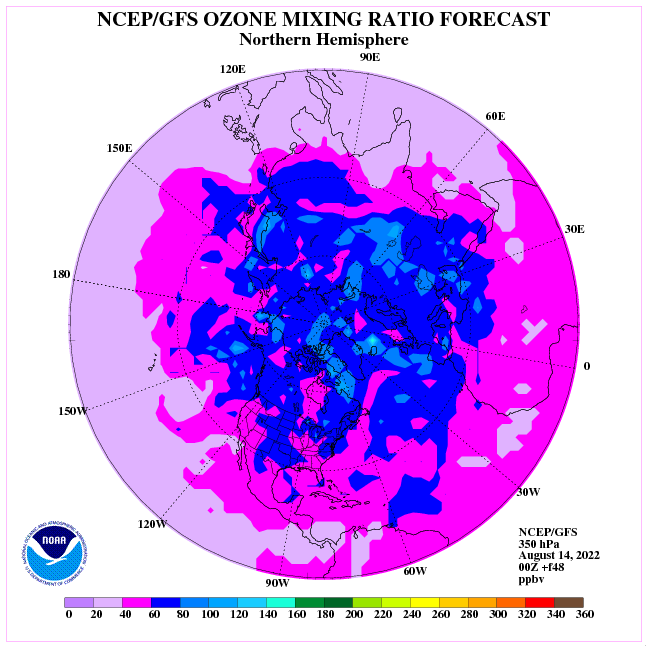 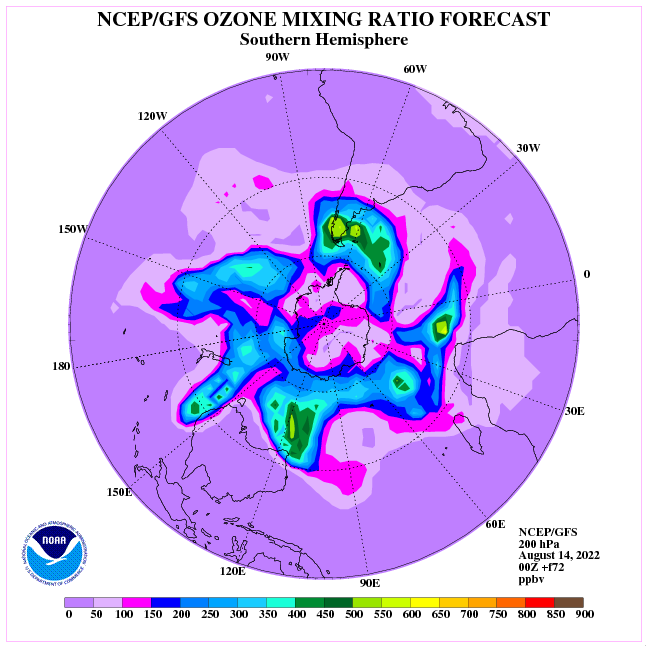 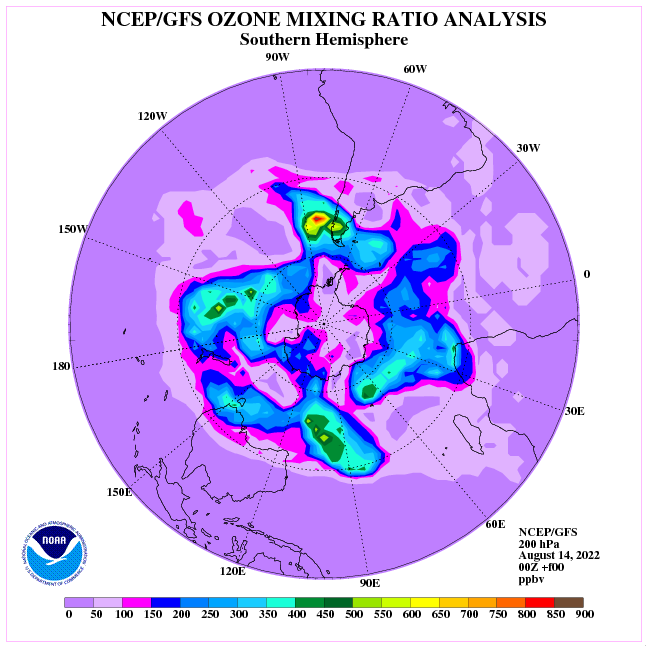 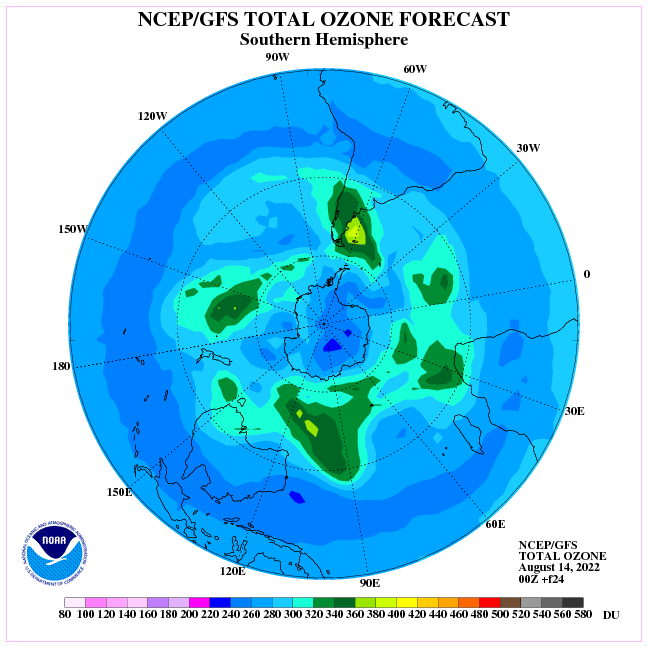 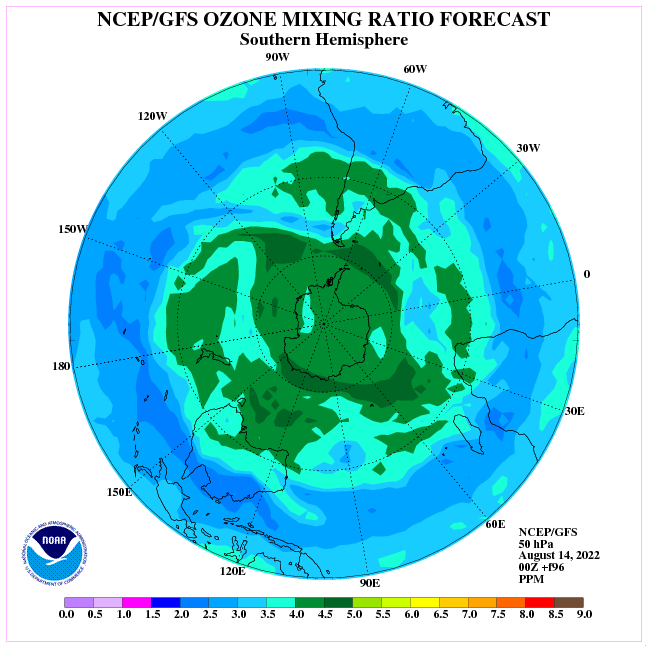 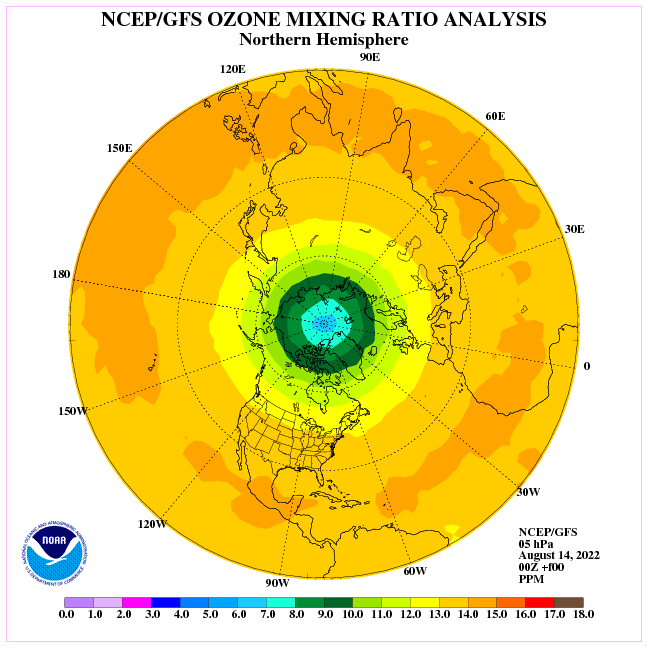 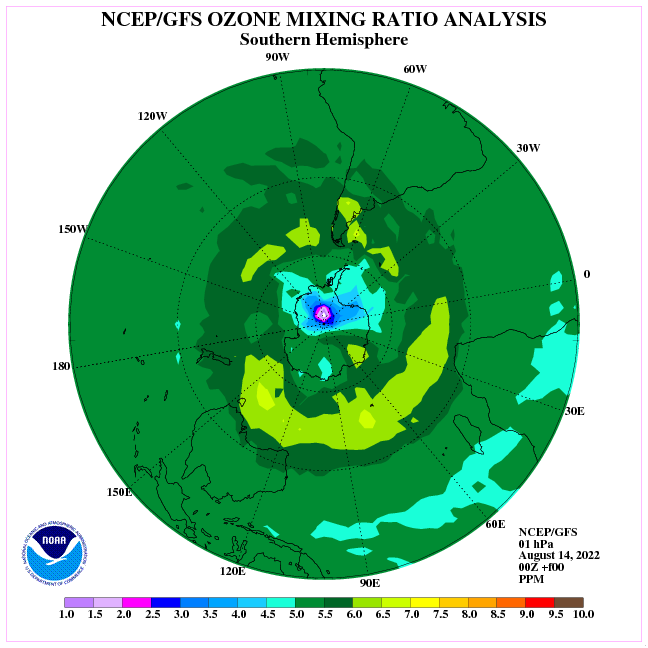 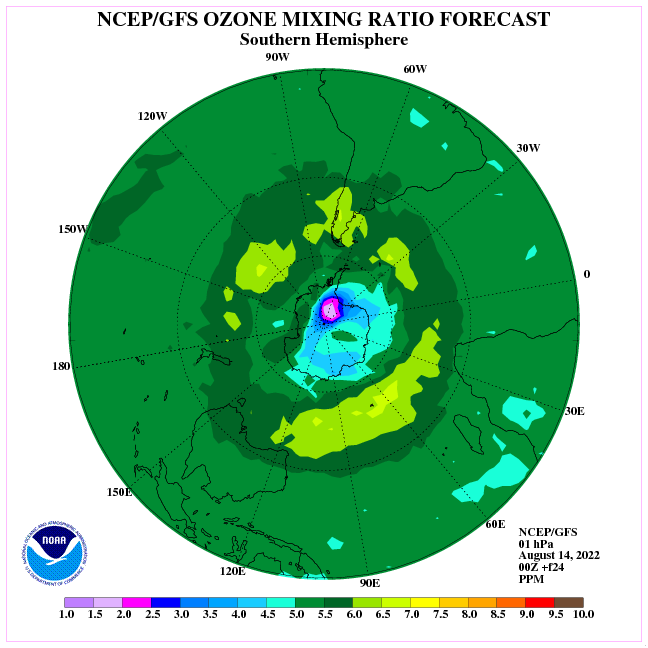 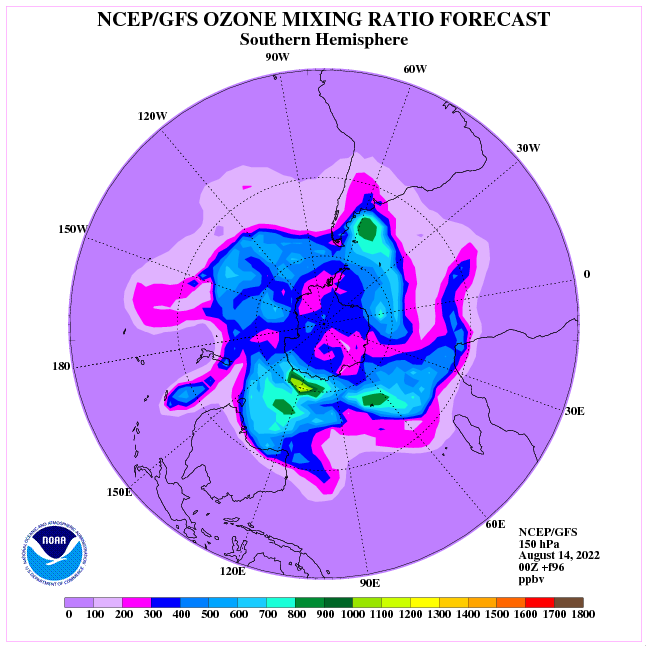 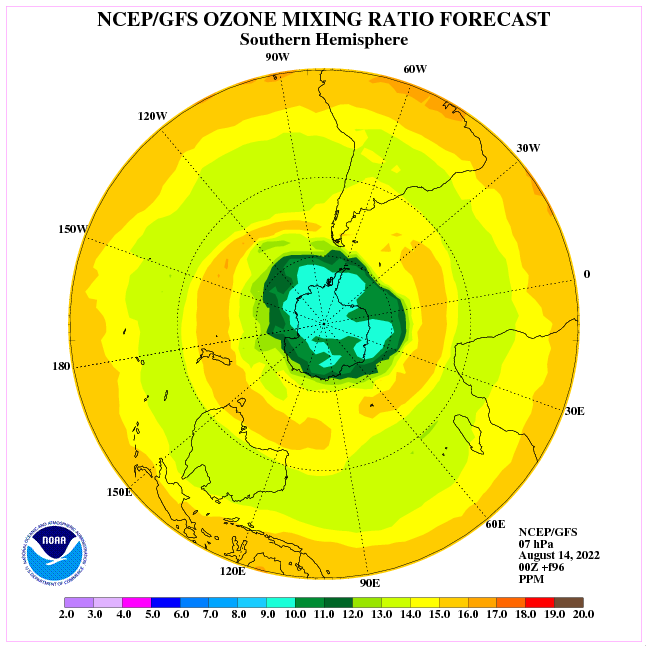 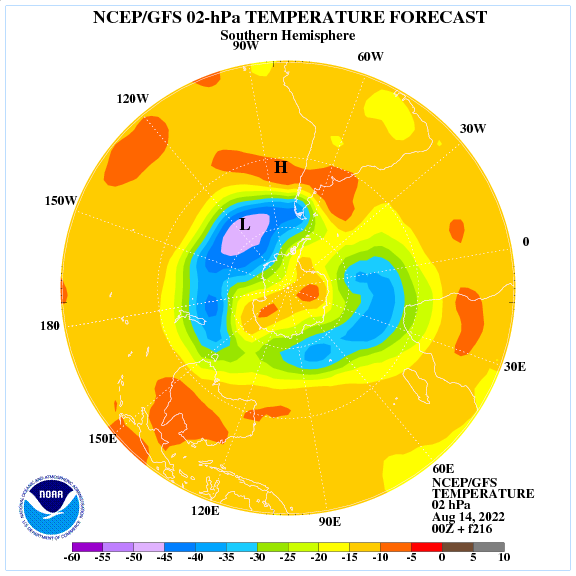 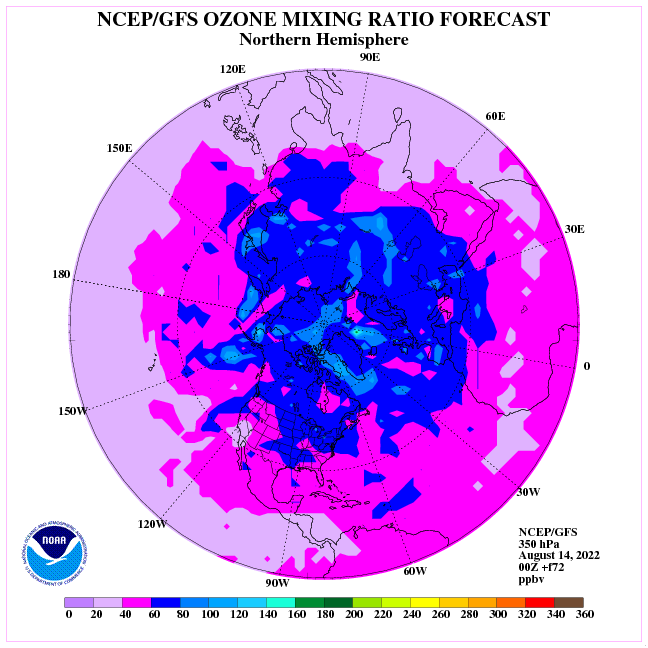 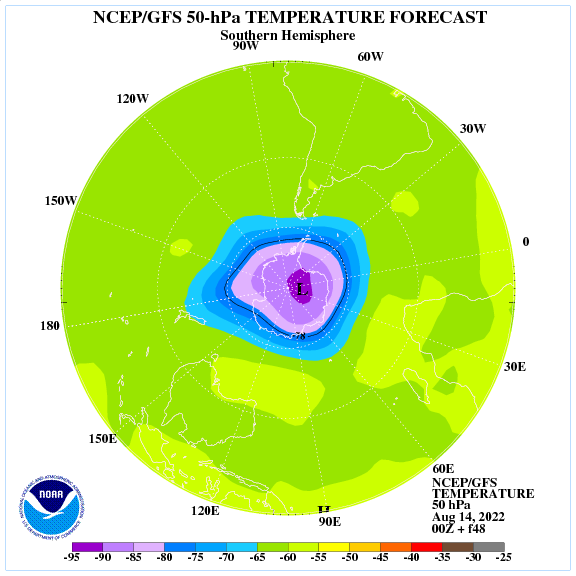 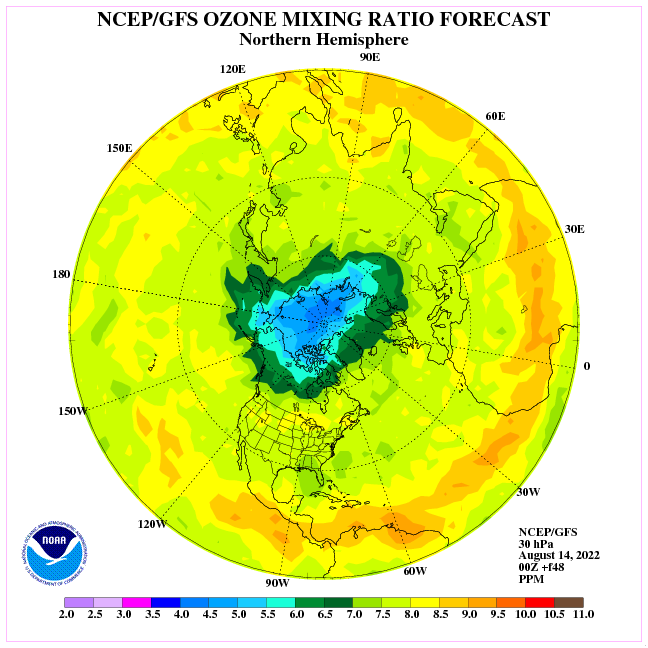 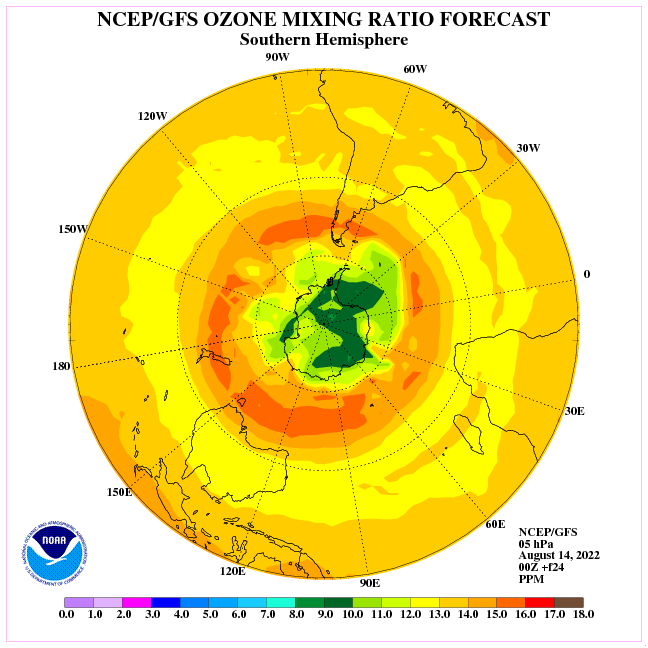 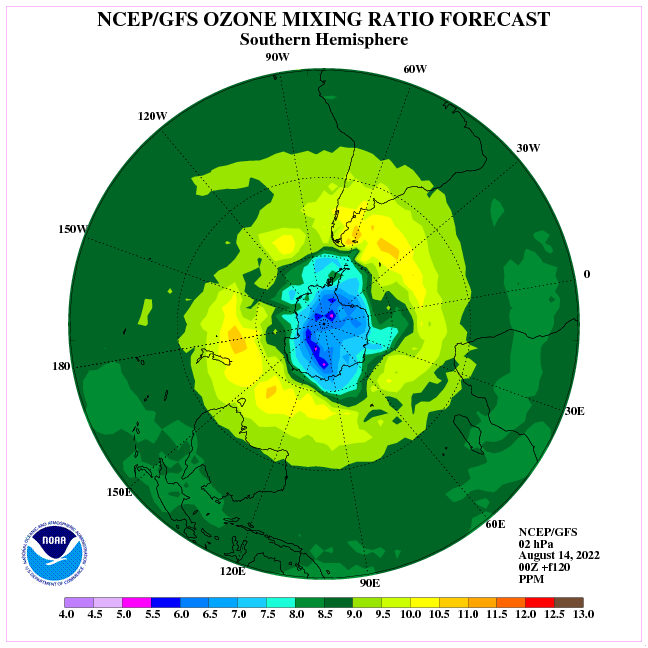 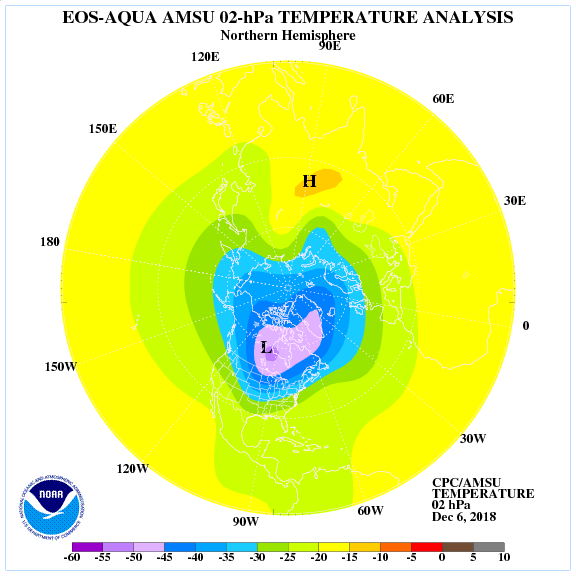 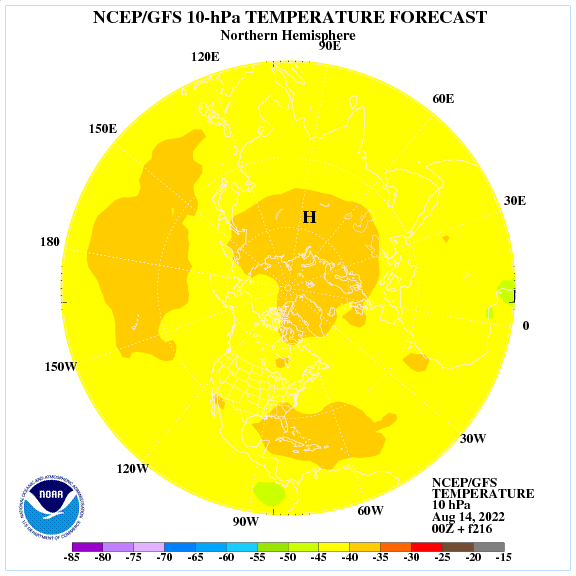 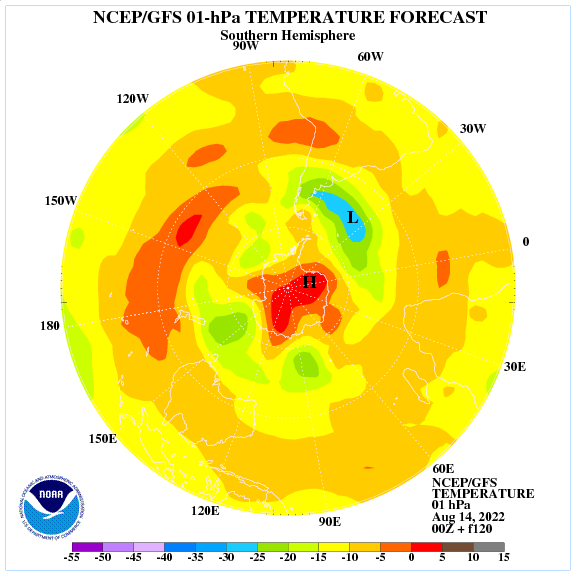 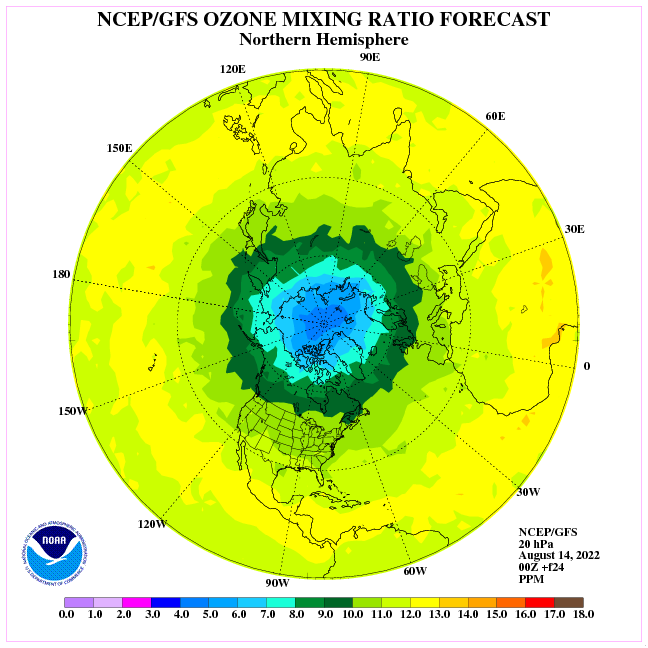 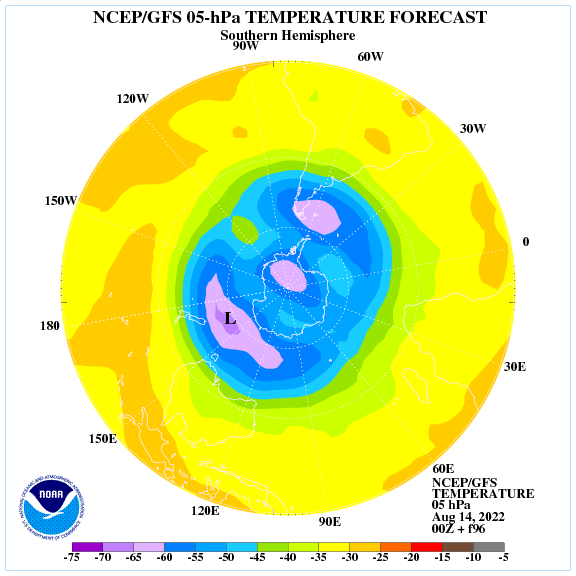 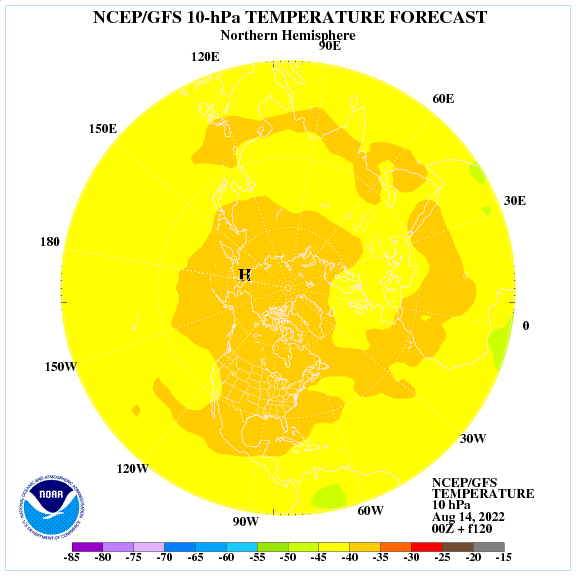 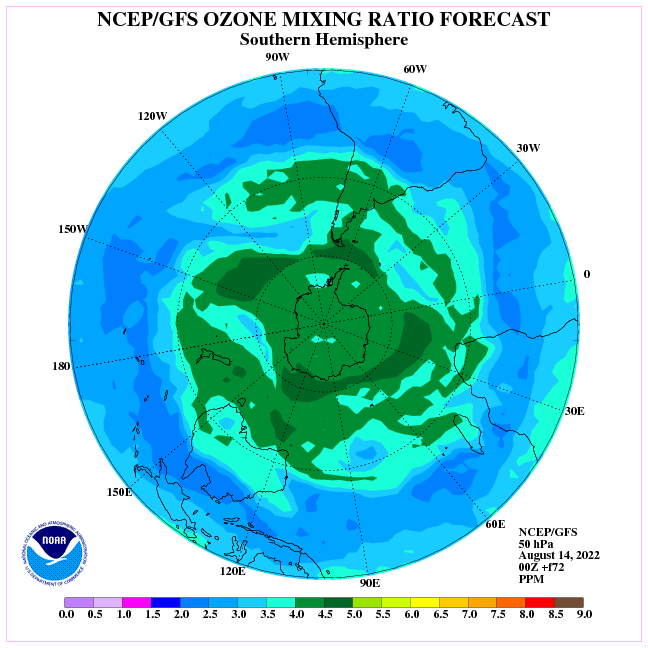 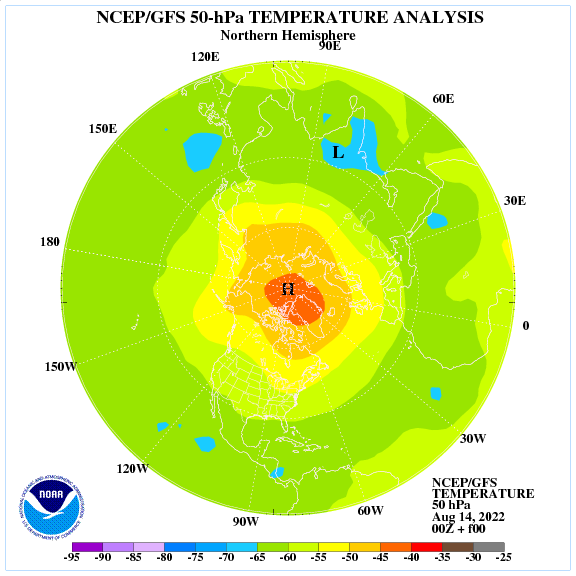 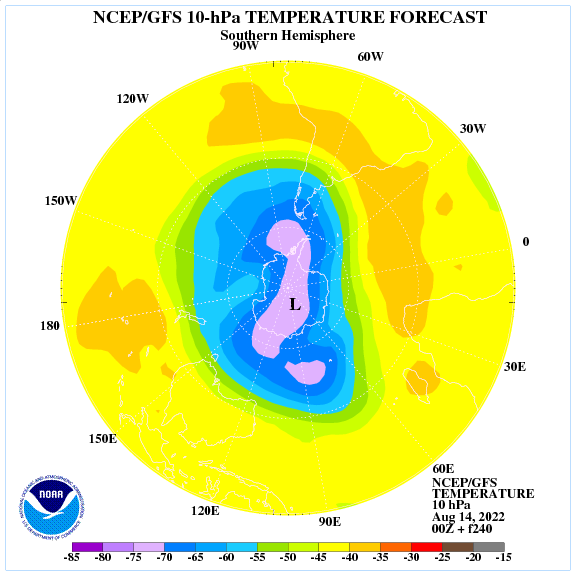 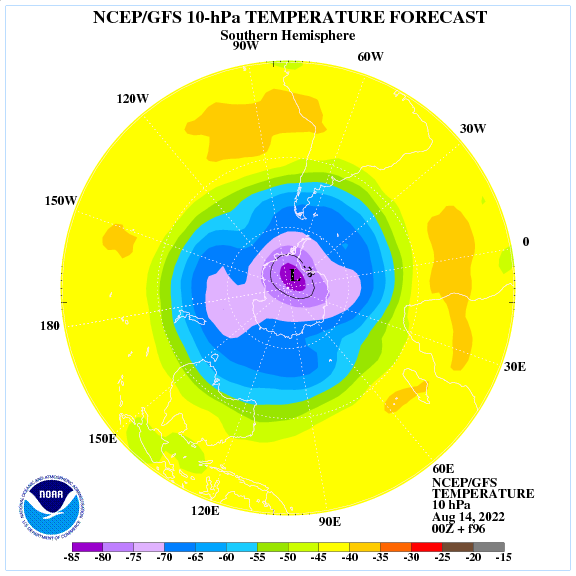 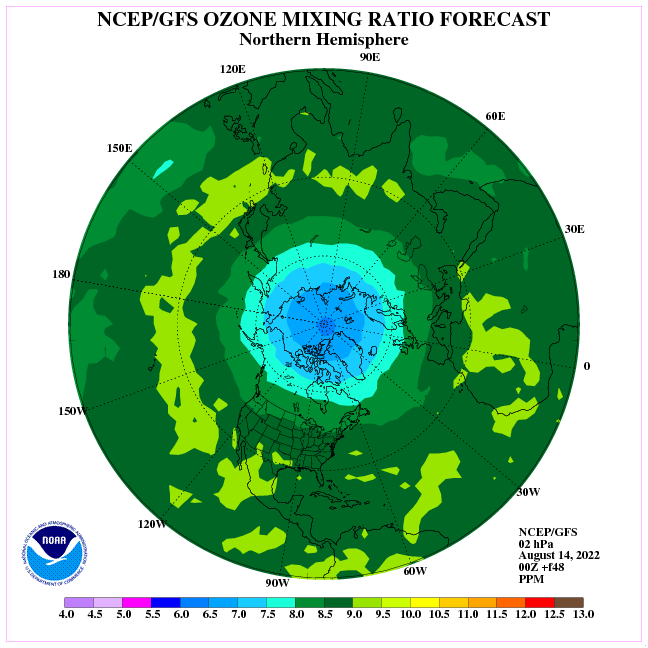 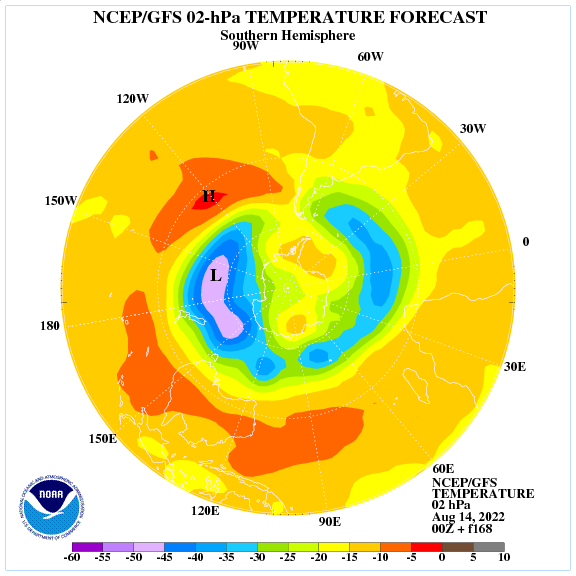 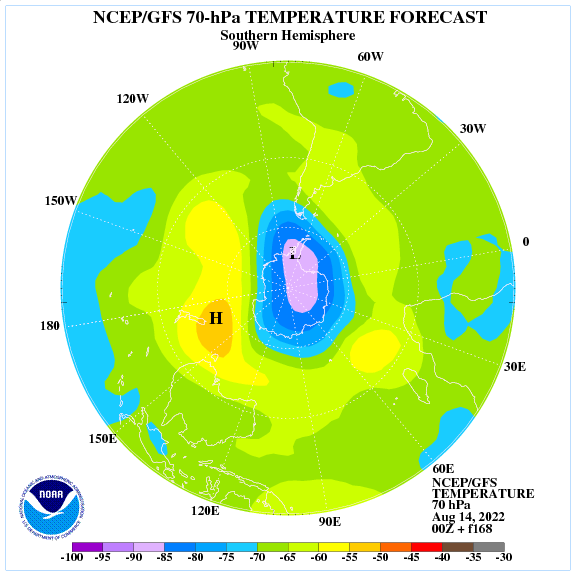 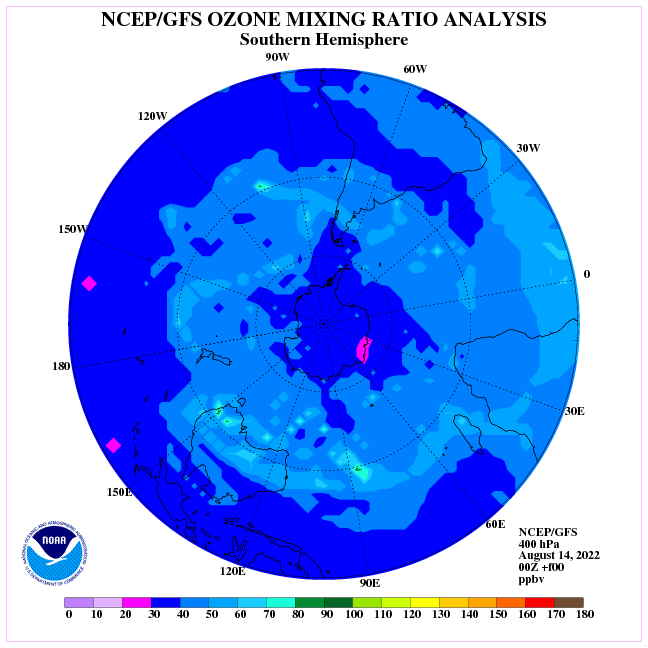 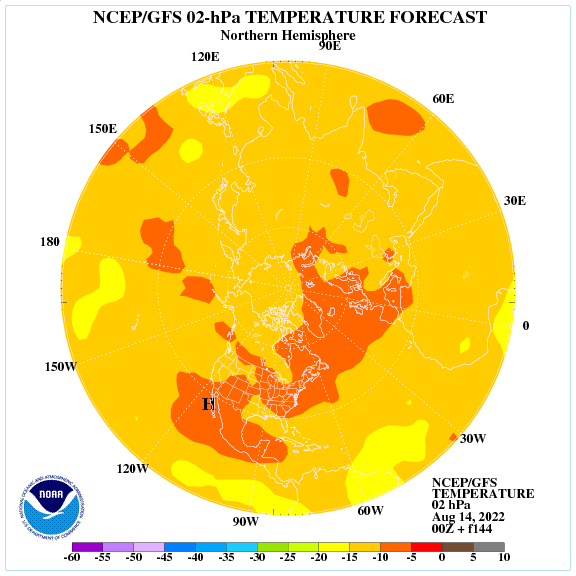 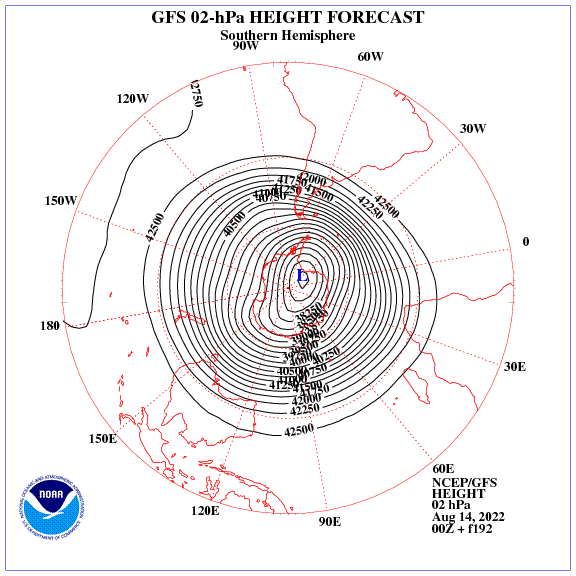 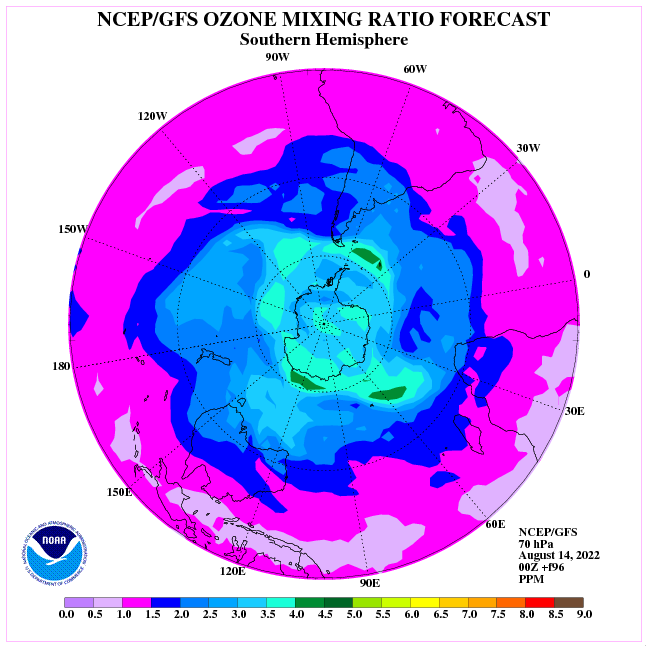 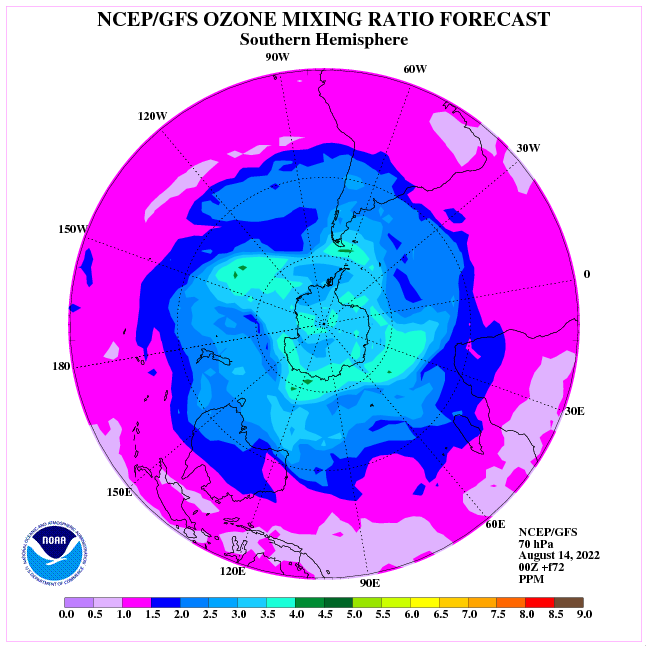 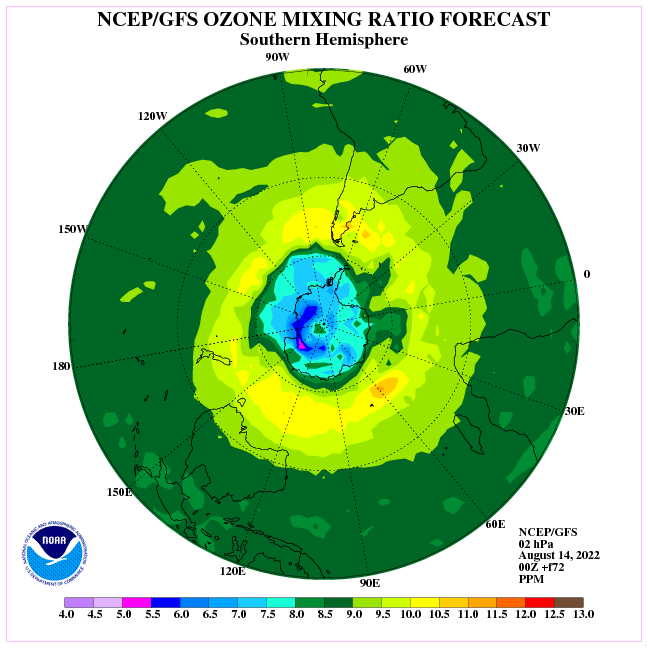 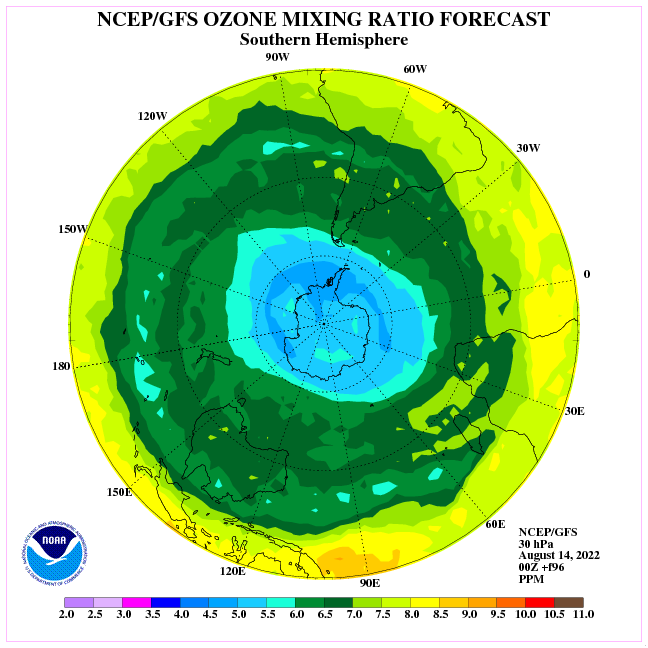 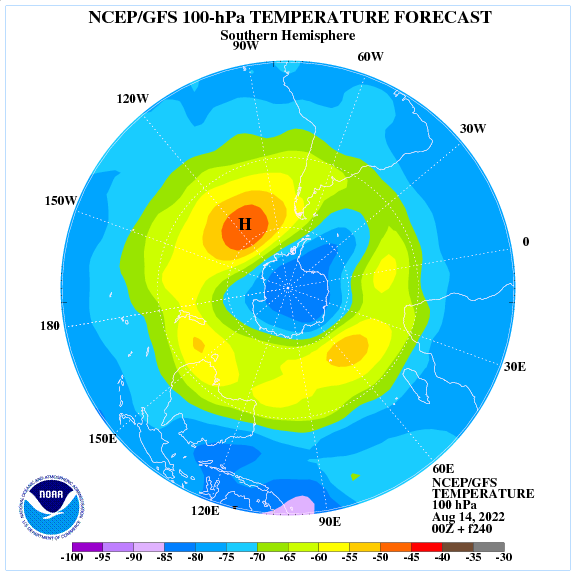 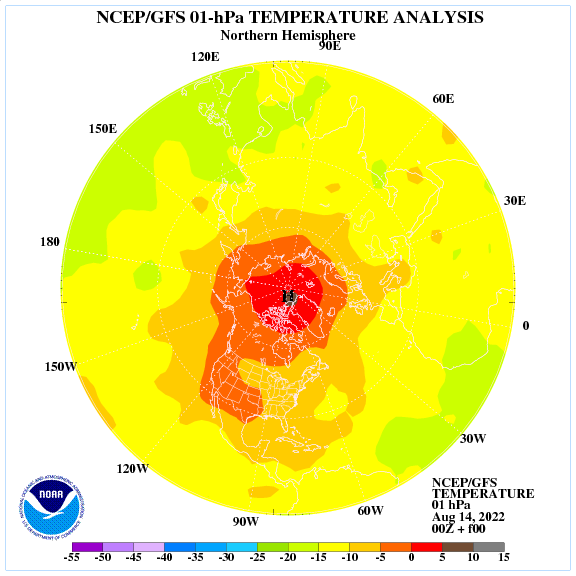 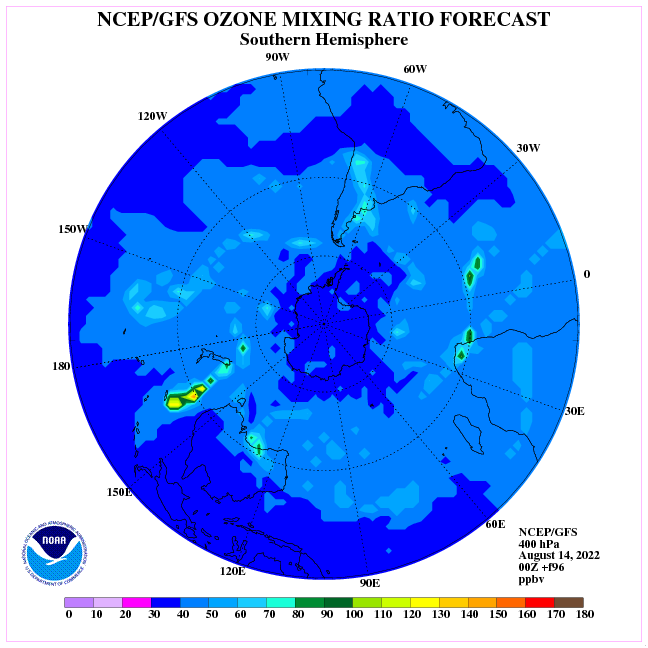 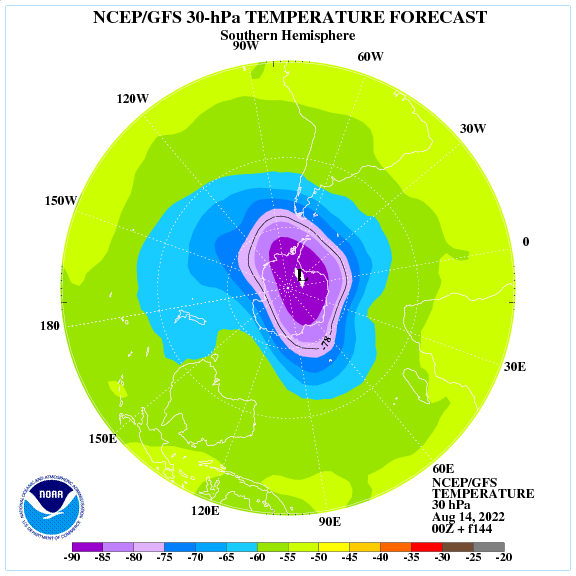 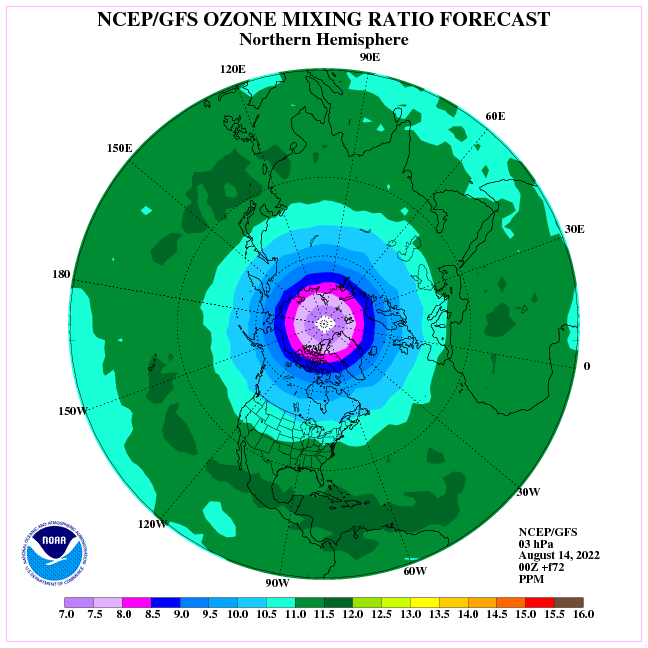 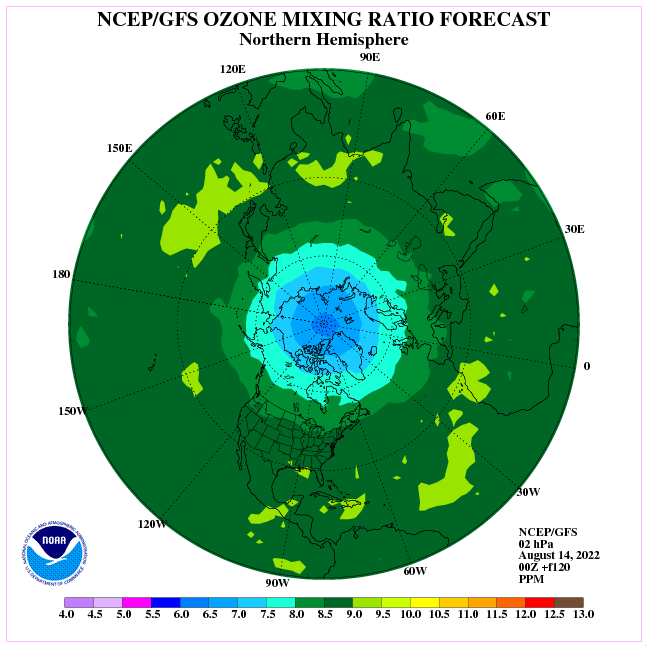 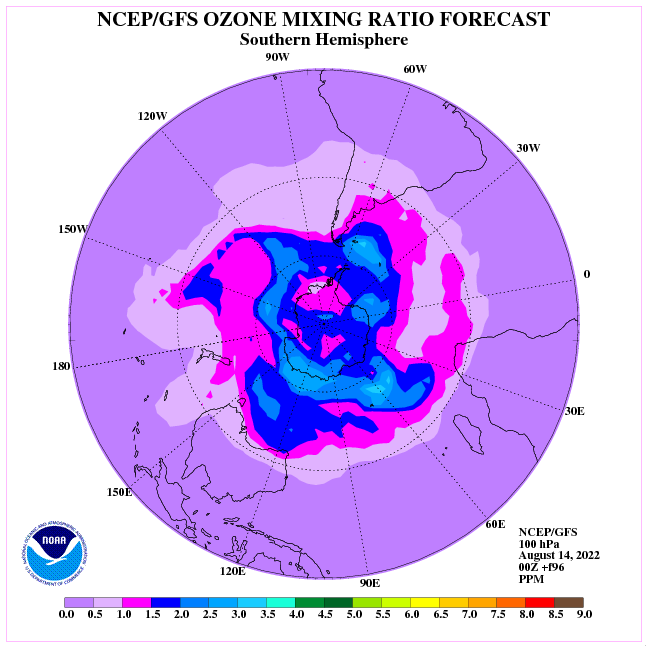 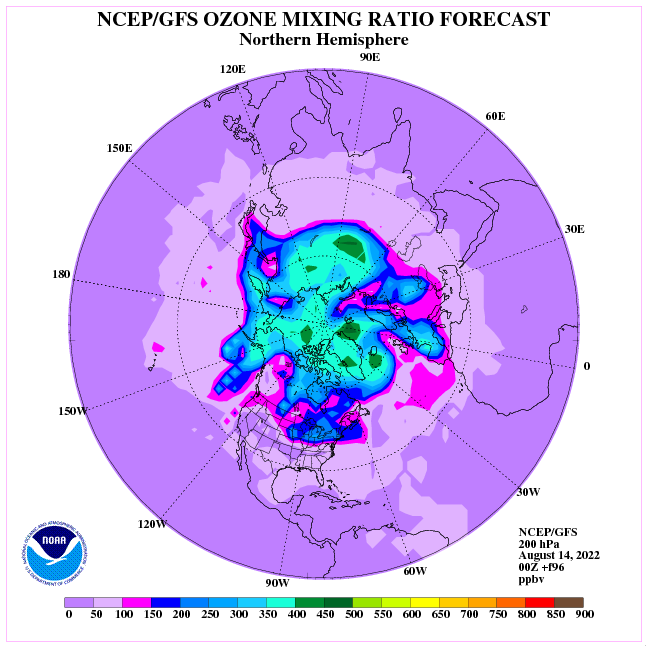 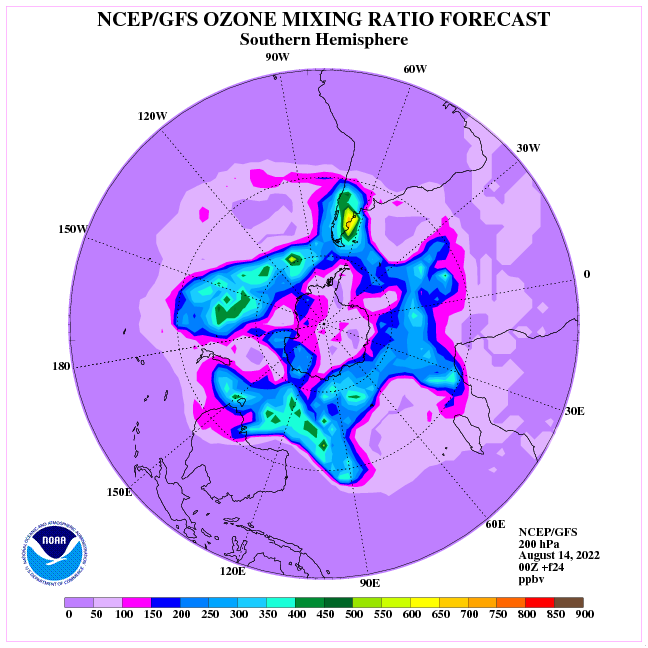 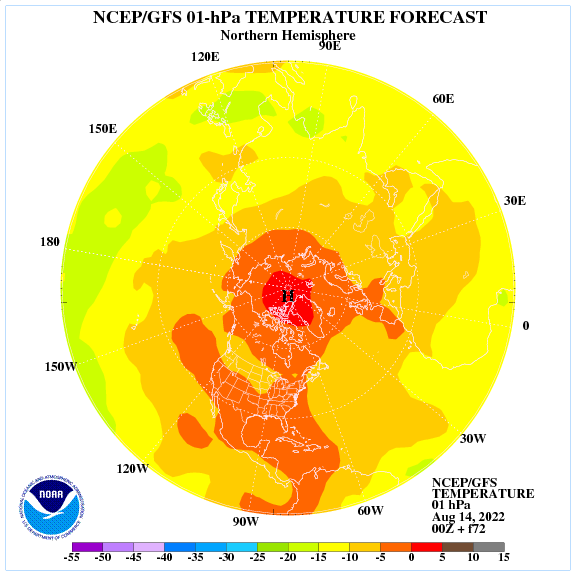 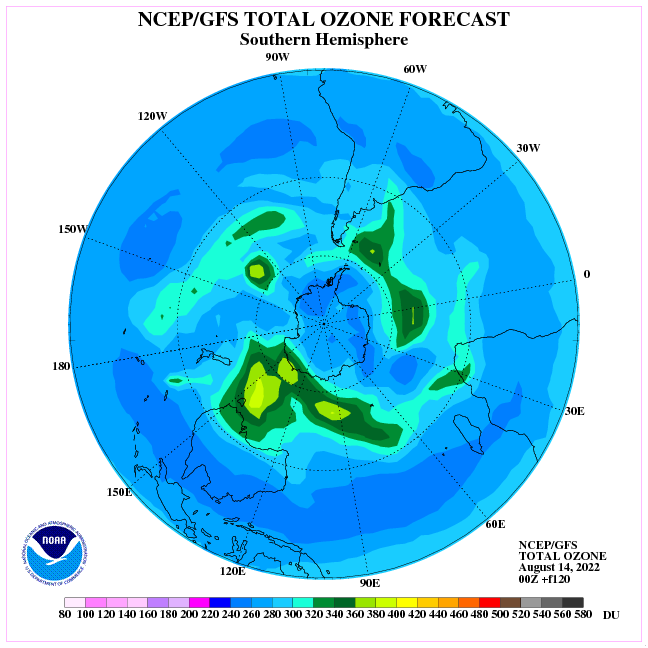 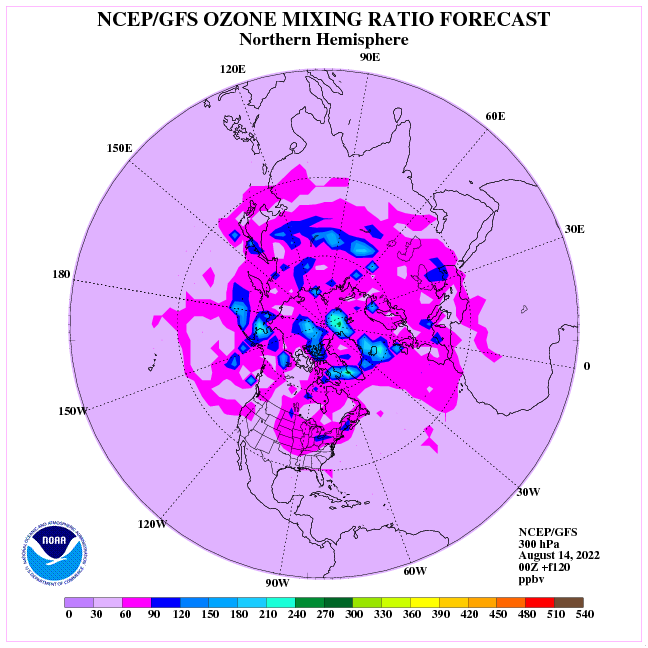 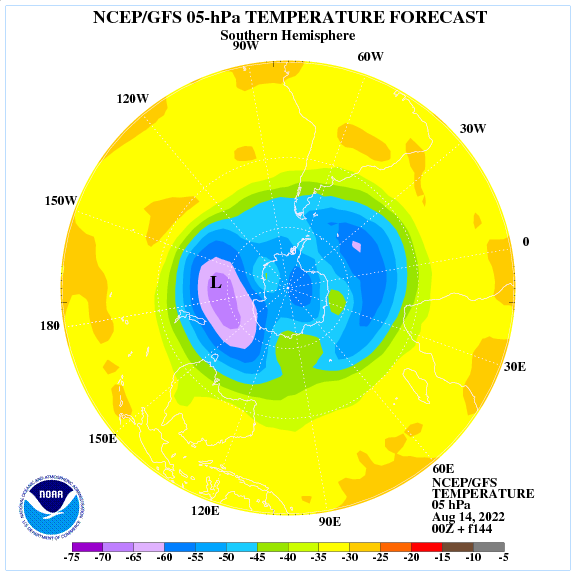 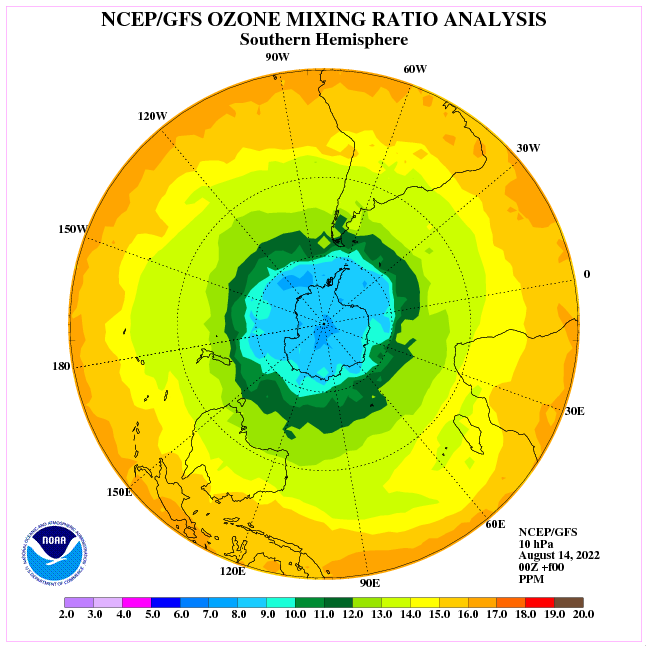 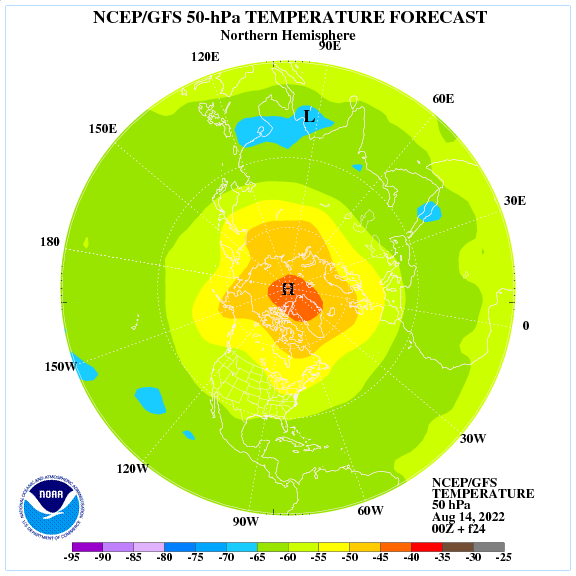 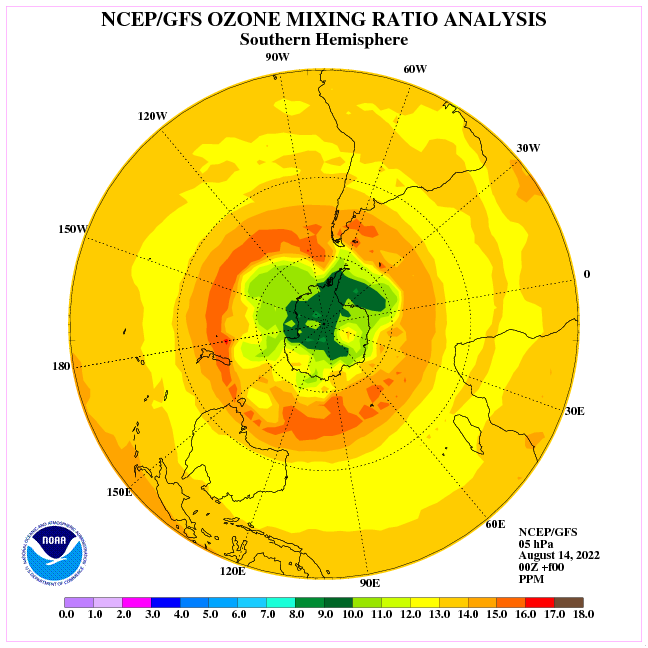 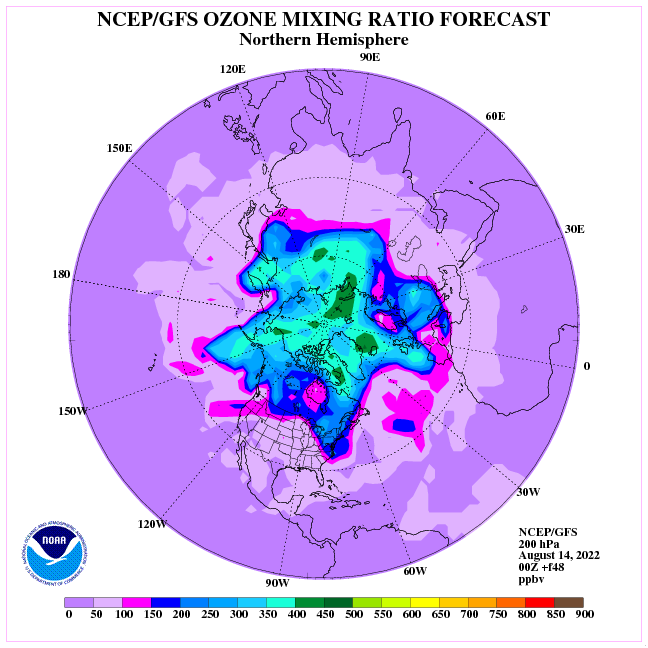 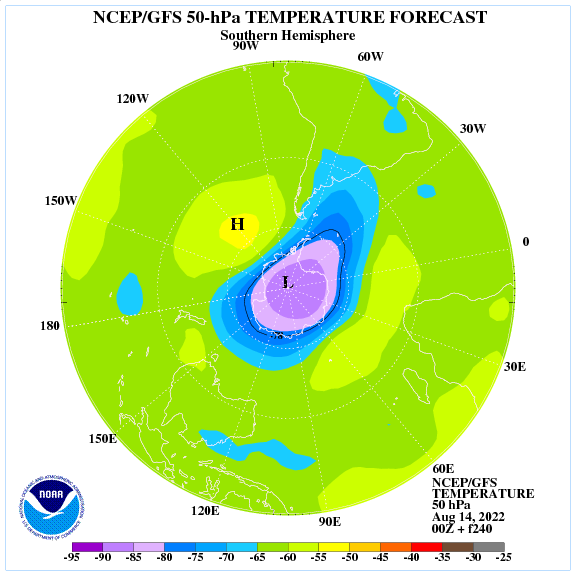 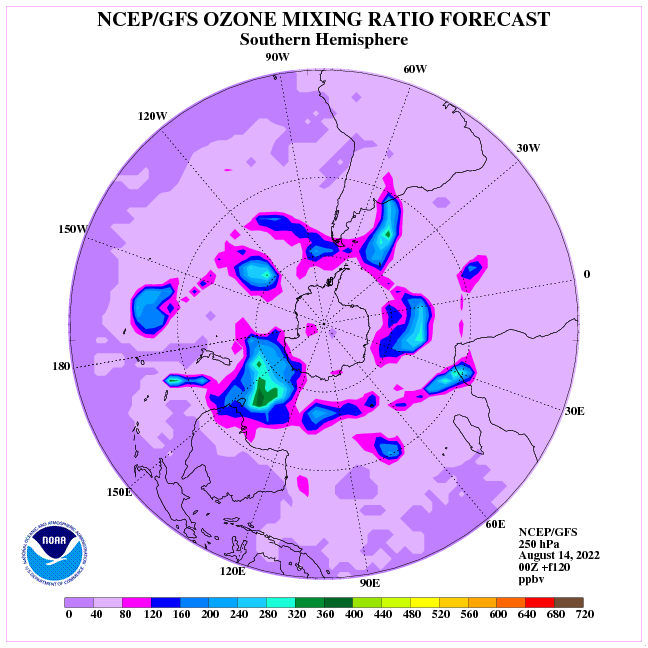 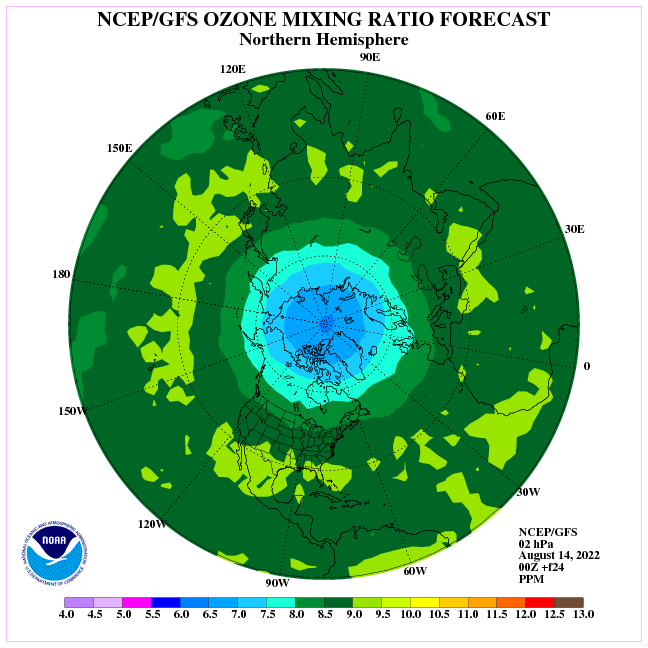 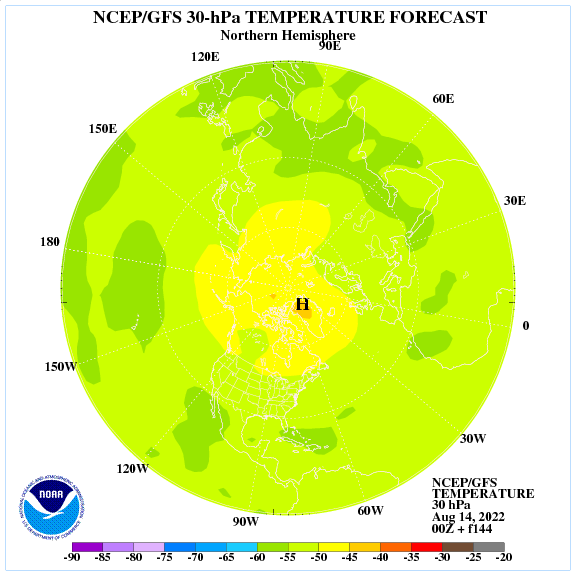 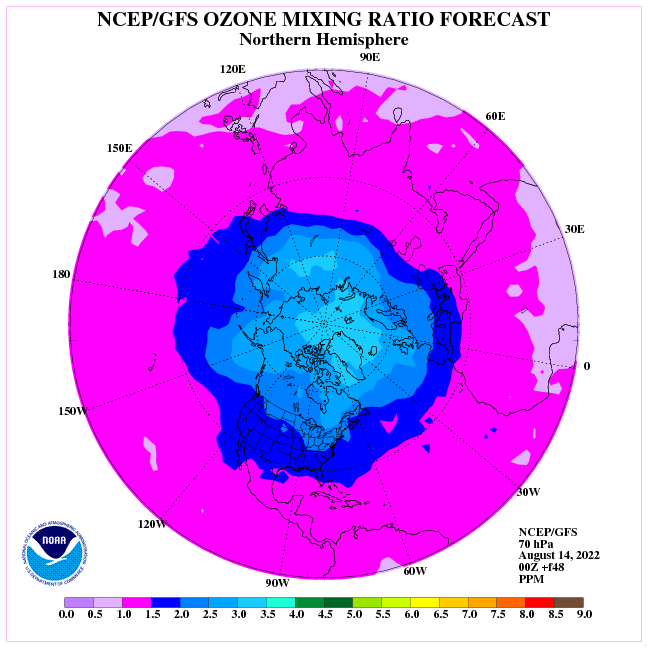 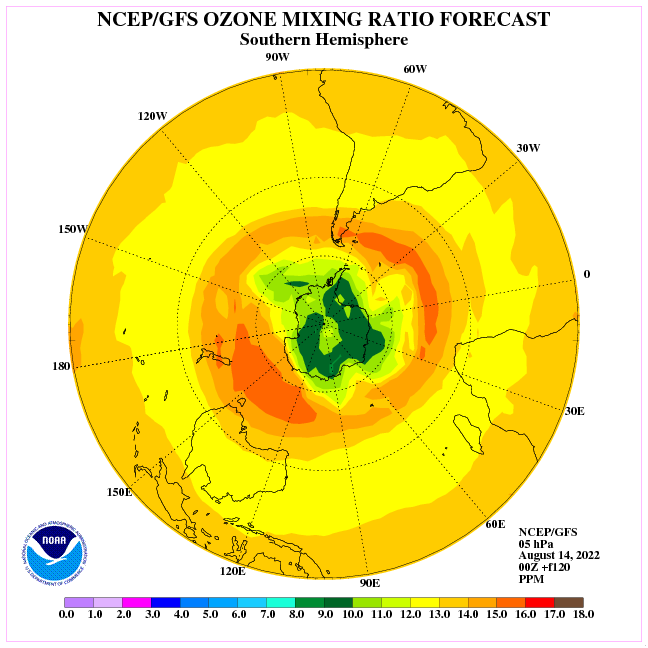 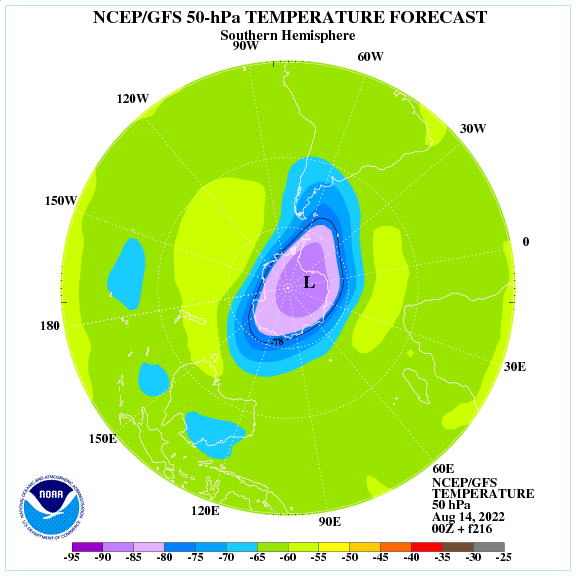 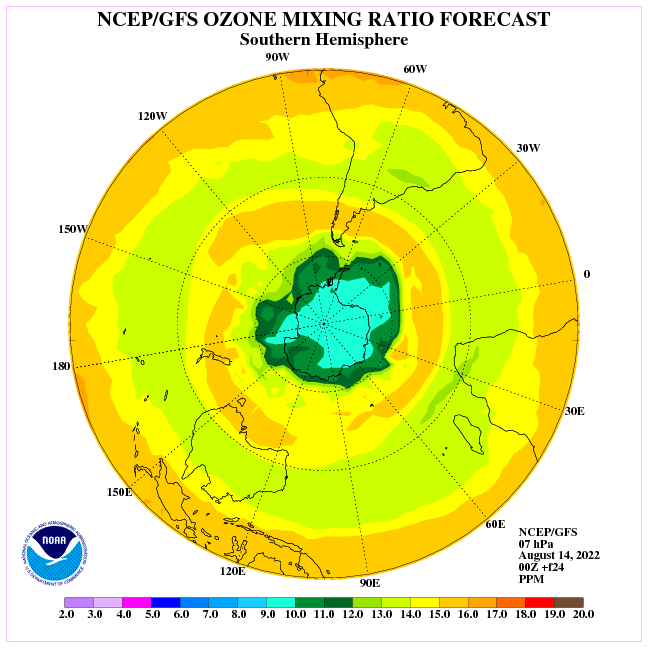 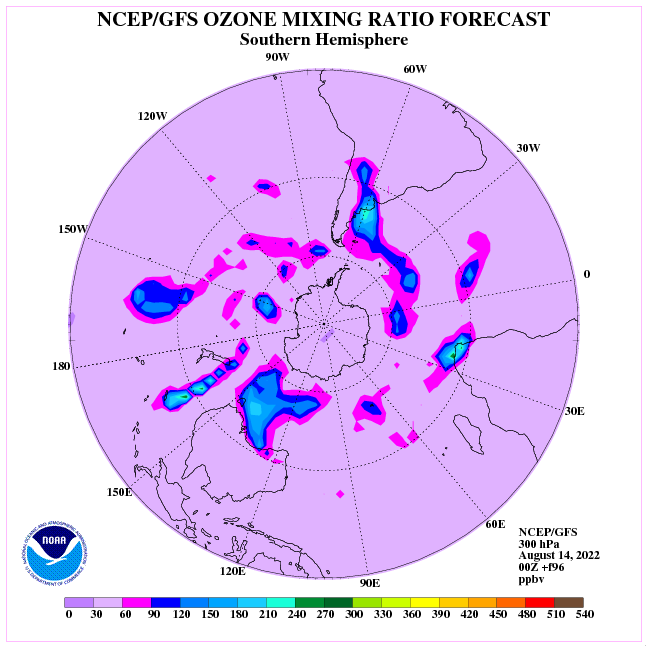 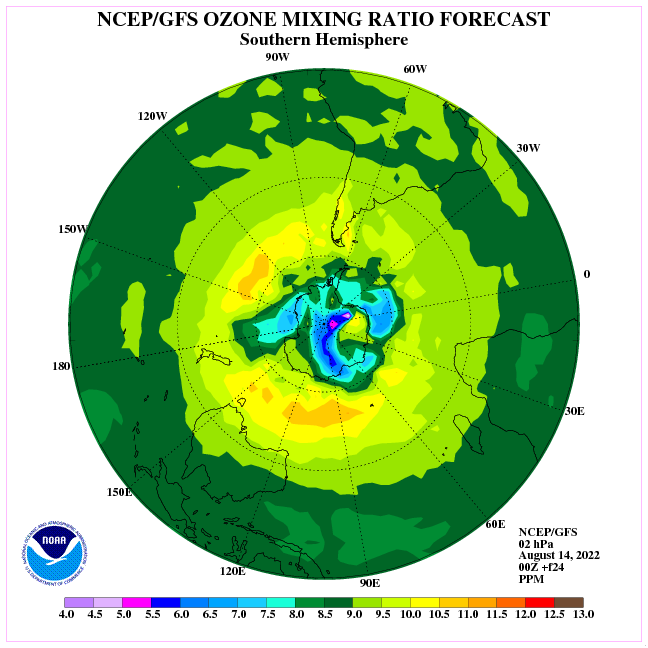 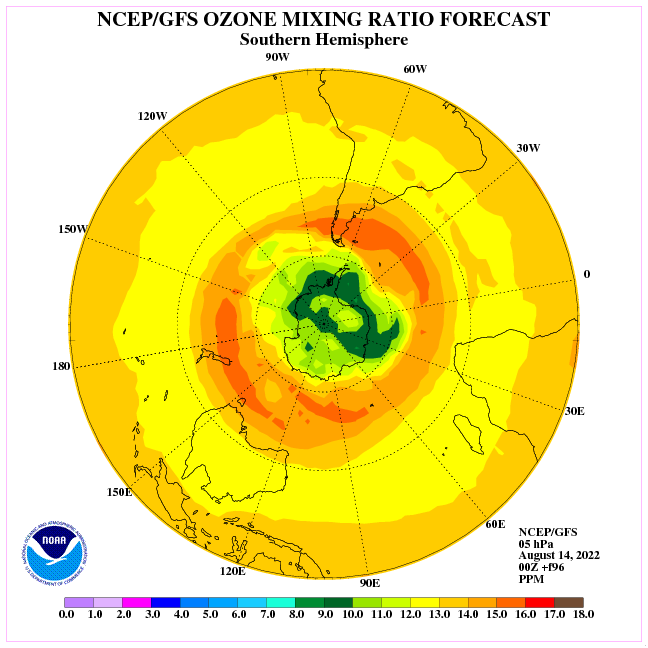 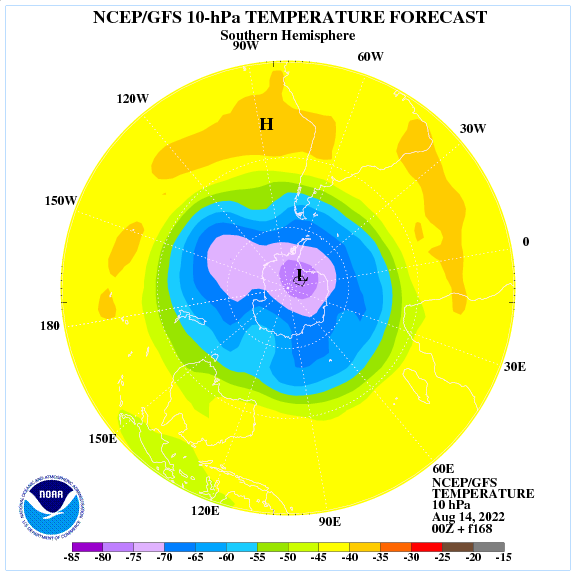 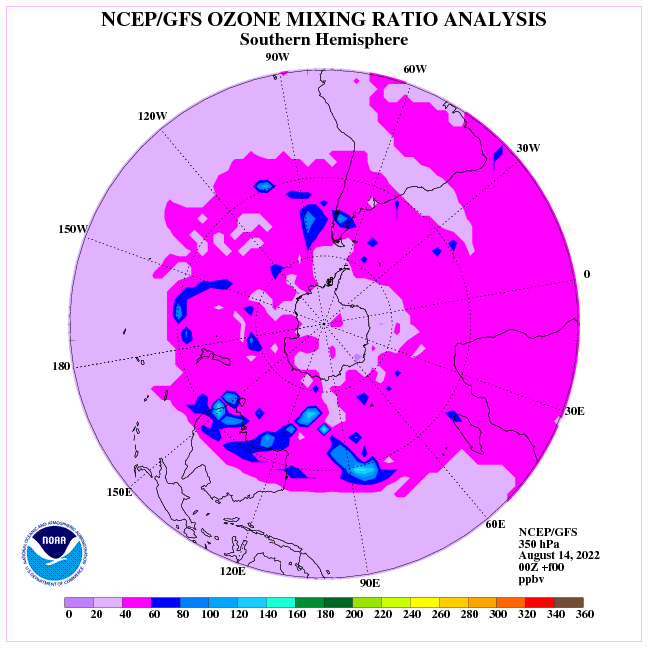 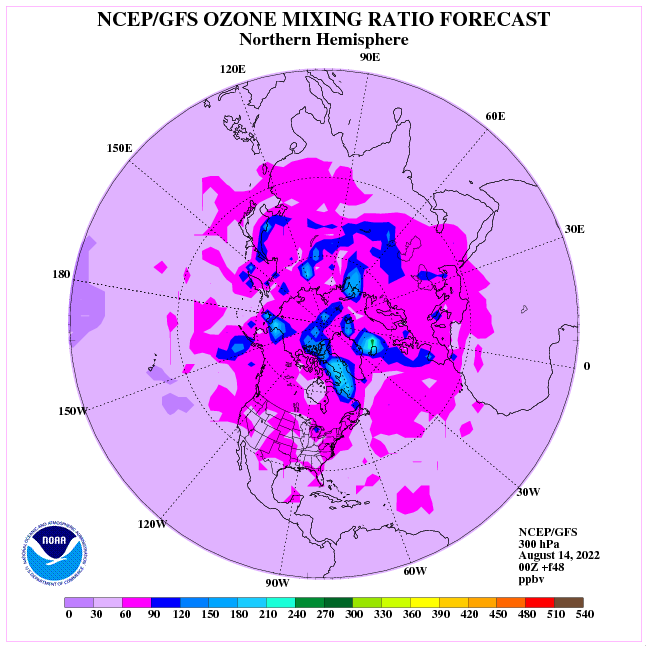 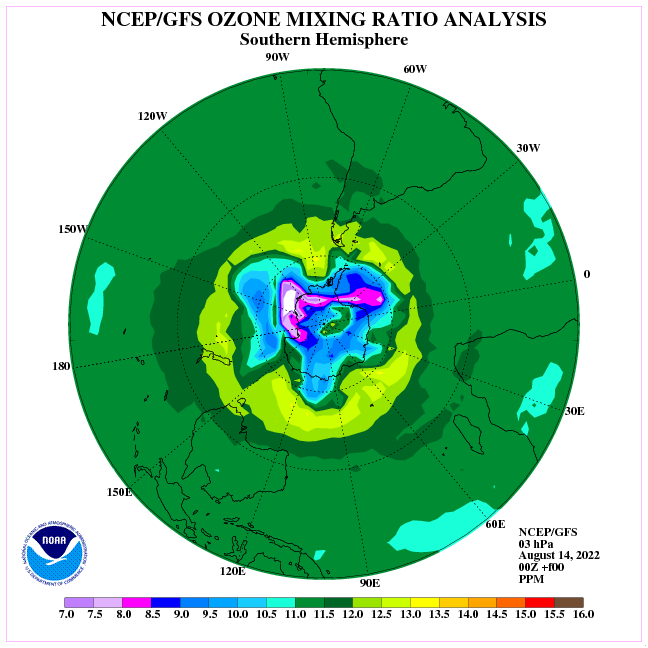 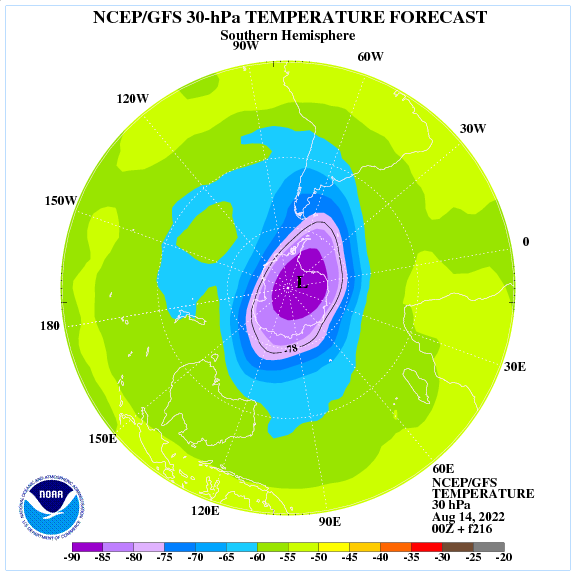 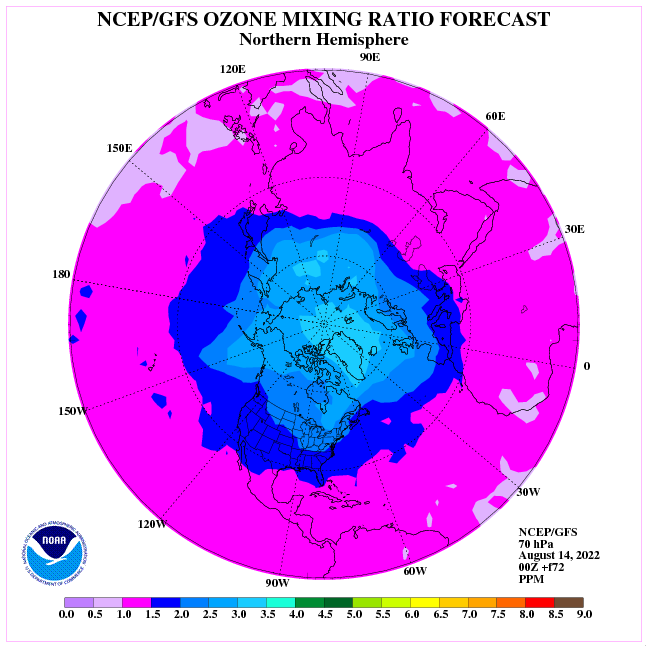 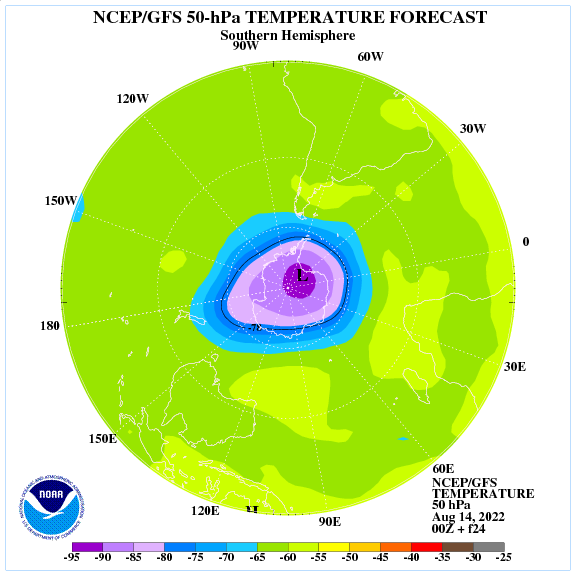 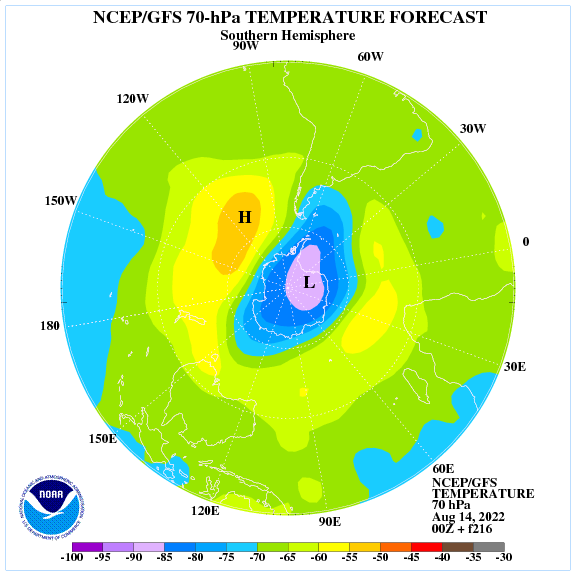 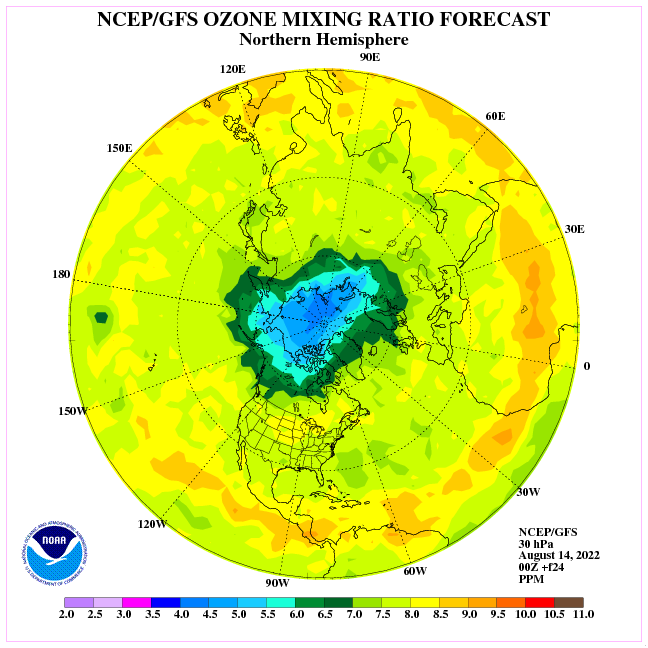 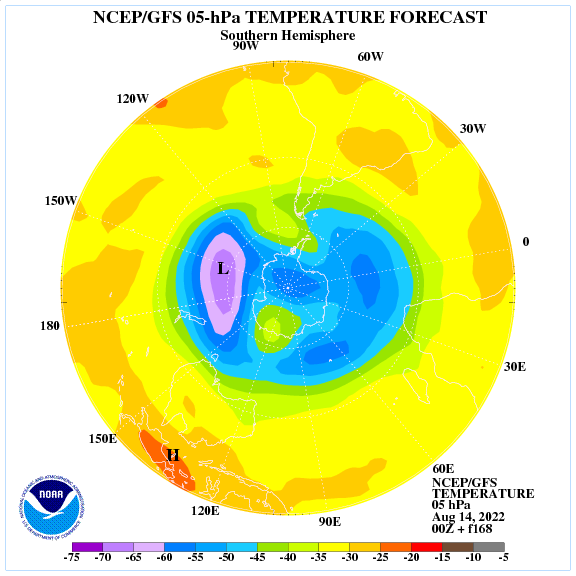 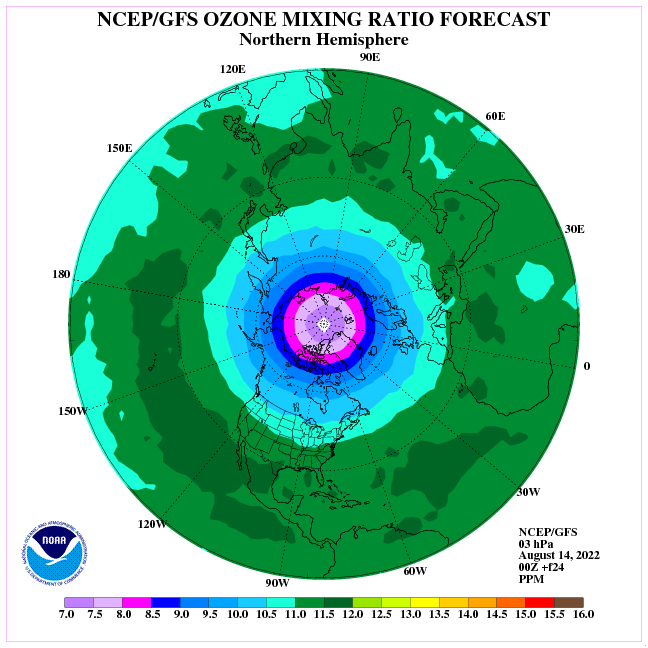 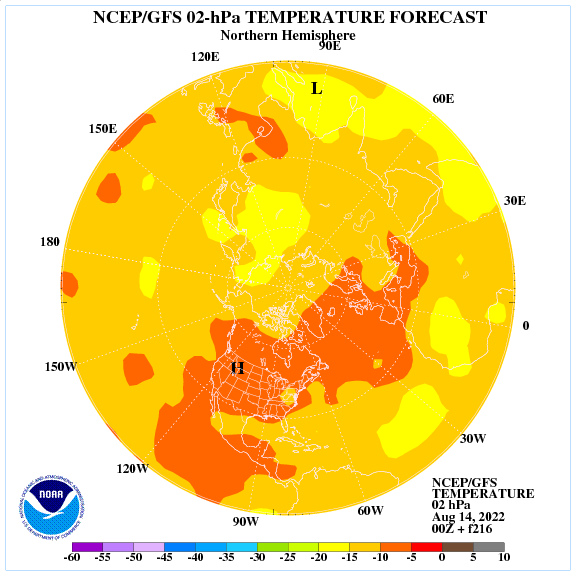 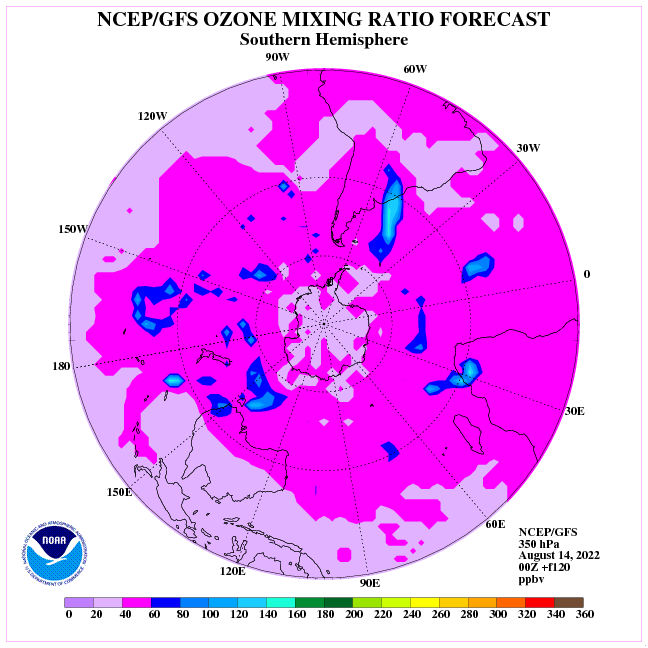 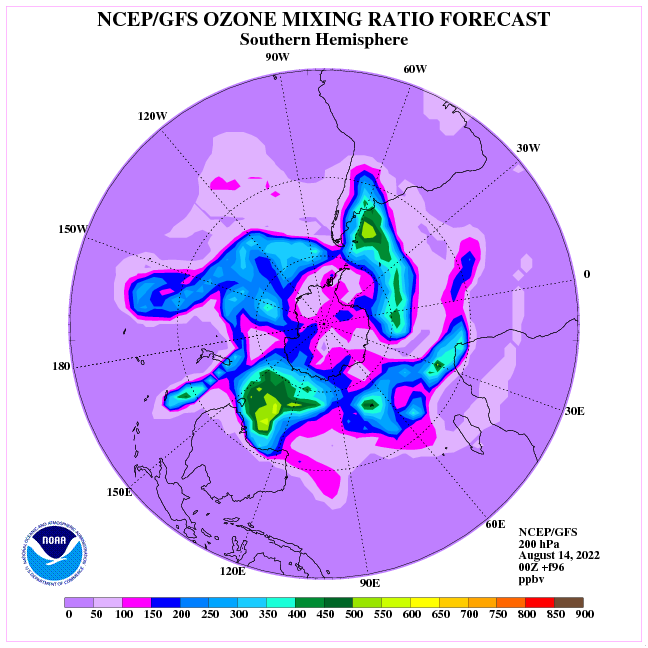 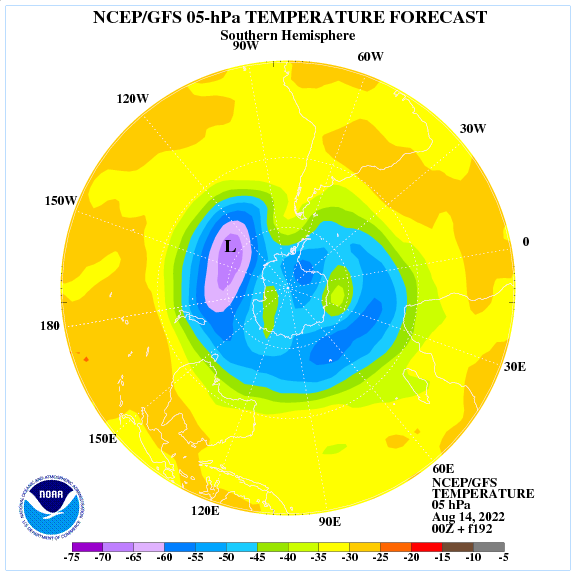 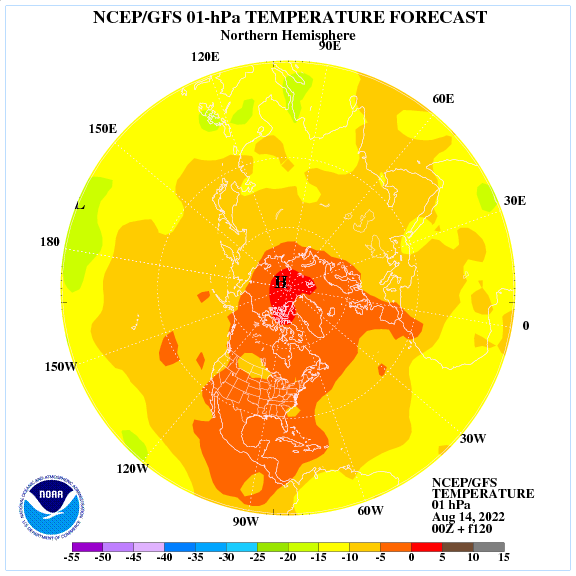 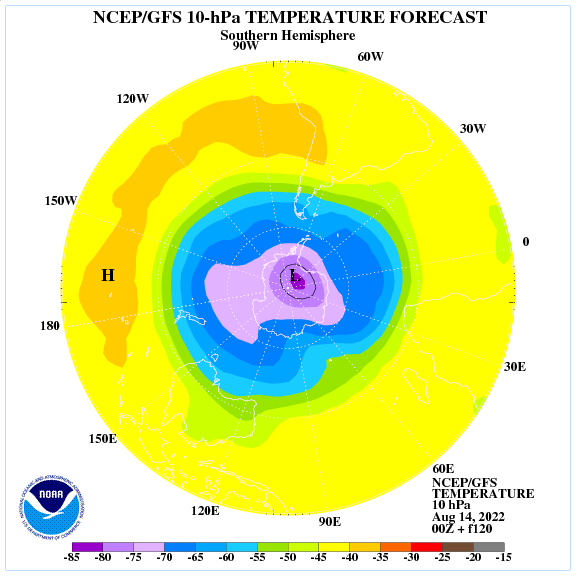 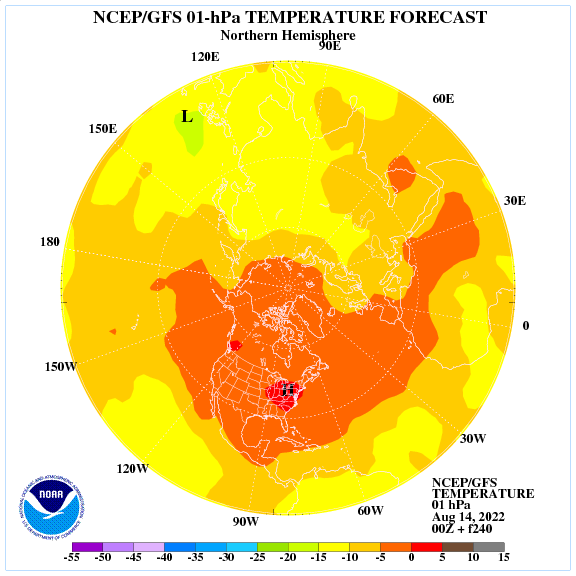 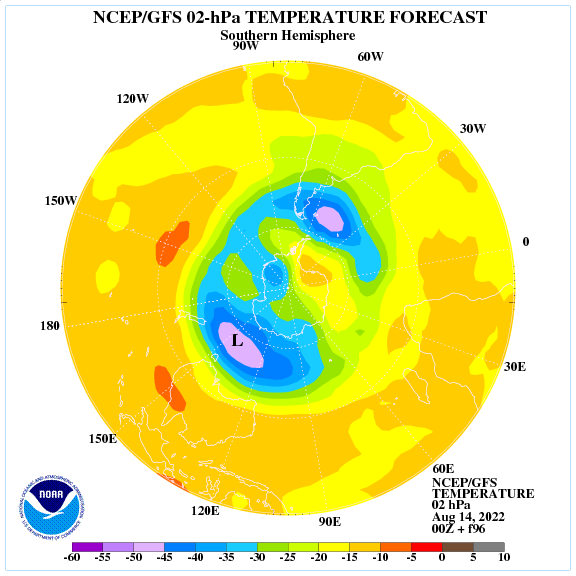 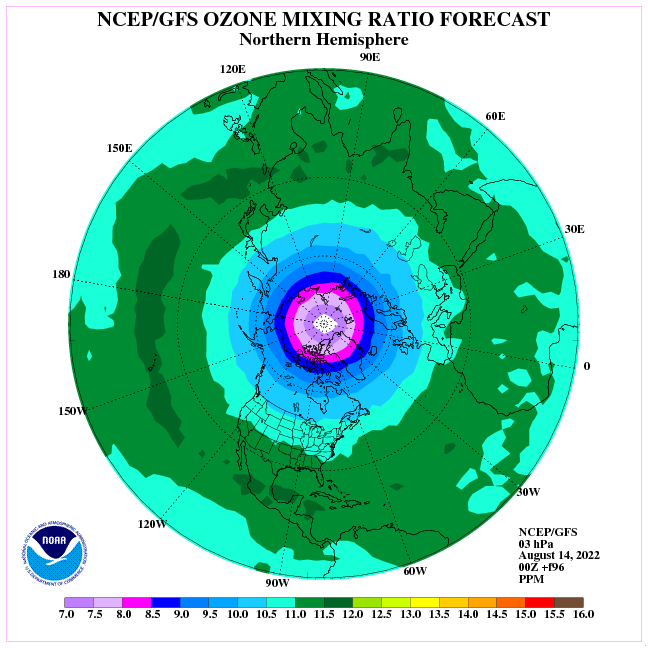 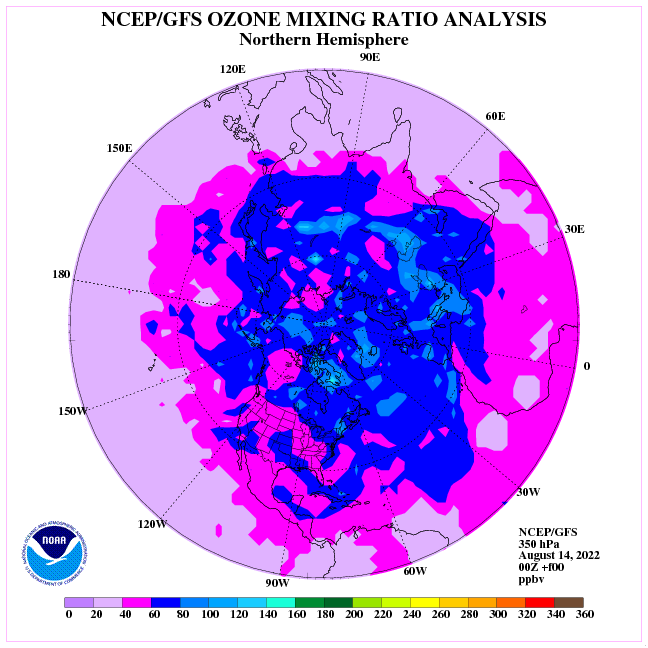 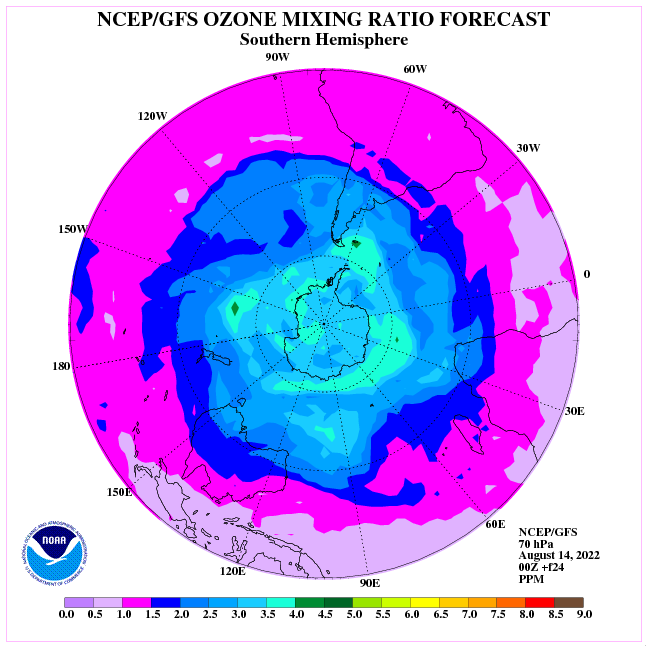 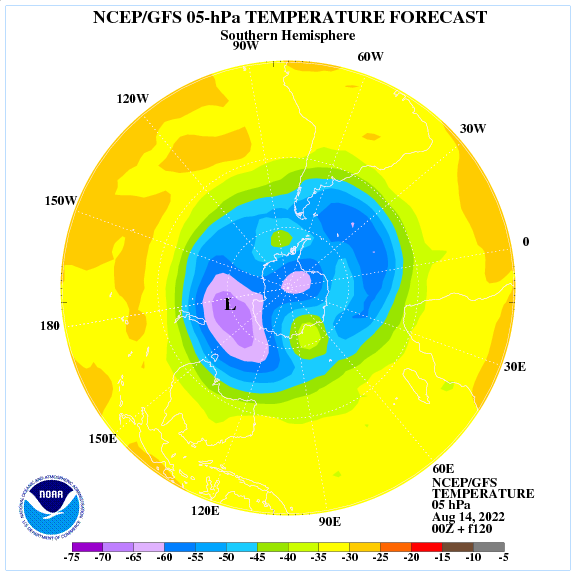 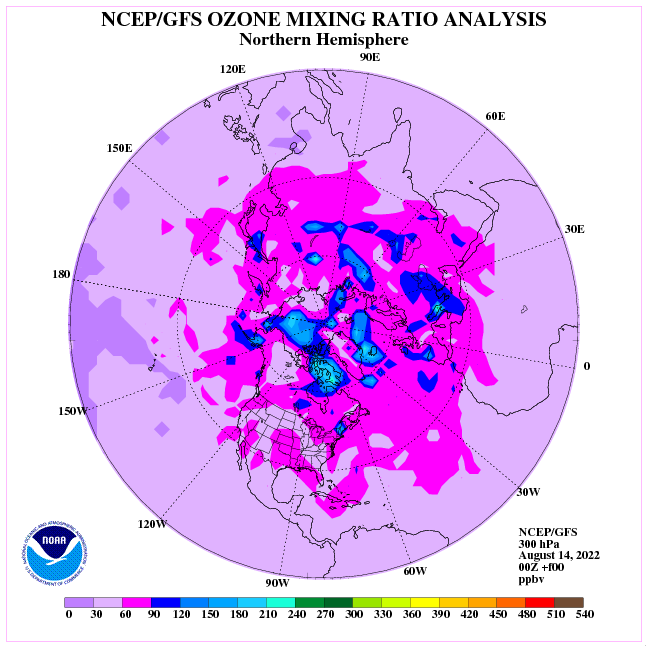 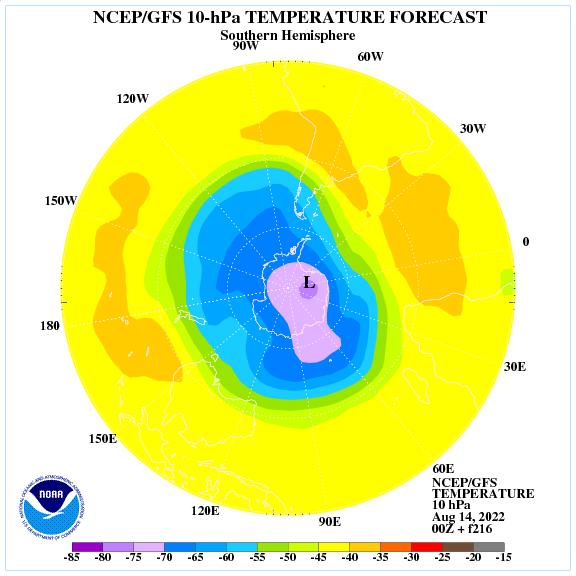 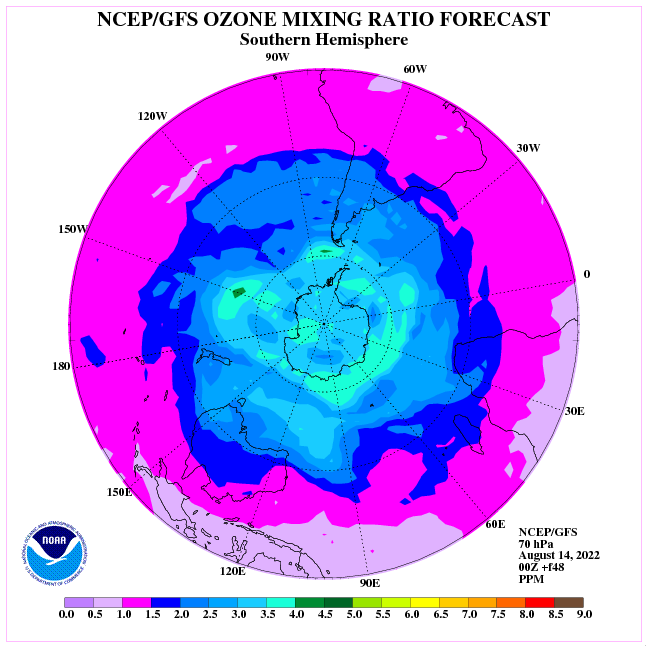 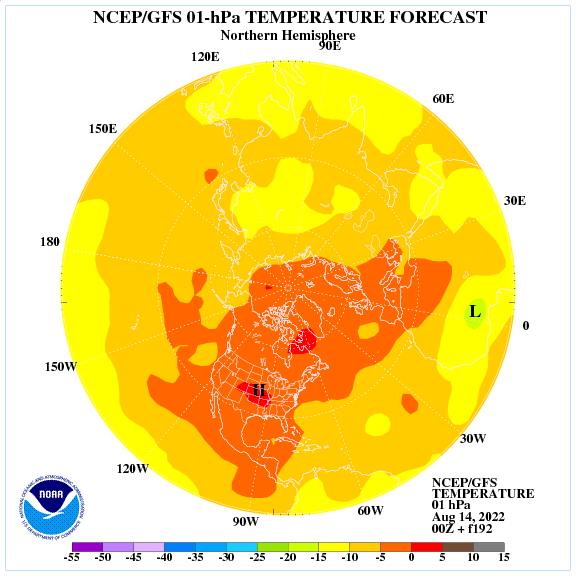 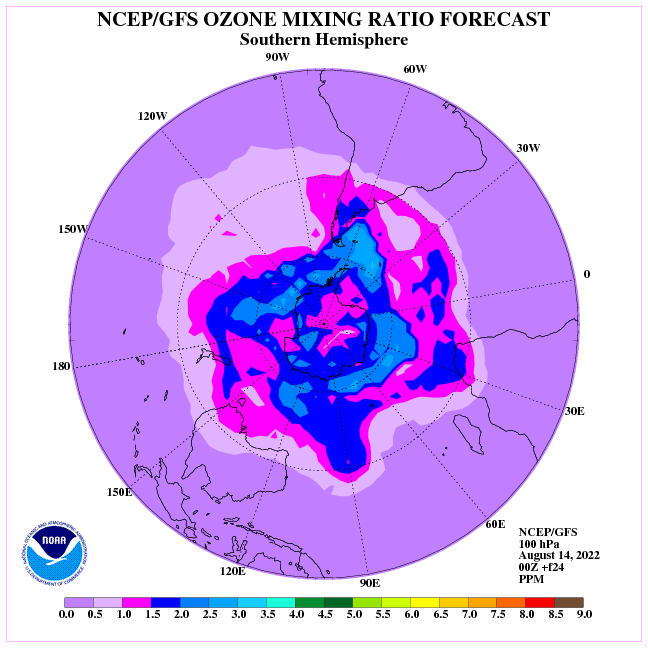 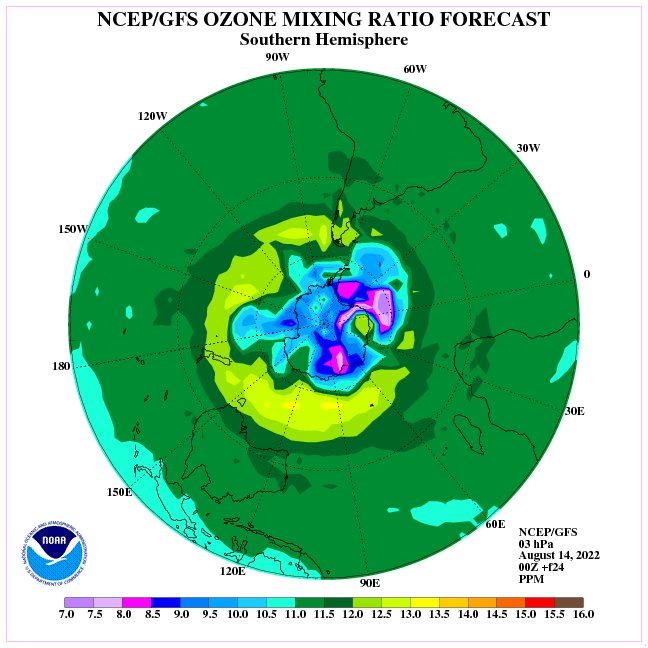 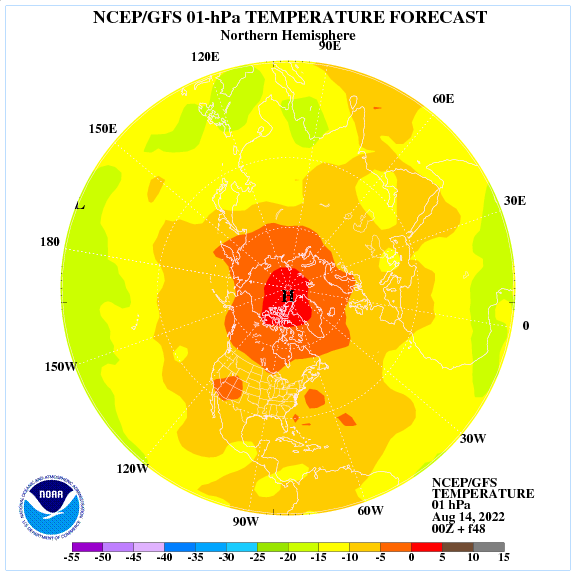 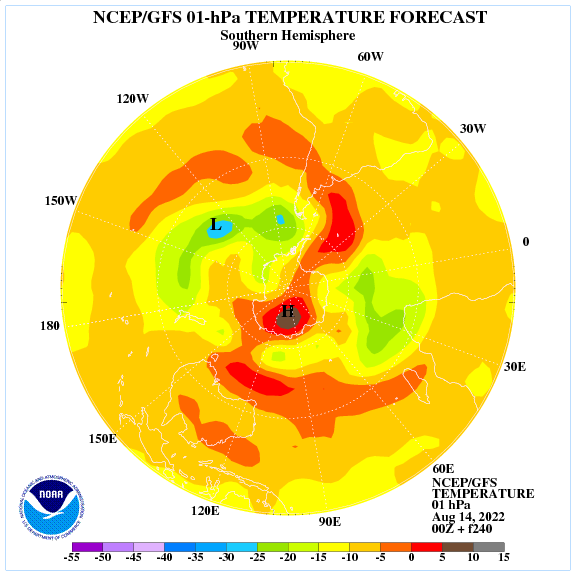 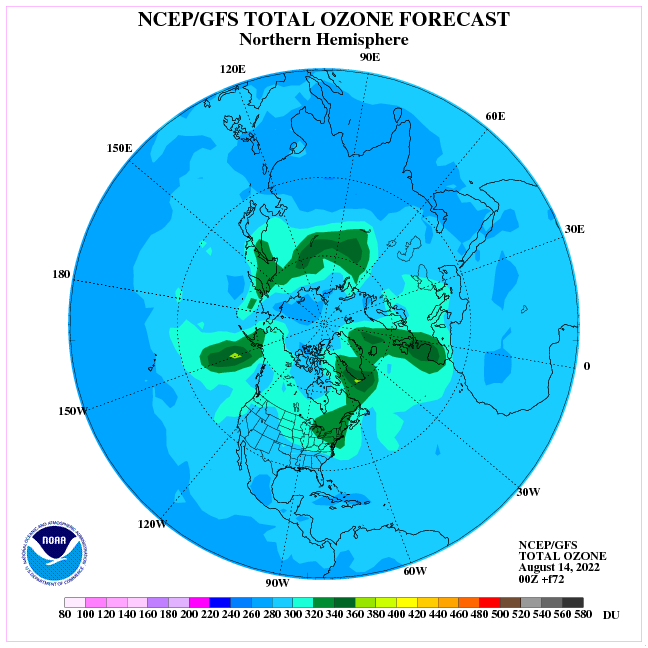 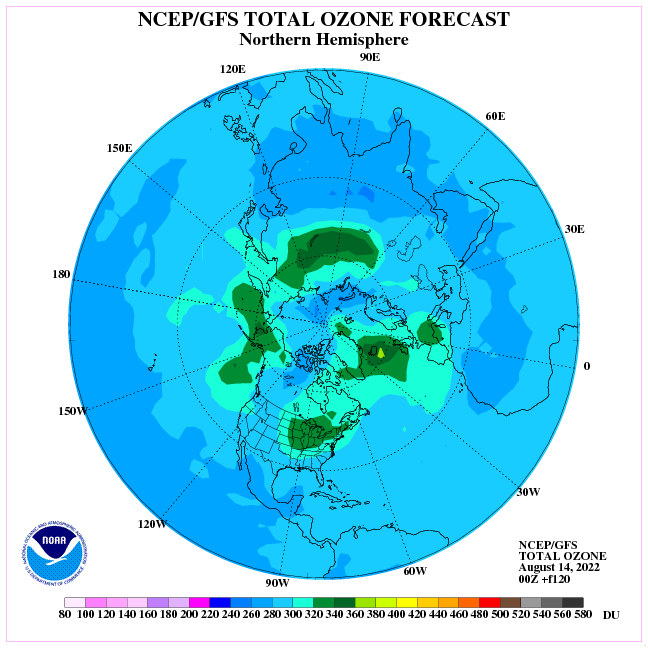 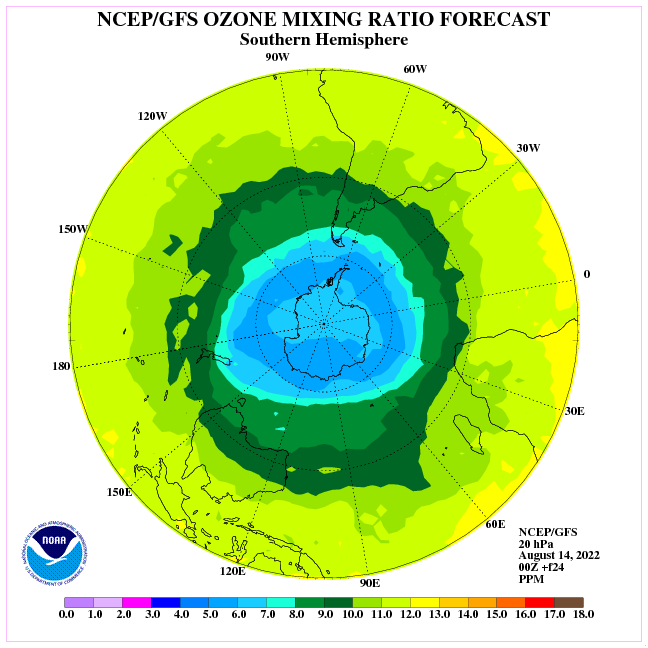 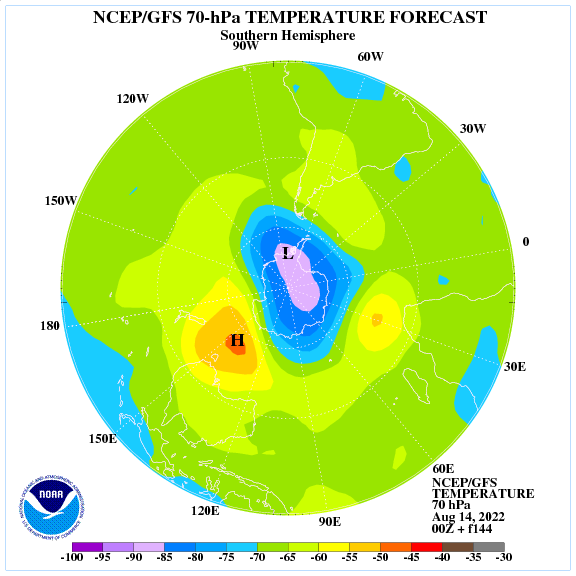 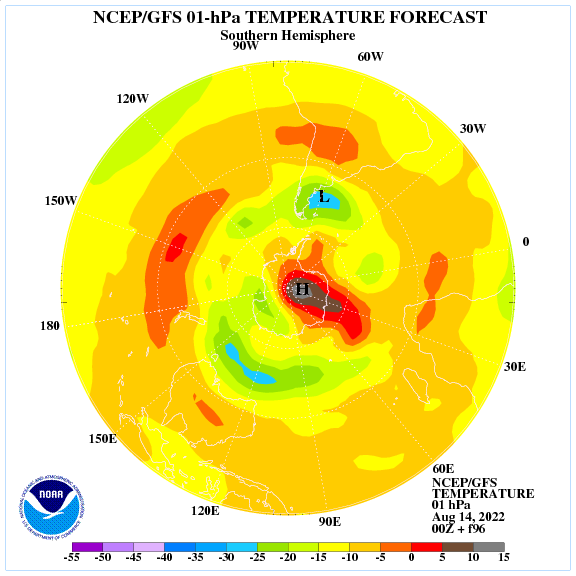 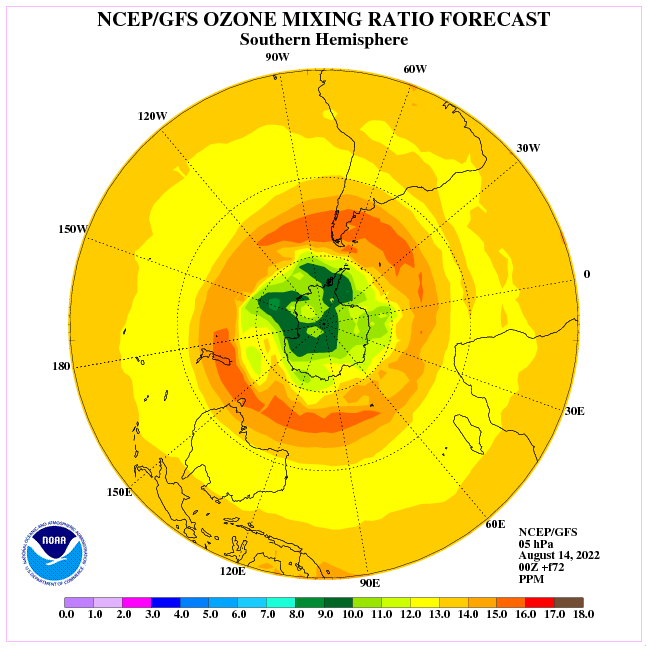 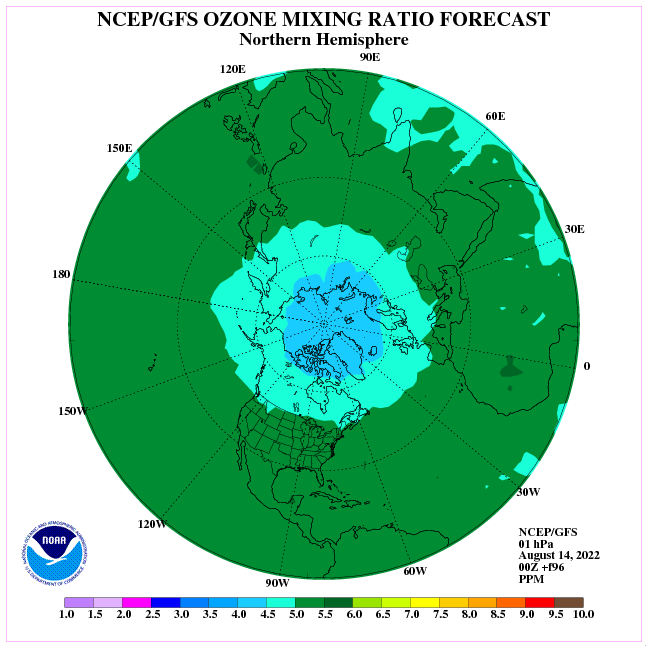 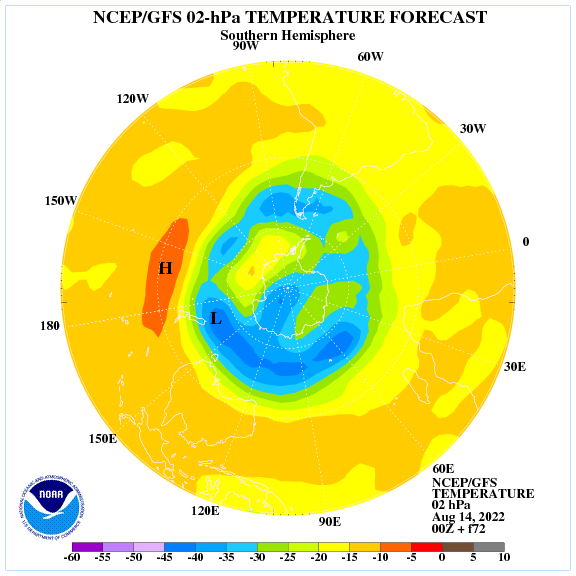 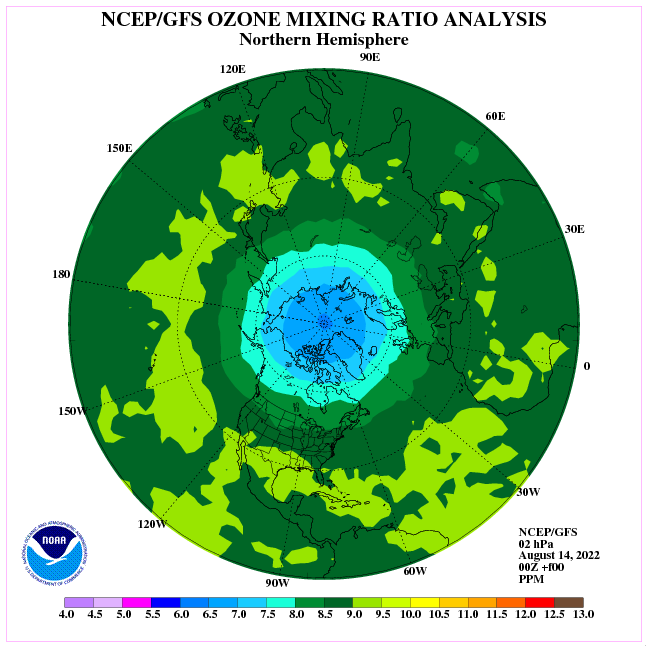 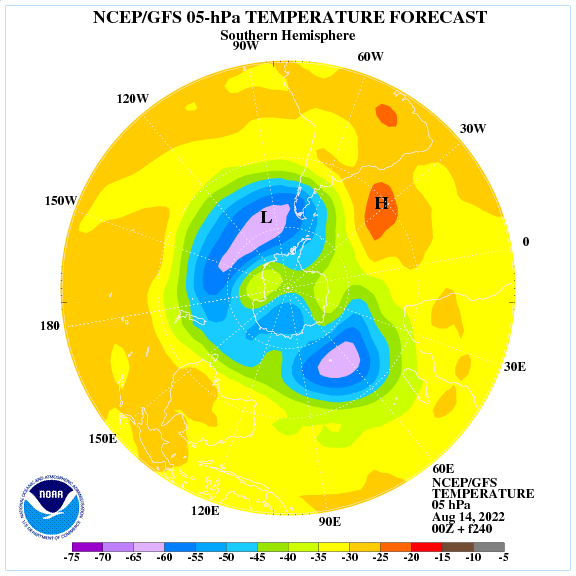 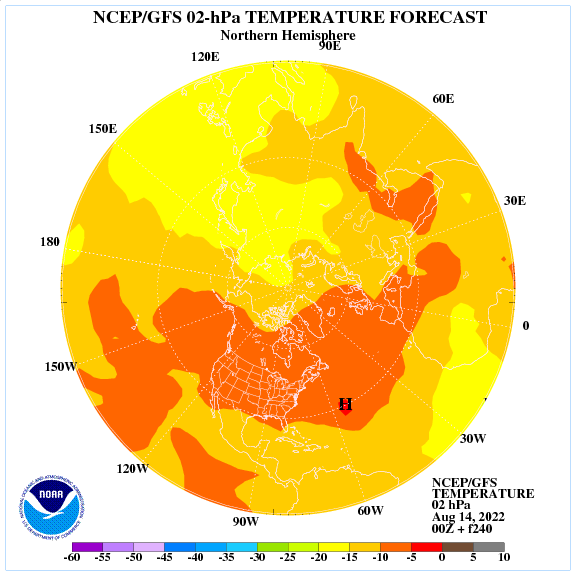 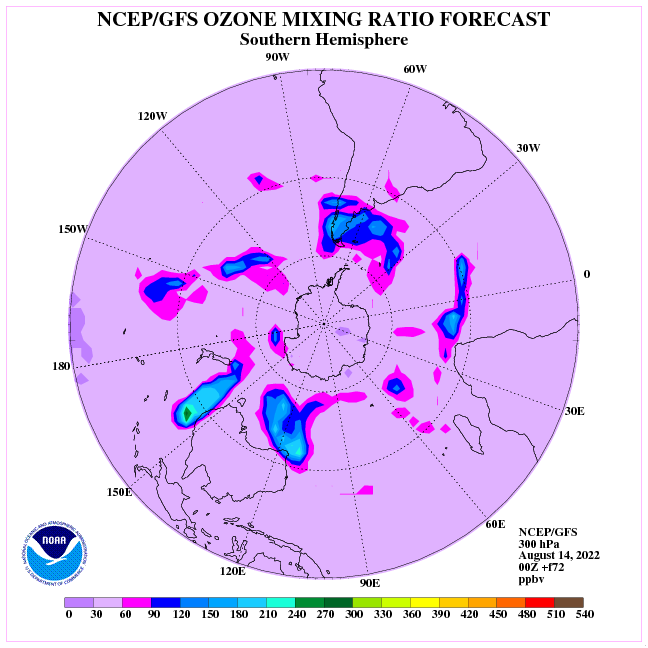 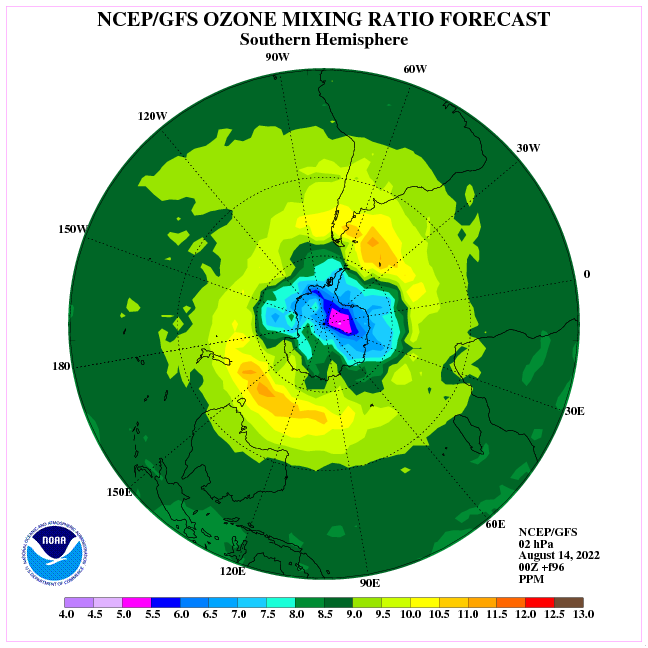 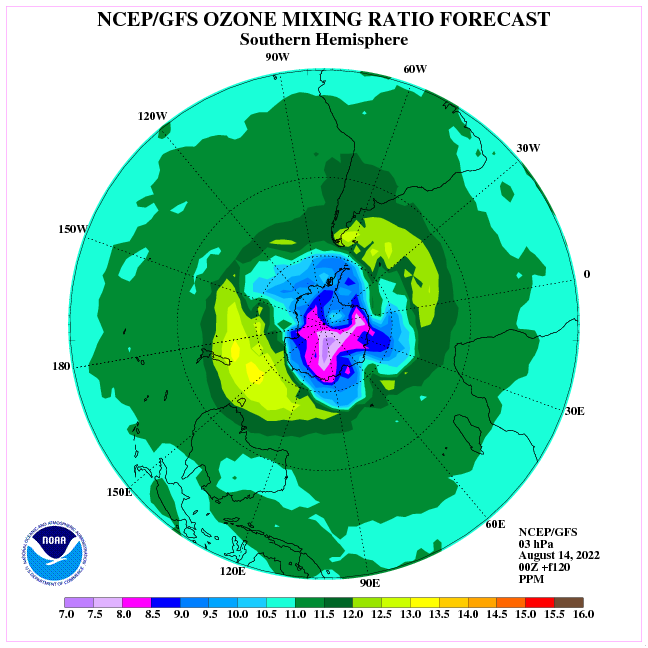 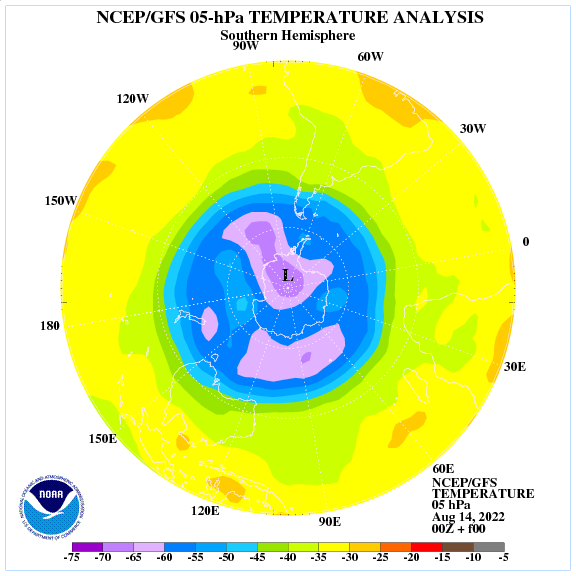 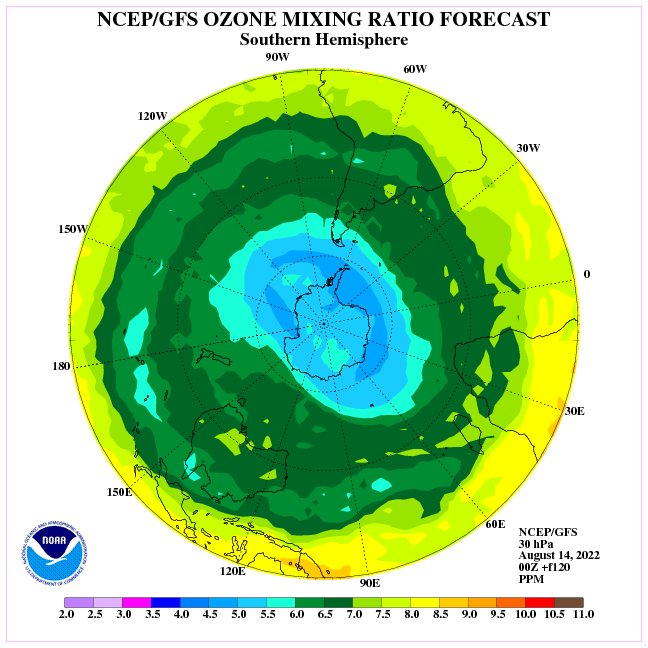 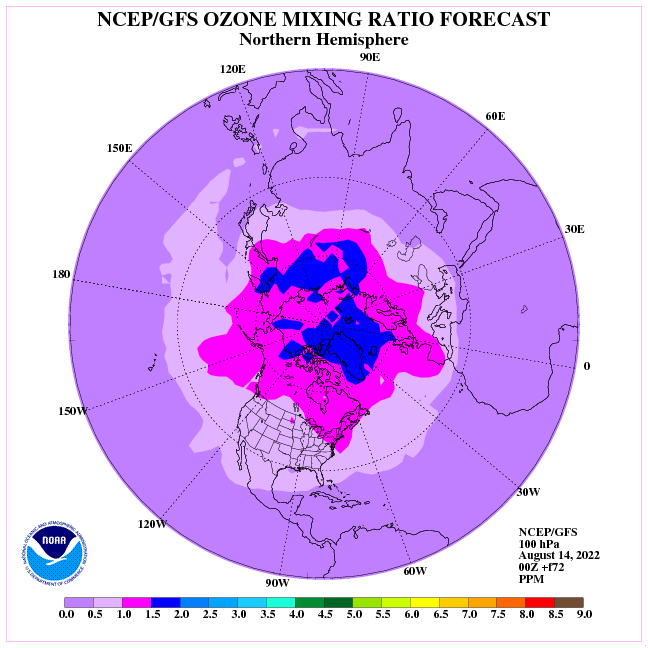 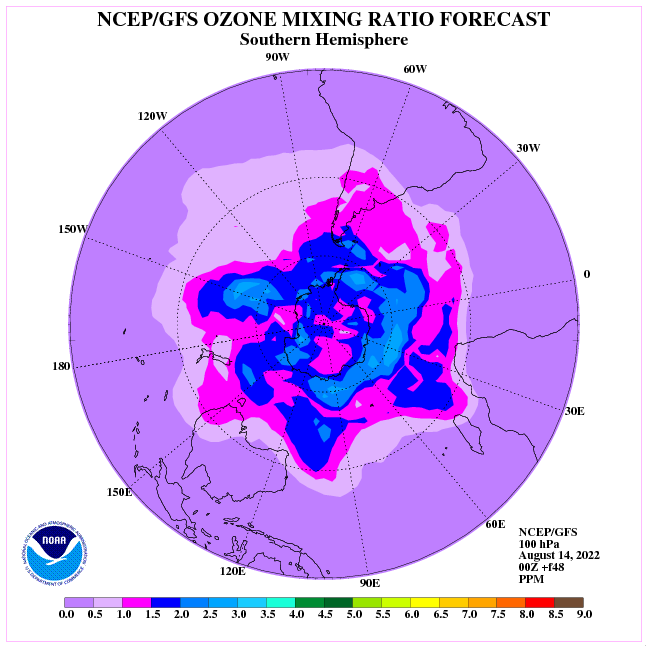 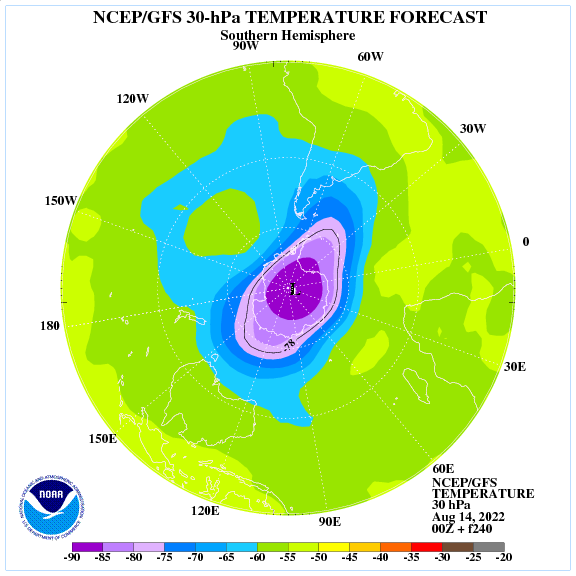 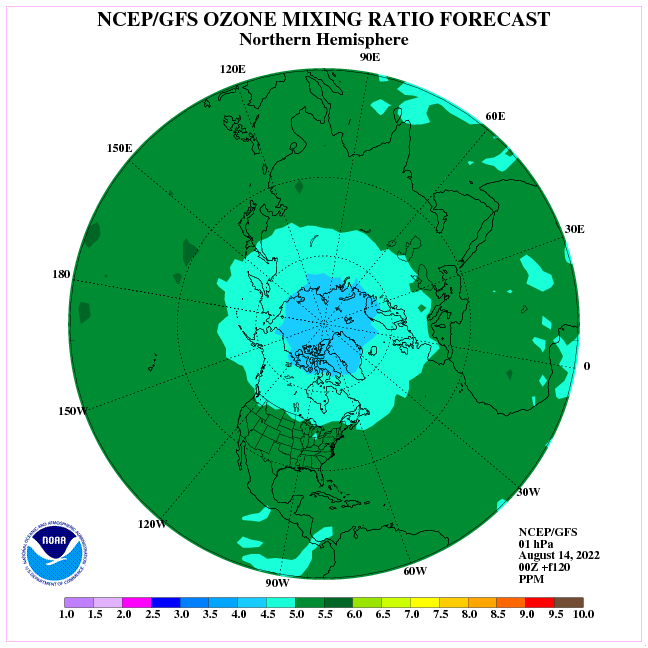 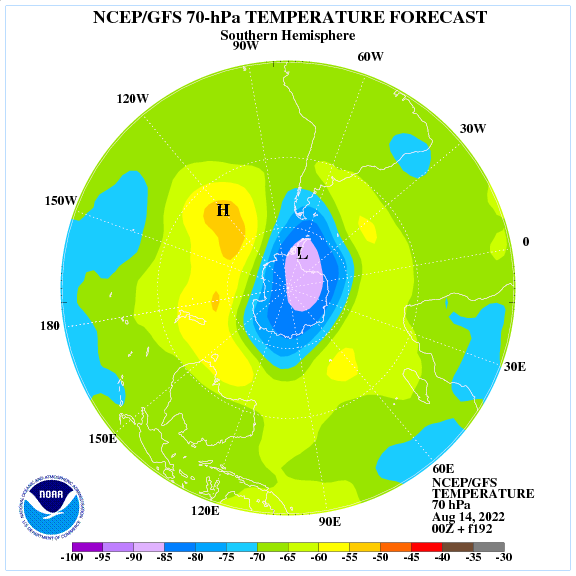 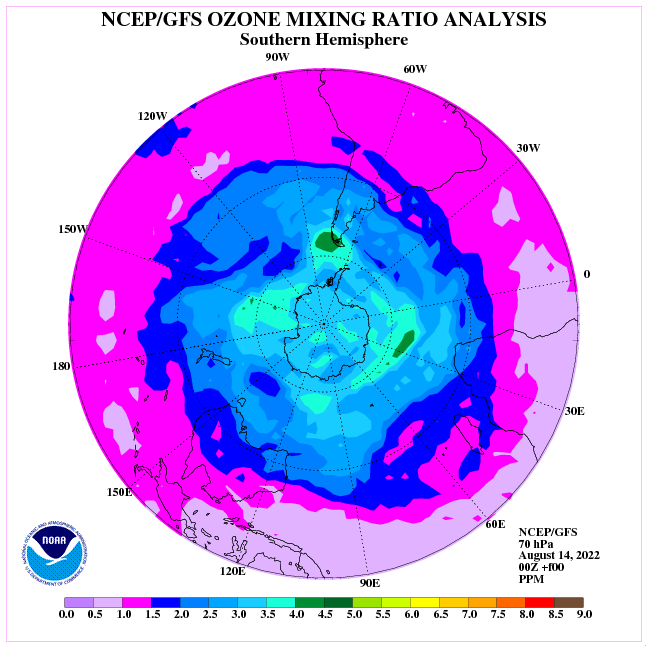 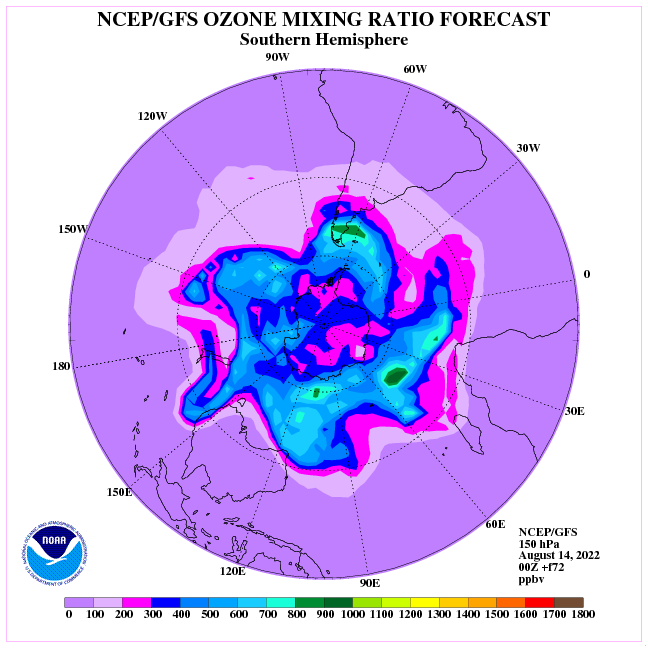 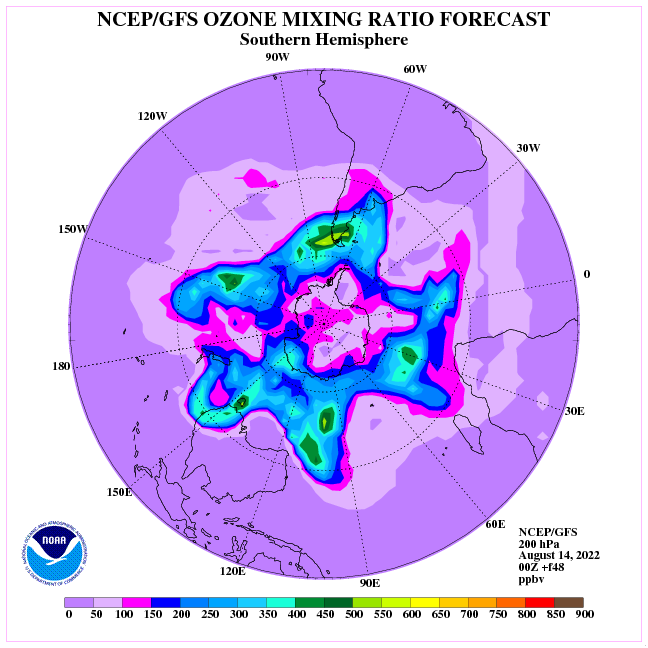 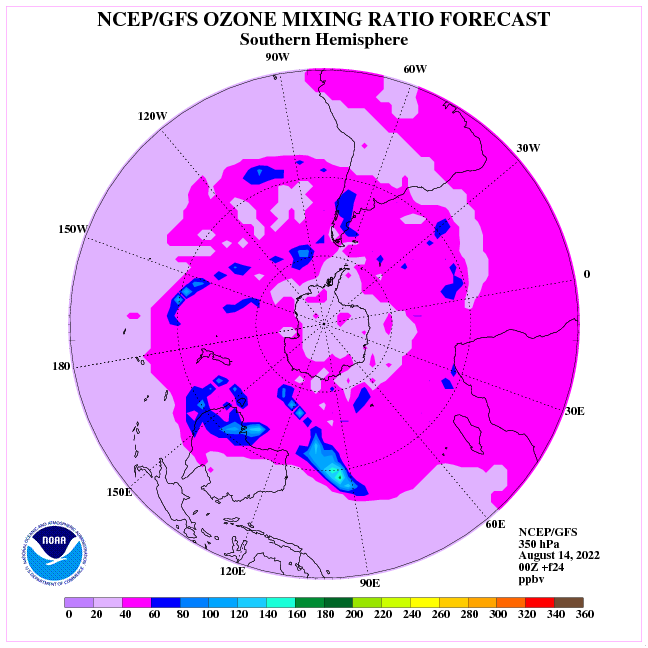 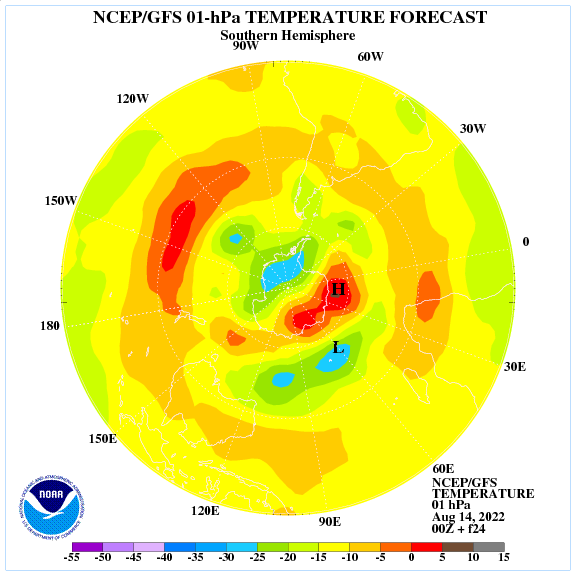 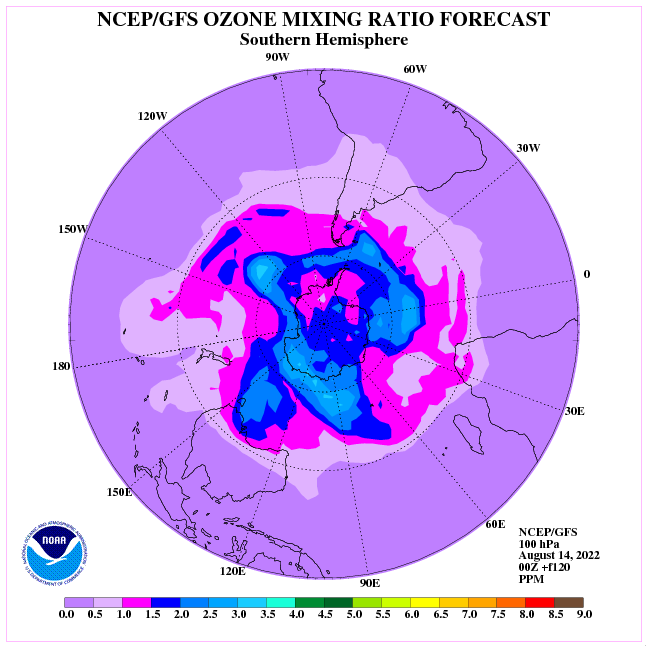 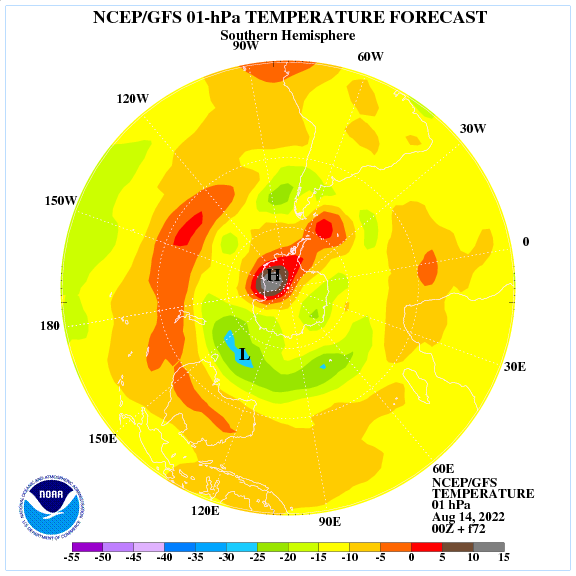 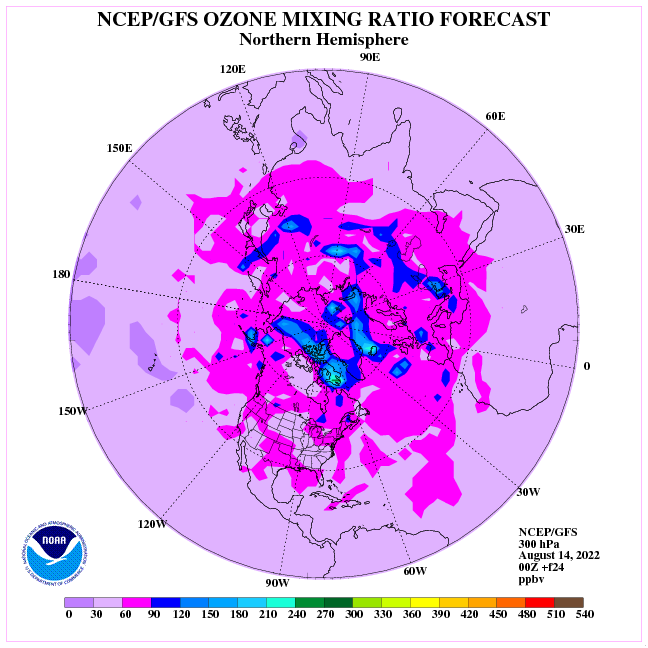 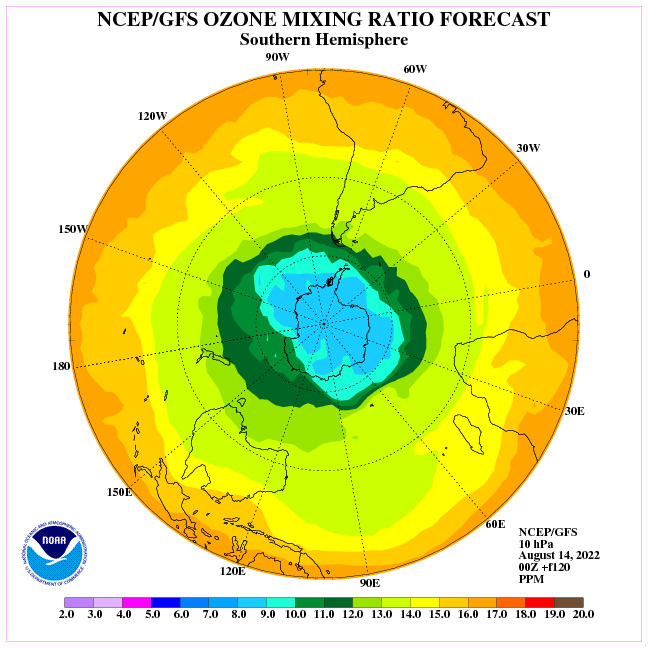 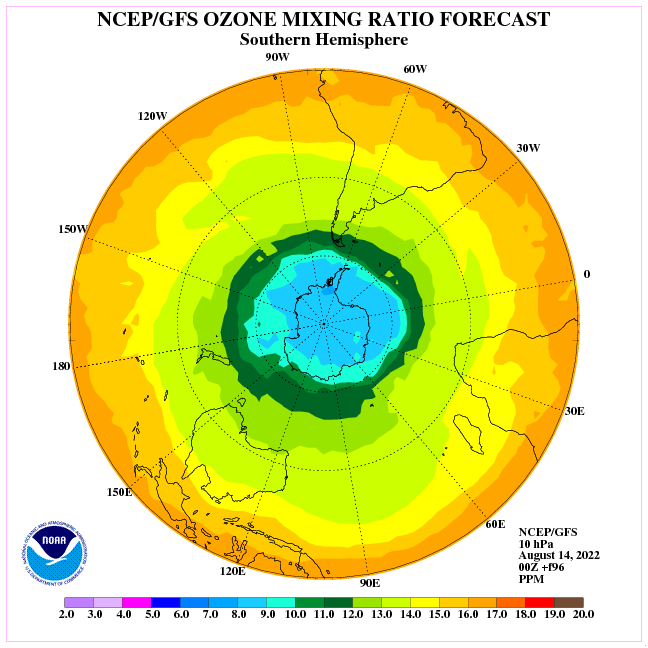 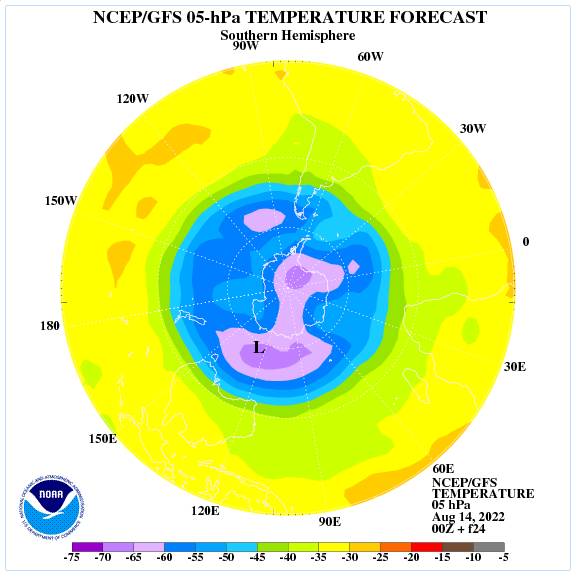 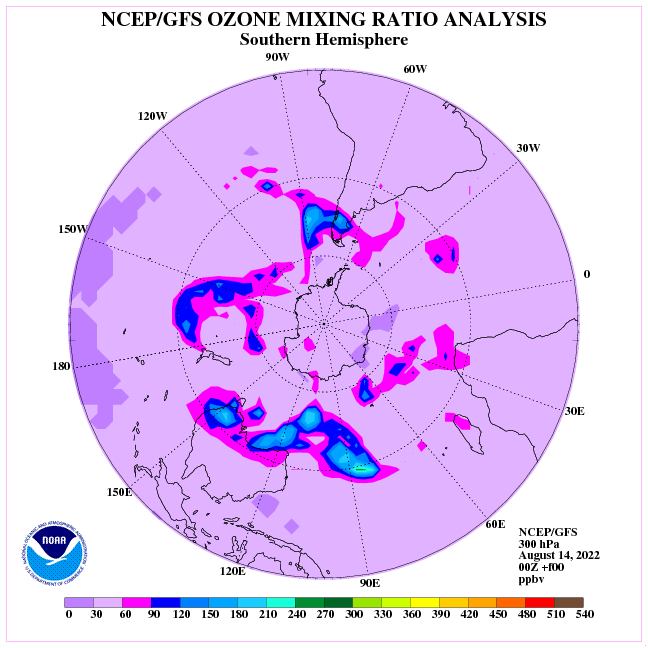 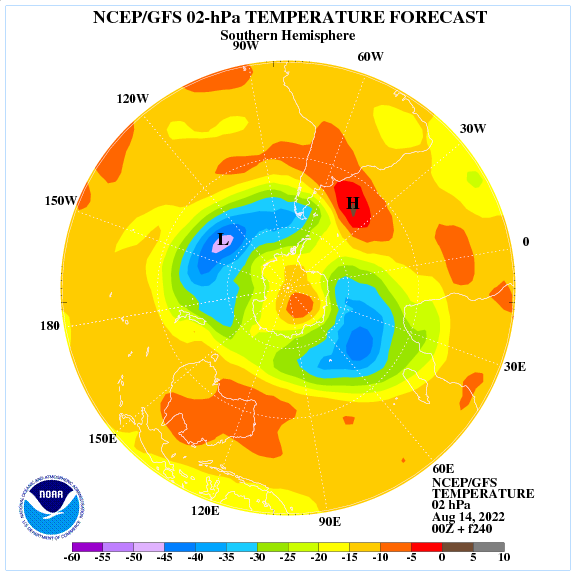 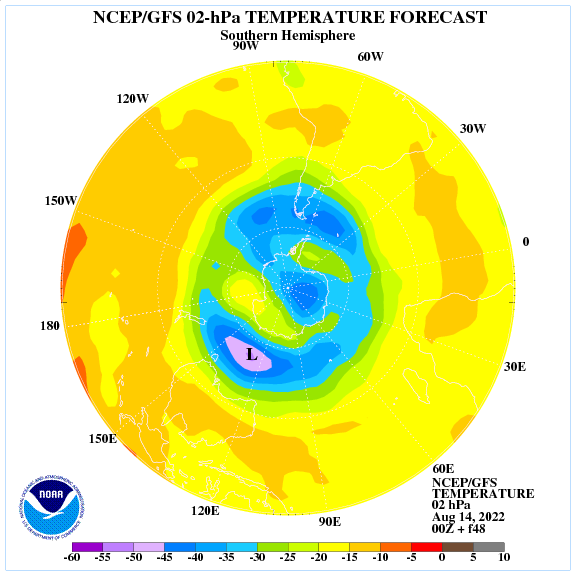 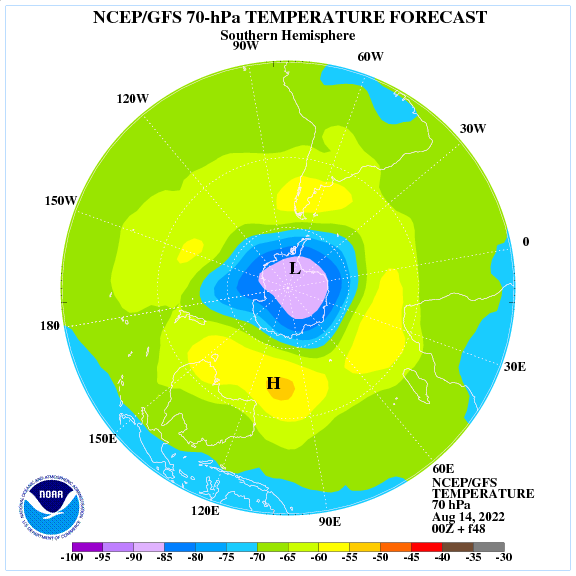 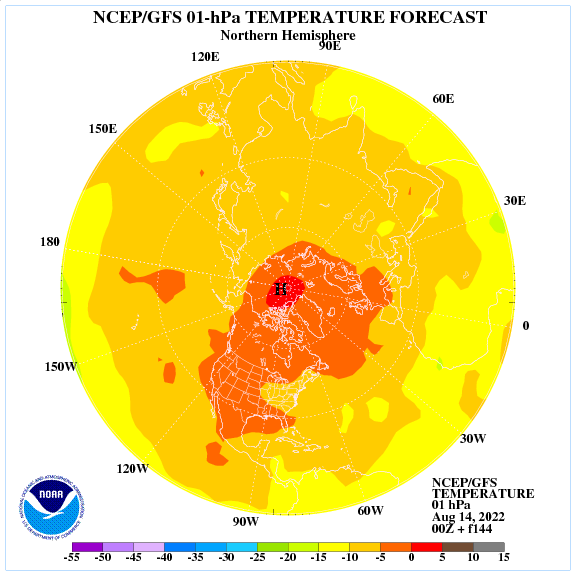 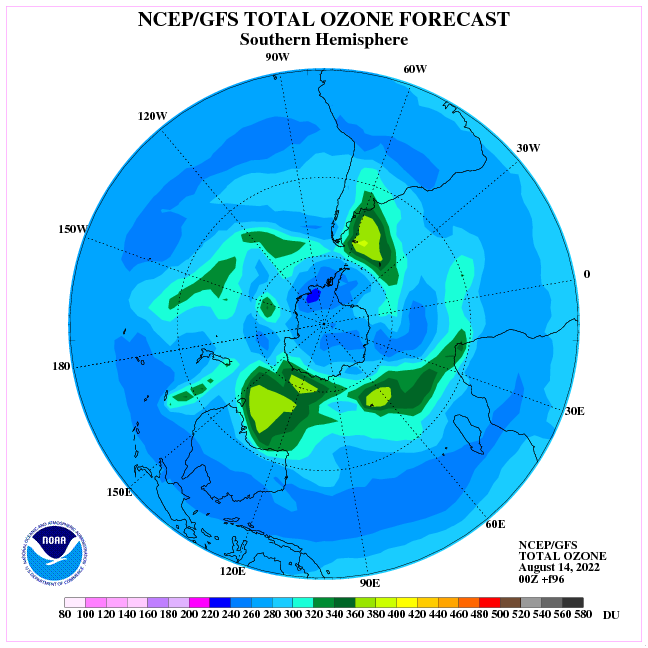 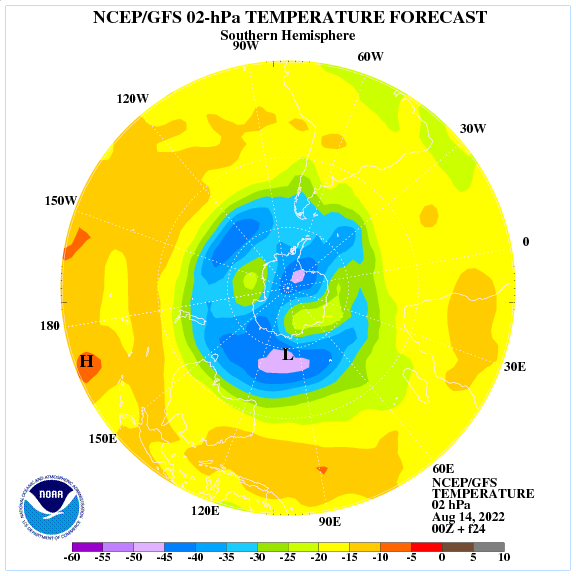 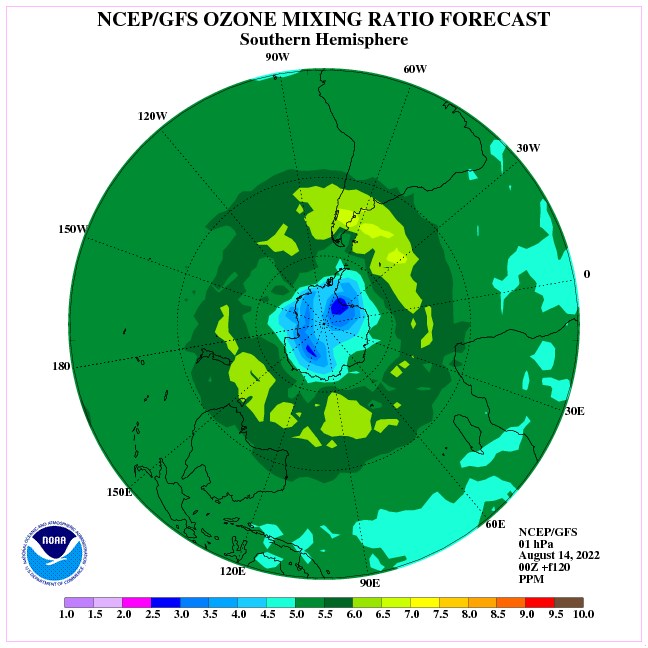 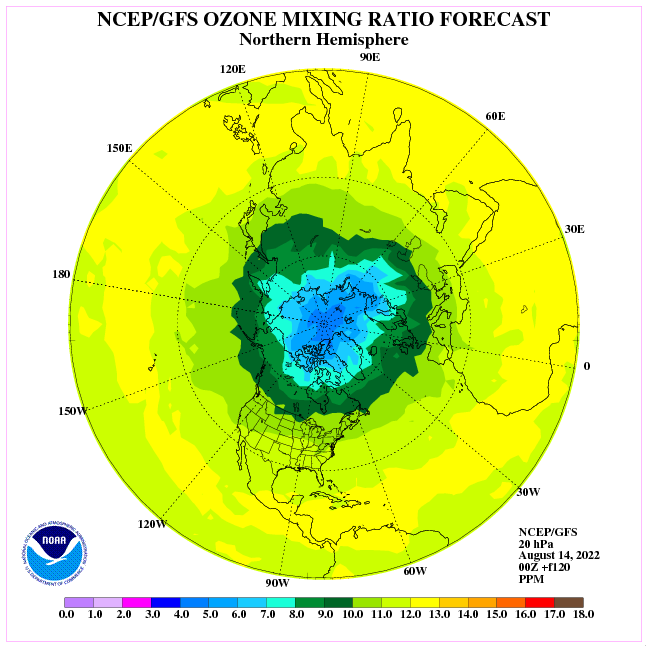 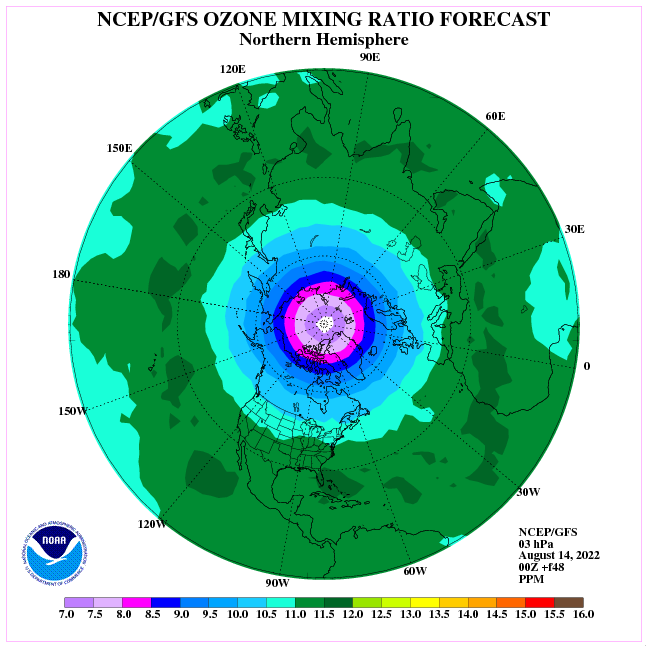 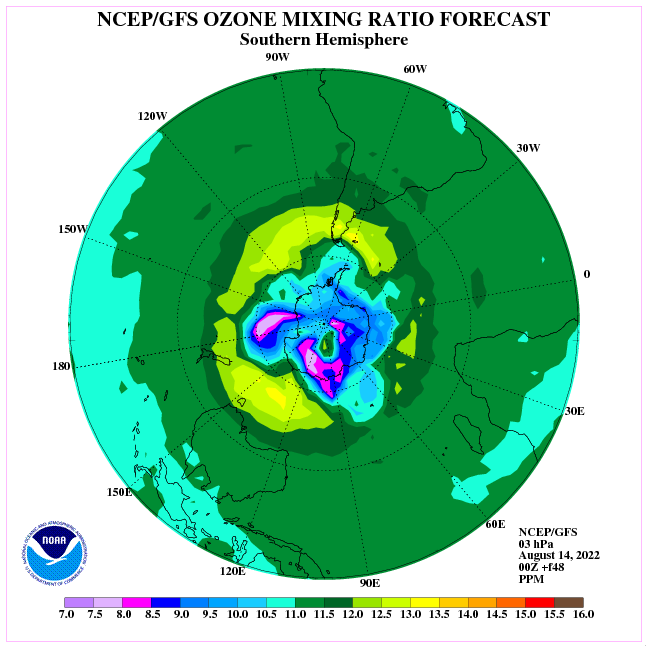 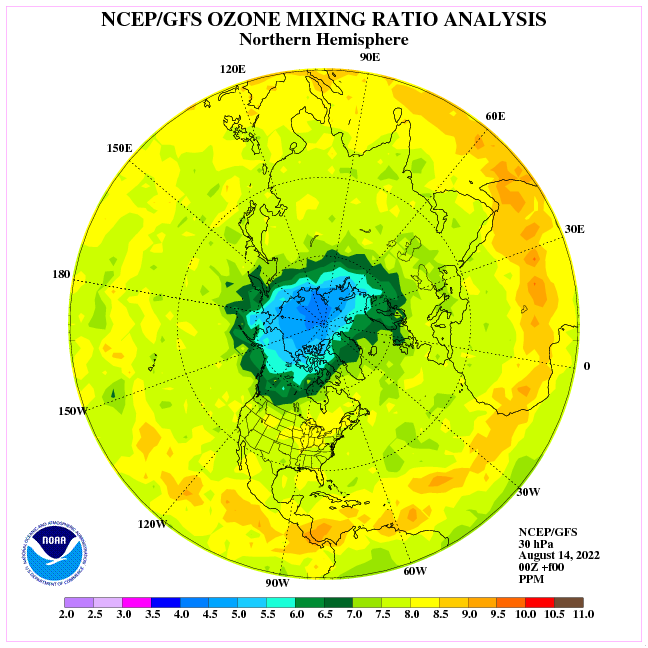 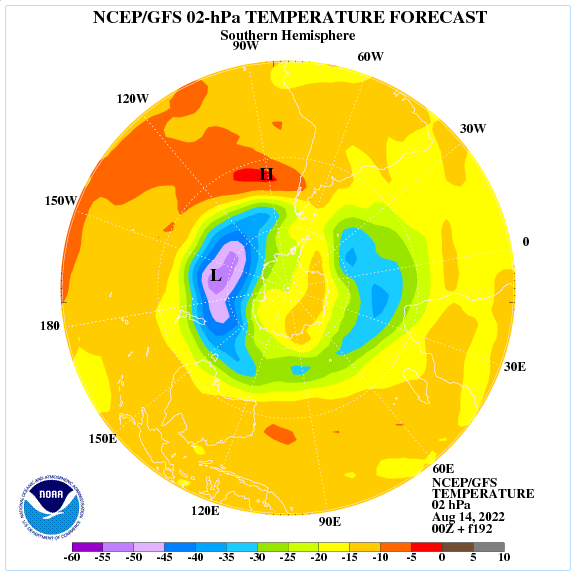 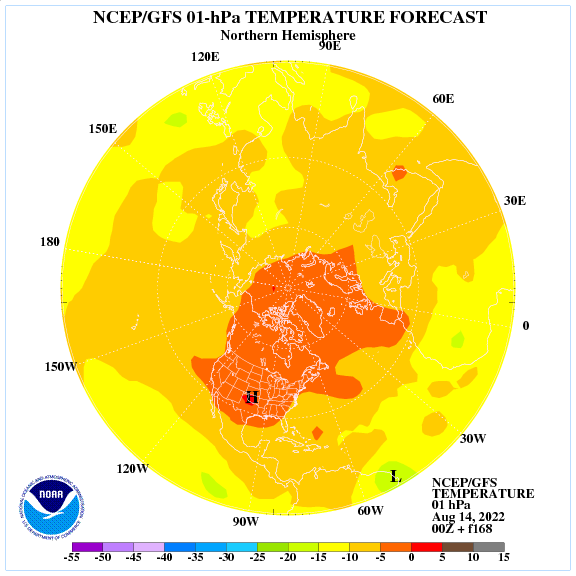 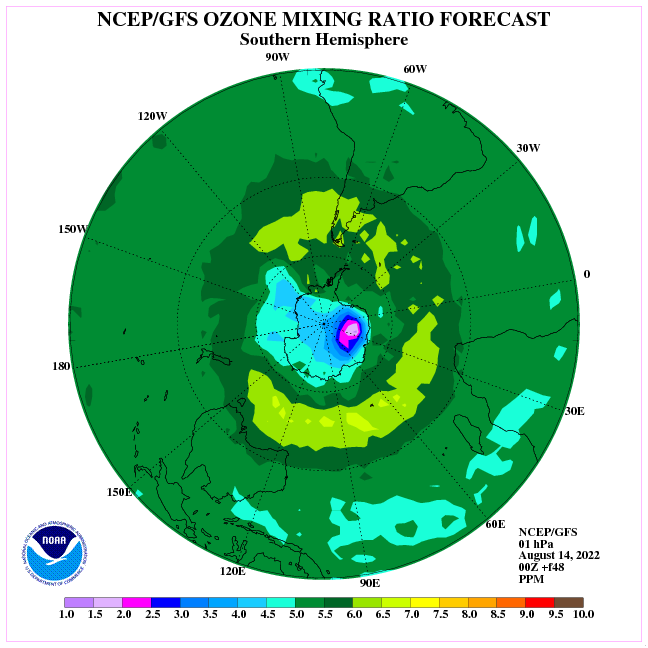 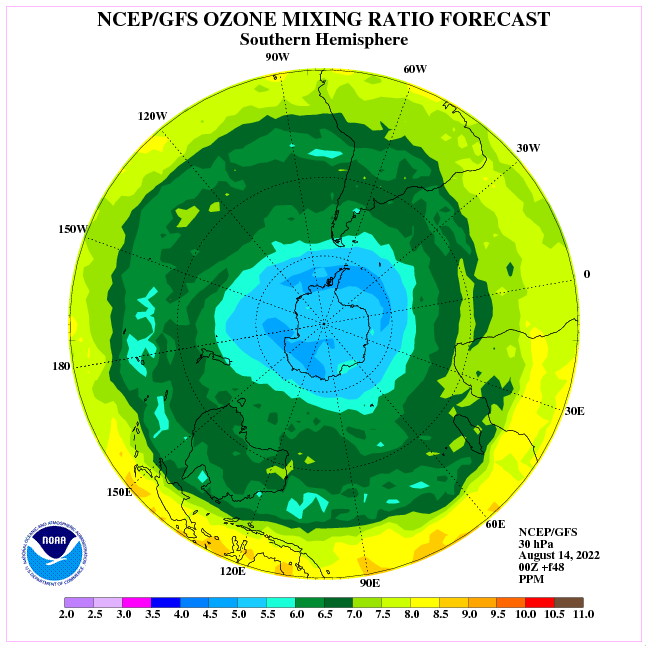 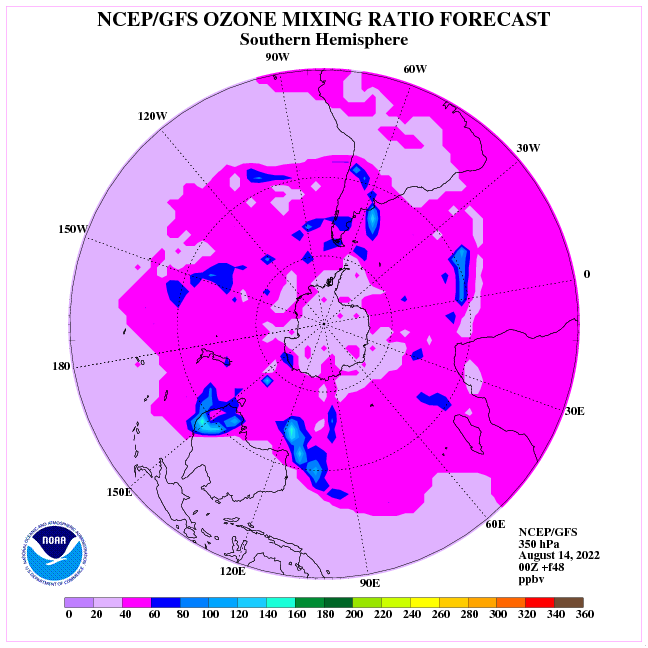 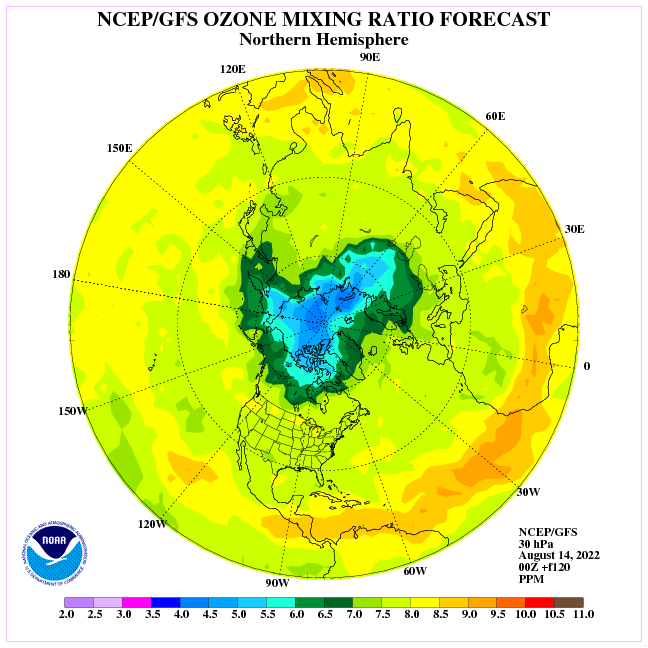 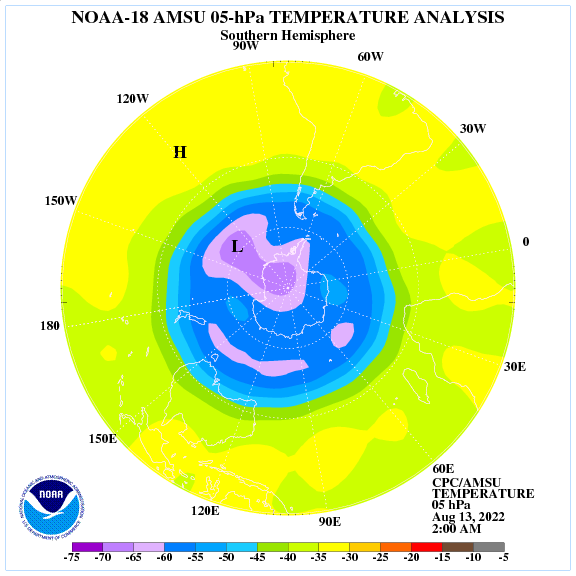 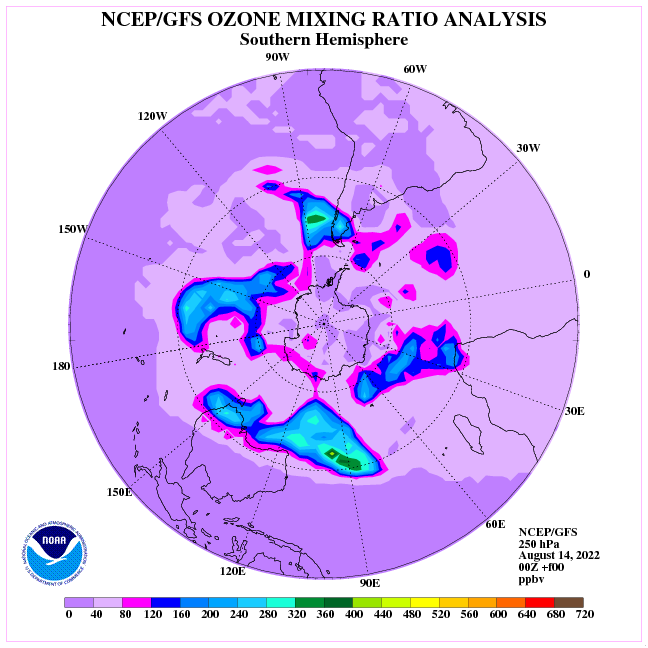 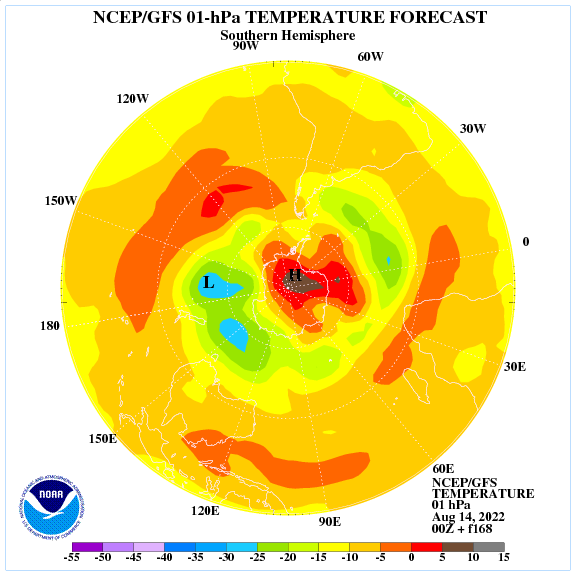 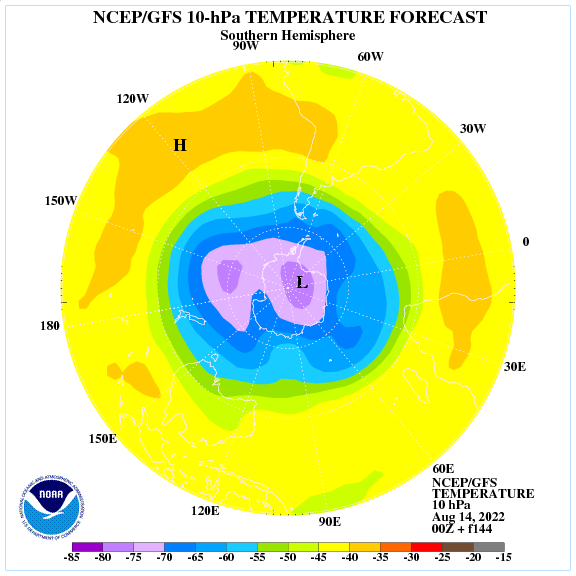 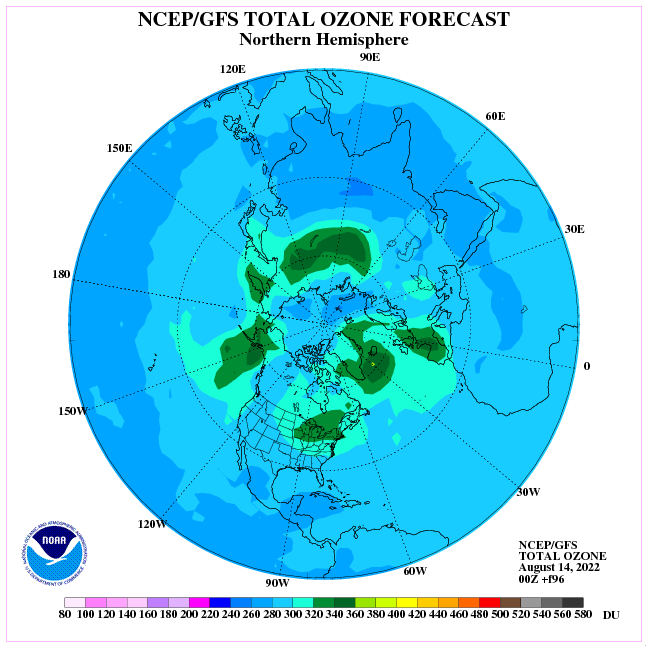 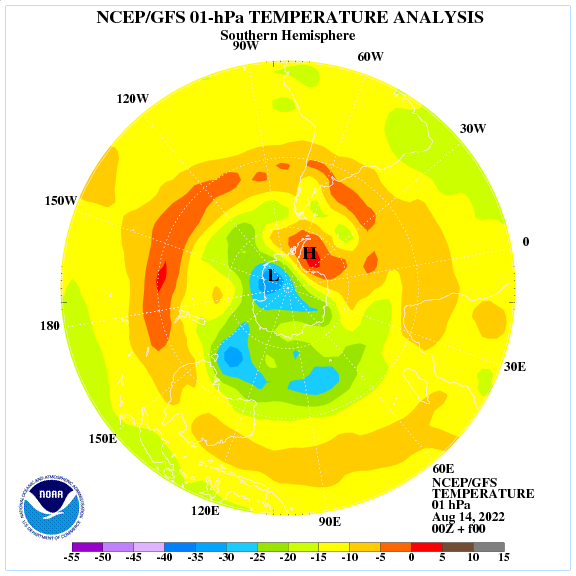 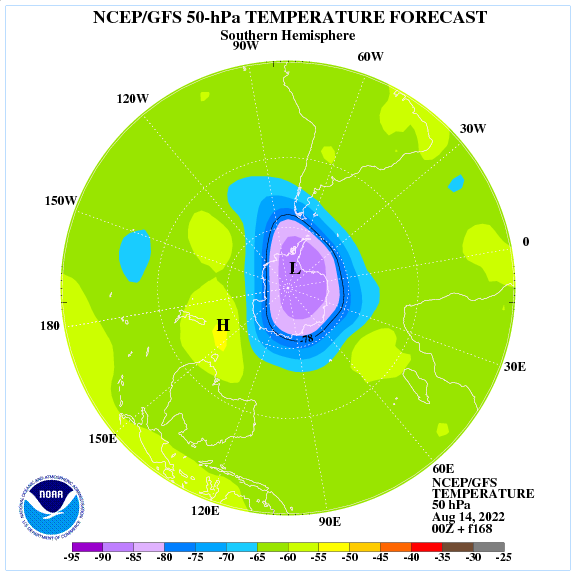 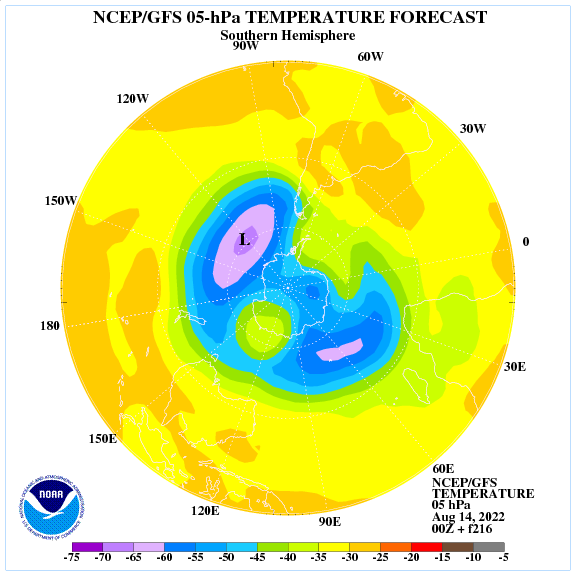 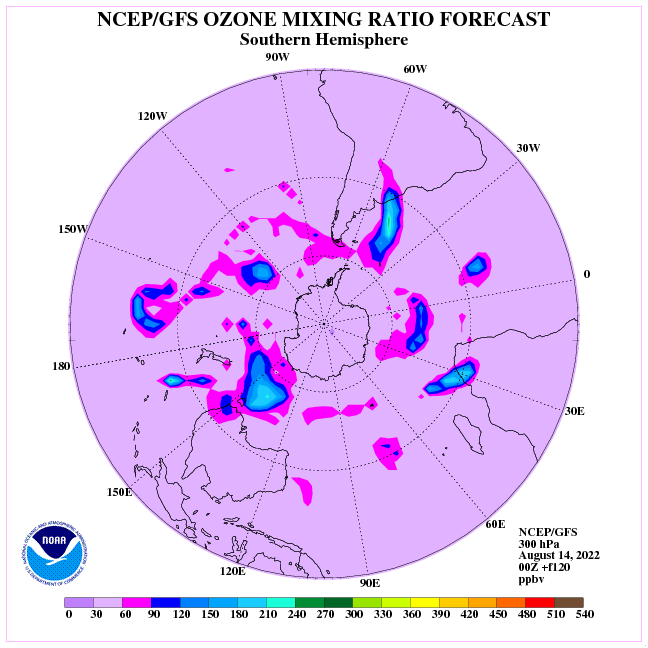 The NCEP Global Forecast System model (GFS, formally the AVN) stratospheric temperature, height, and total ozone analyses and forecasts are generated each day from the 00Z cycle at the levels: 70, 50, 30, 20, 10, 5, 2, and 1 hPa (approximately 18-45 km). 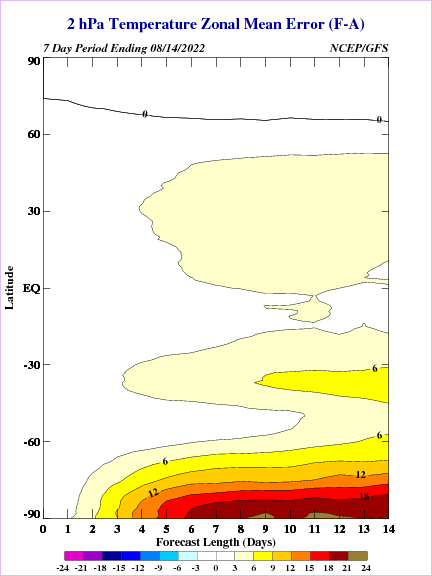 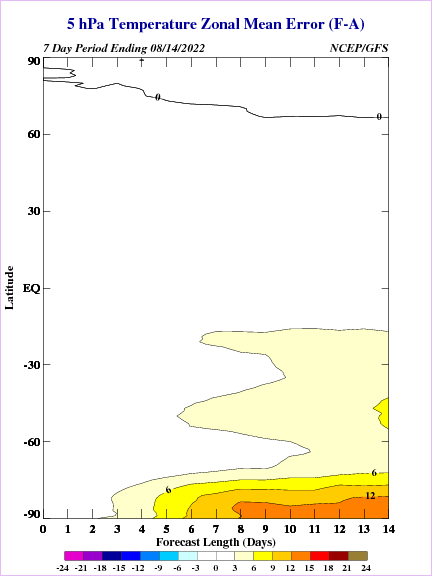 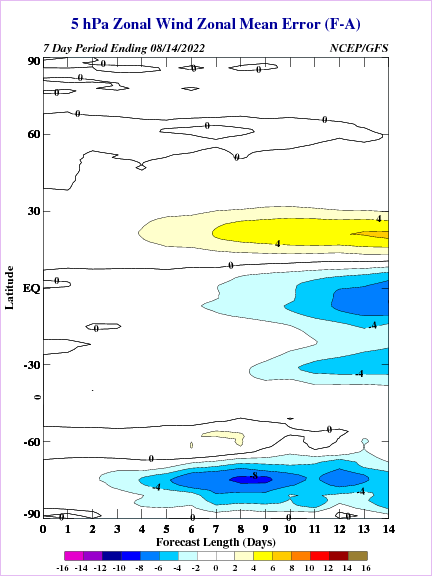 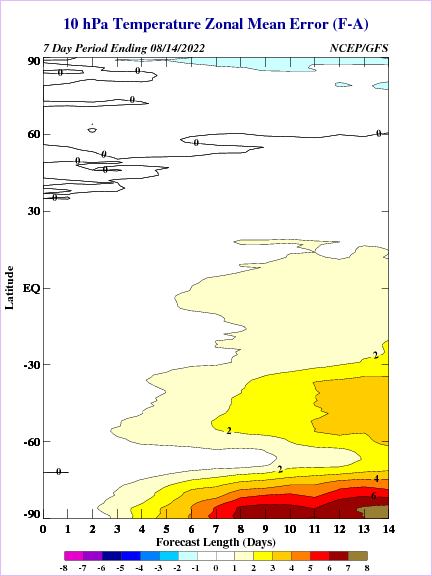 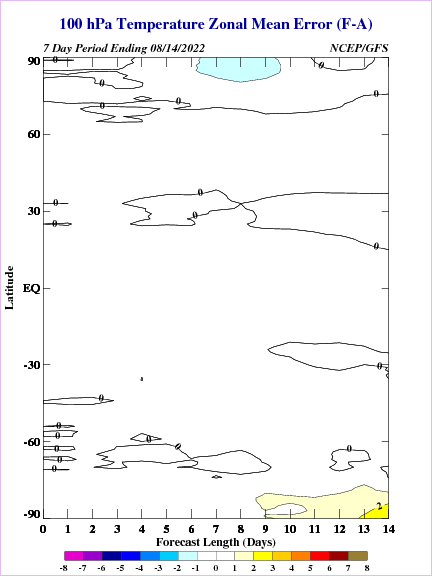 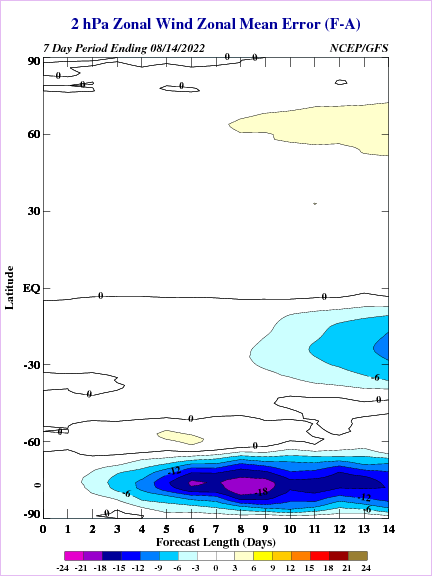 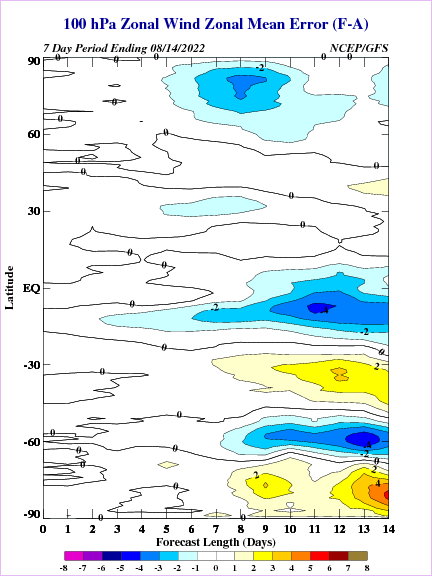 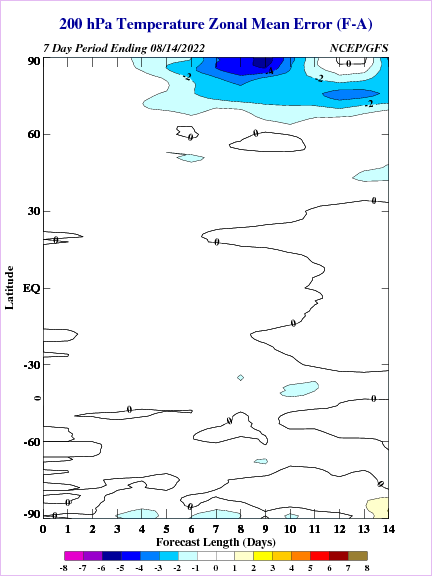 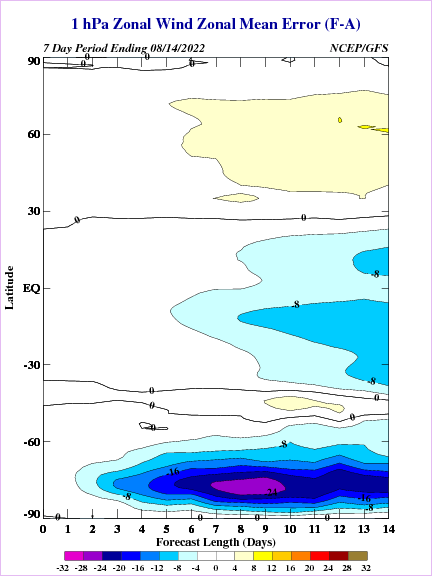 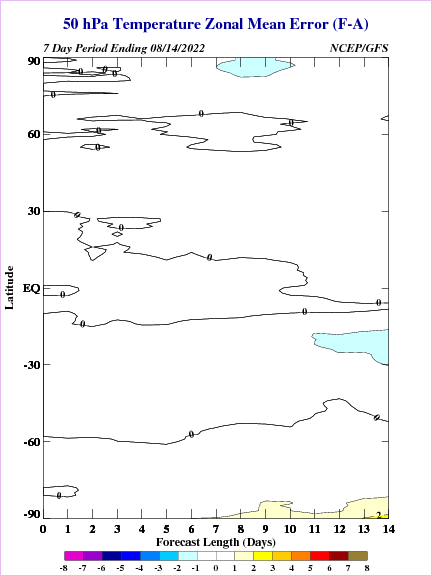 Below are contoured maps of the initial analyses (f00) and forecasts at 24 hour intervals out to 10 days (f240). 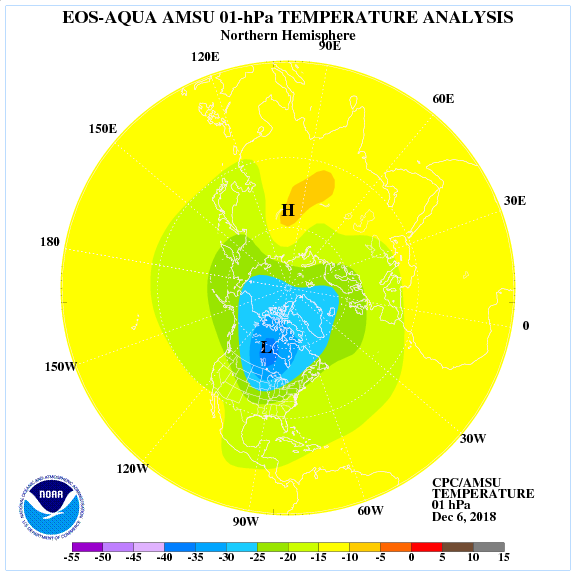 Additional information about the validity of the forecasts is given in the Forecast Error set of graphs for temperature and zonal wind for all pressure levels from 200 to 1 hPa.